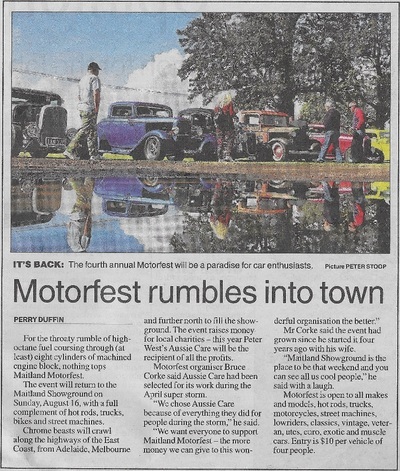 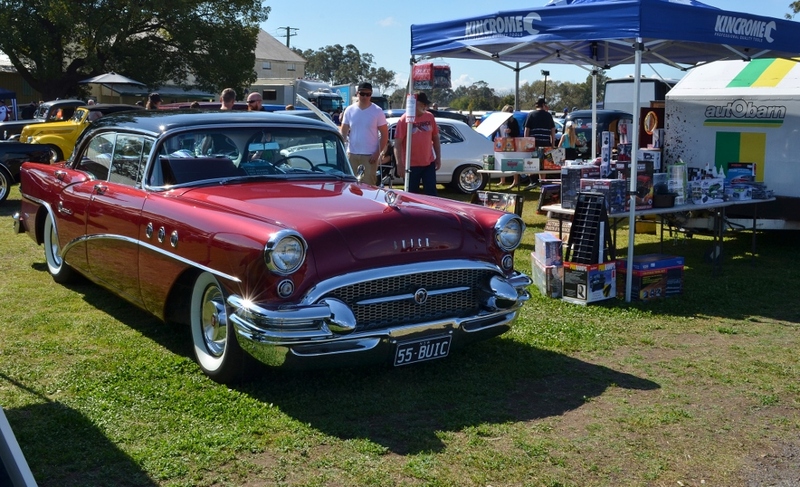 A bright sunny winters day saw about 200 cars and bikes turn up to Maitland Motorfest who donate any profits to the charity Aussie Care. 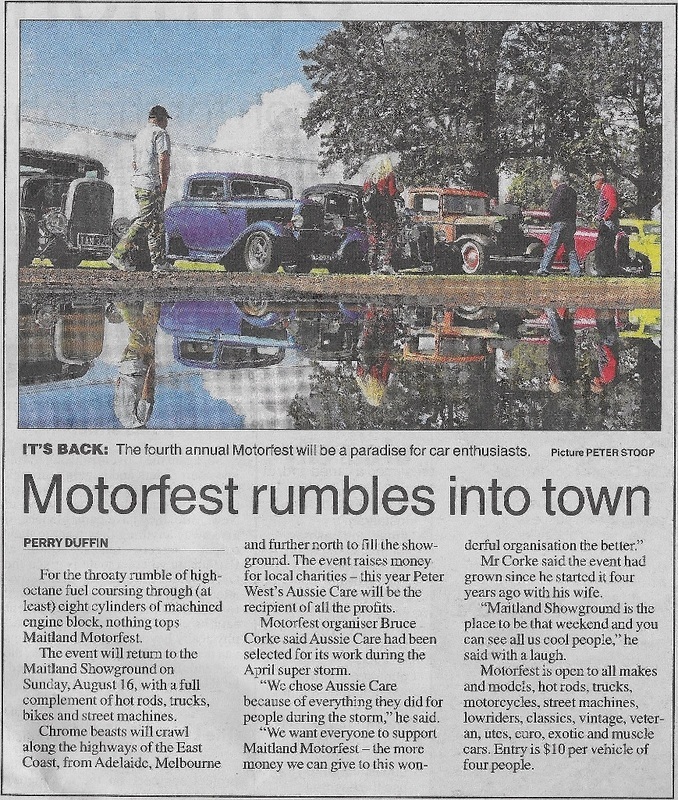 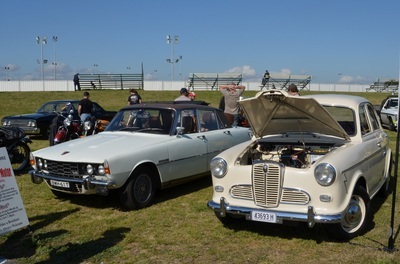 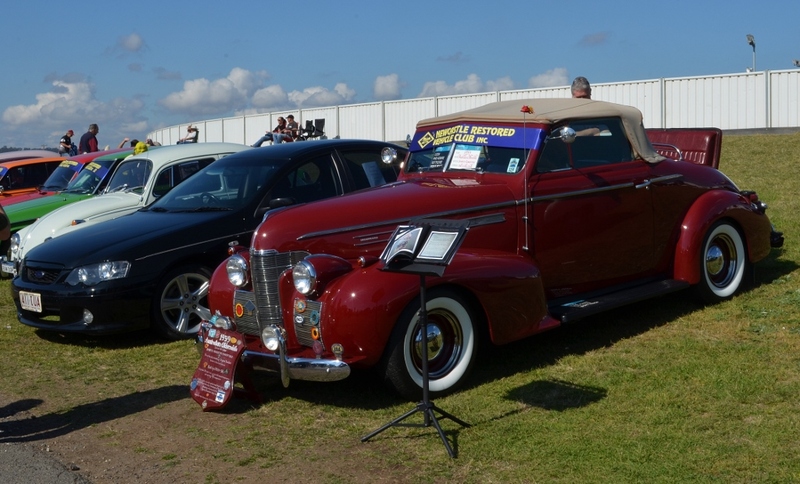 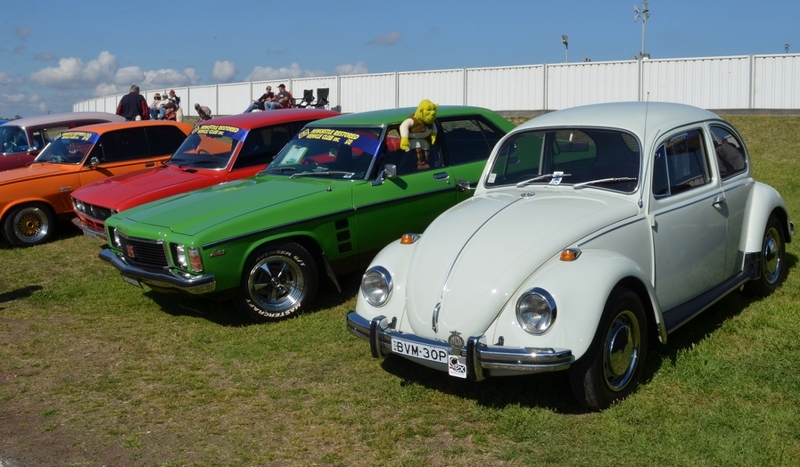 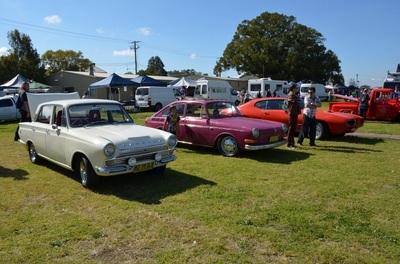 This show appears to be growing in numbers each year and being in winter gives car enthusiasts a show to attend before the busy spring and summer period. 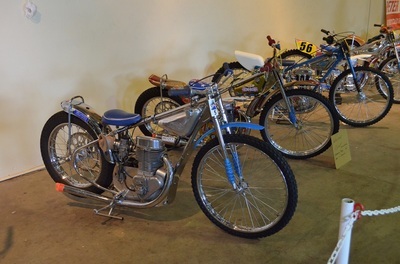 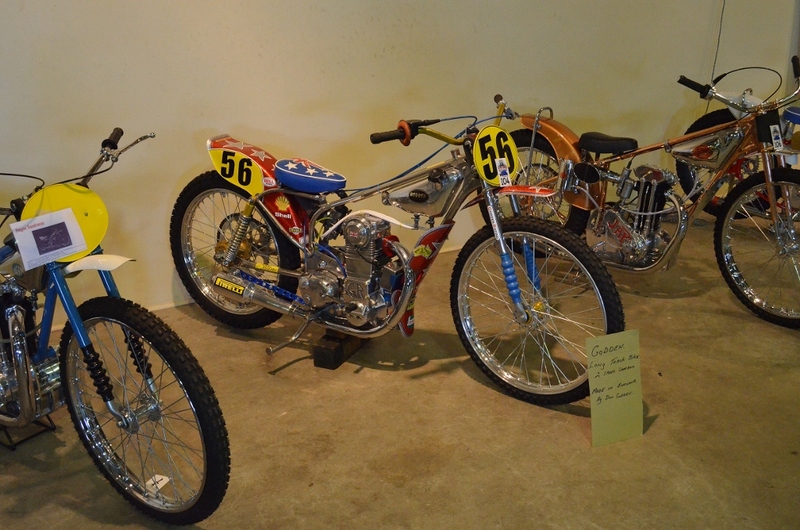 There were plenty of trophies given out at presentation with Noel winning best pickup and the Rat Fink trophy while Dan, Bob and Ian won the three Hot Rod Trophies. 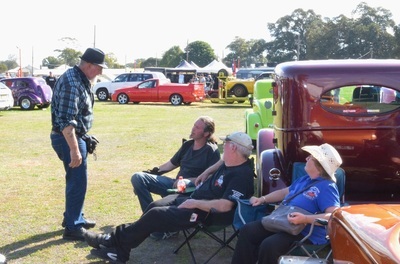 A very good day and we will be back again next year. 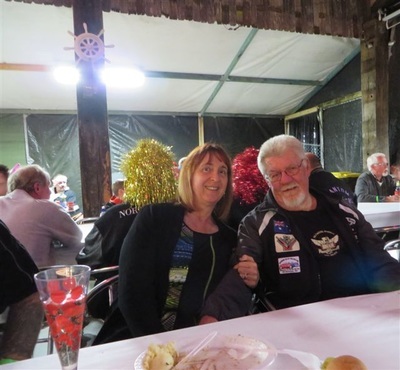 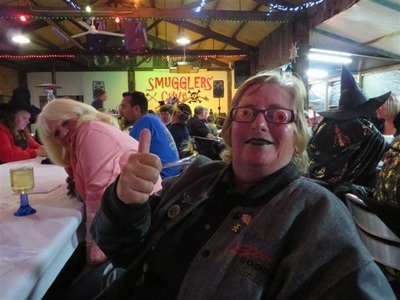 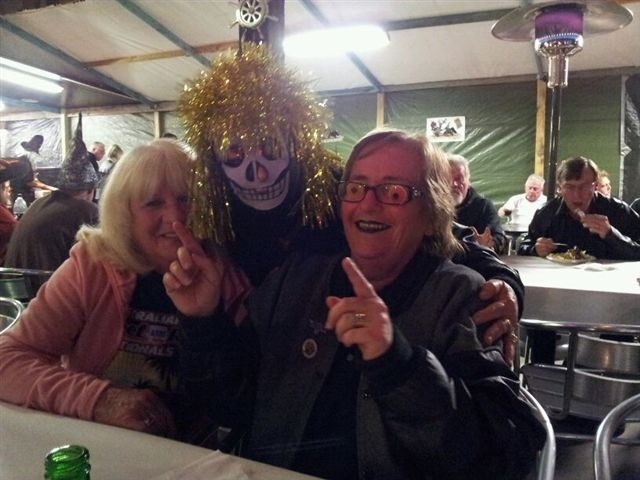 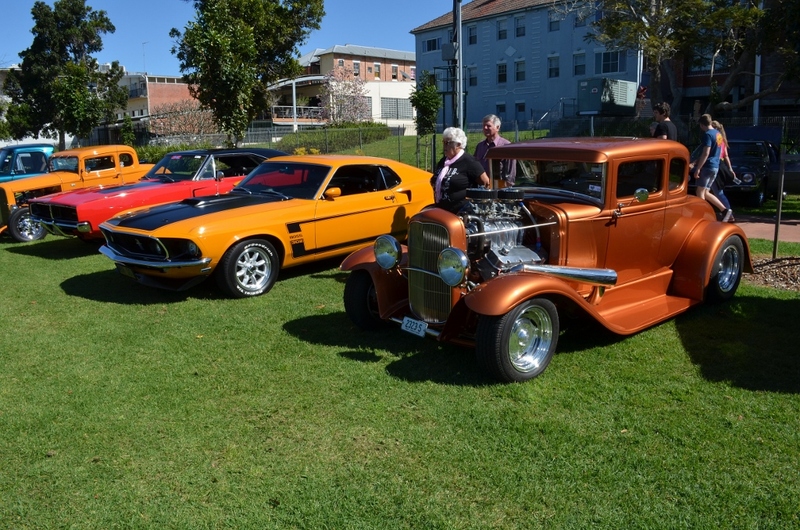 Manning Valley Cruizers' Mountains to the Sea run at Forster was their 13th anniversary and they celebrated with a Halloween themed weekend. The format was the same as last year with the meet and greet on Friday night, car show Saturday morning and the dinner on Saturday night. 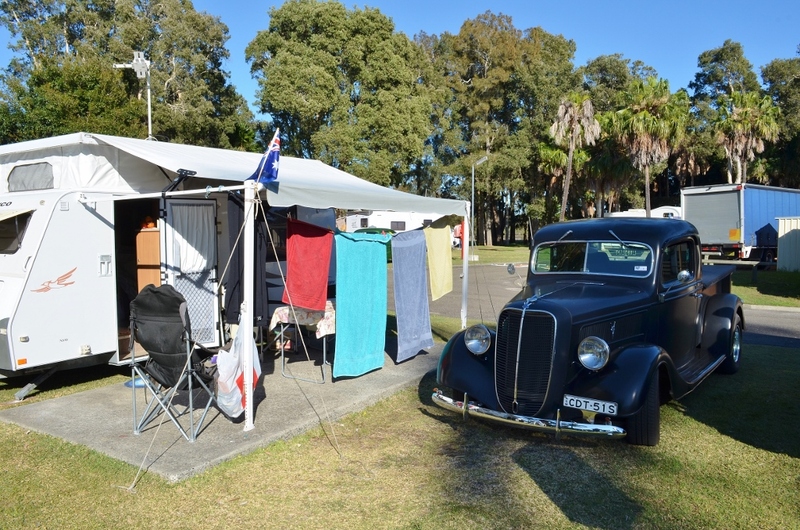 They had good music on both nights and supplied breakfast on Saturday and Sunday morning. 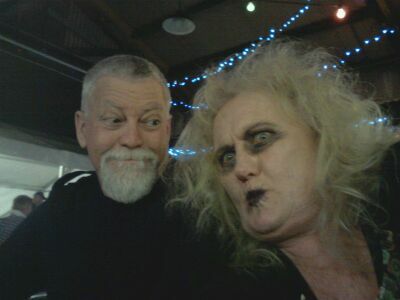 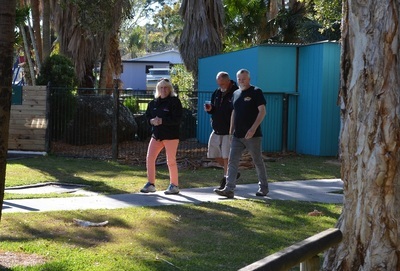 On the Sunday for those that stay barefoot bowls was on again at Blackhead Bowling Club. 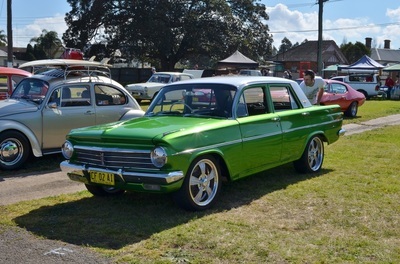 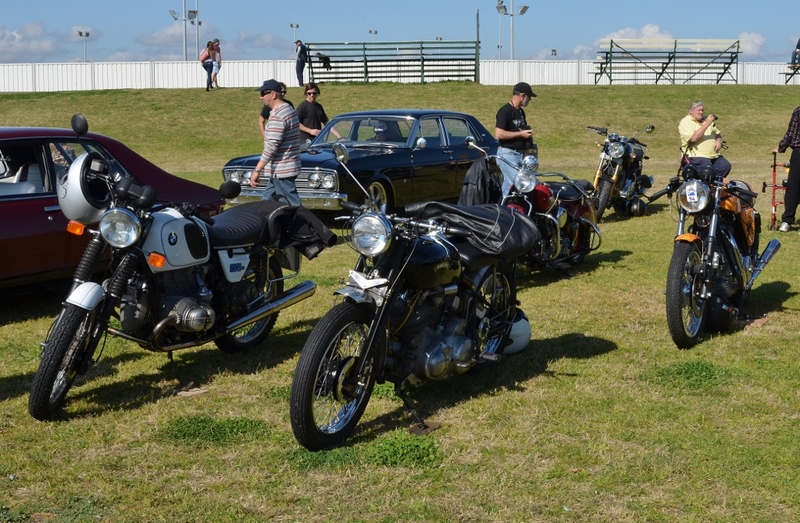 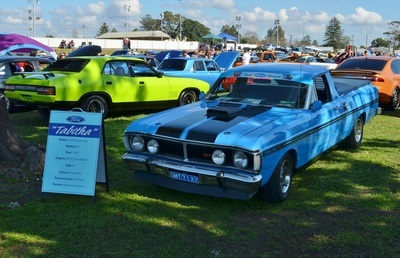 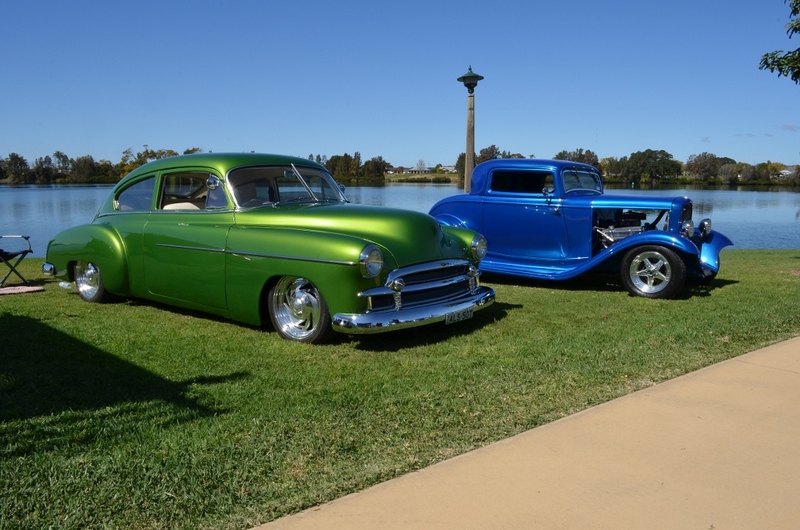 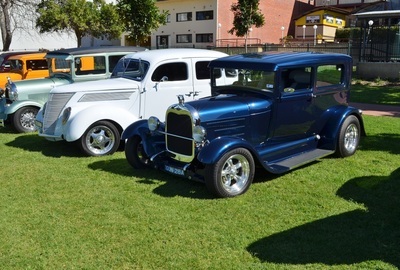 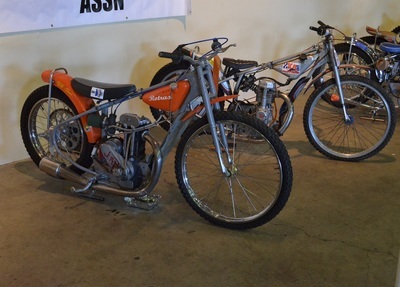 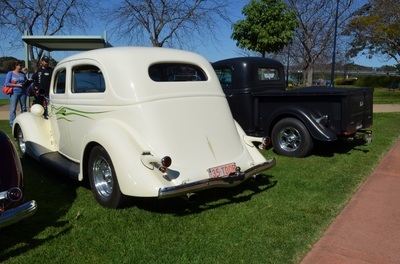 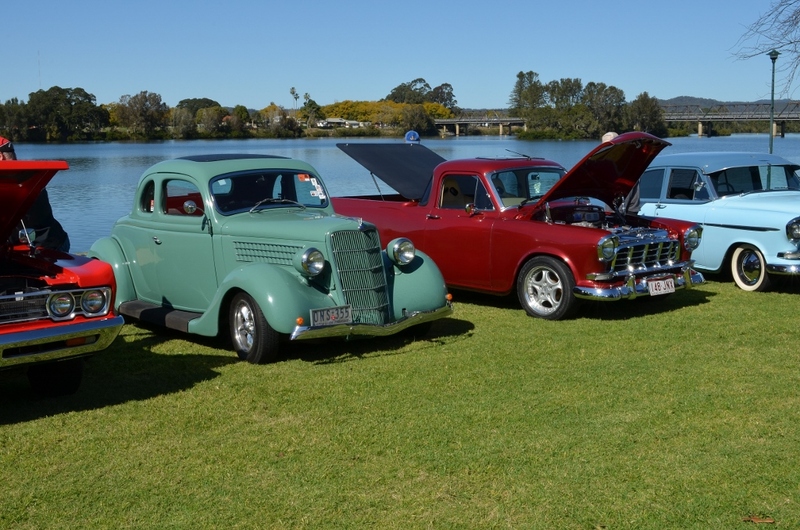 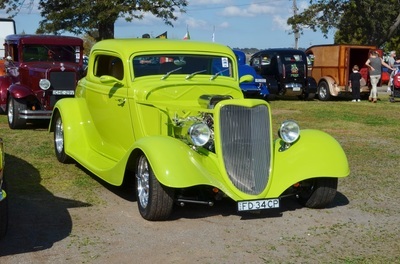 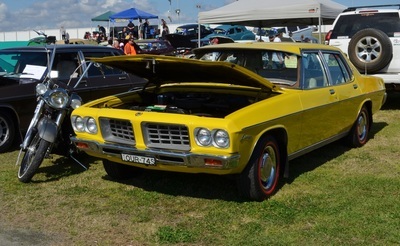 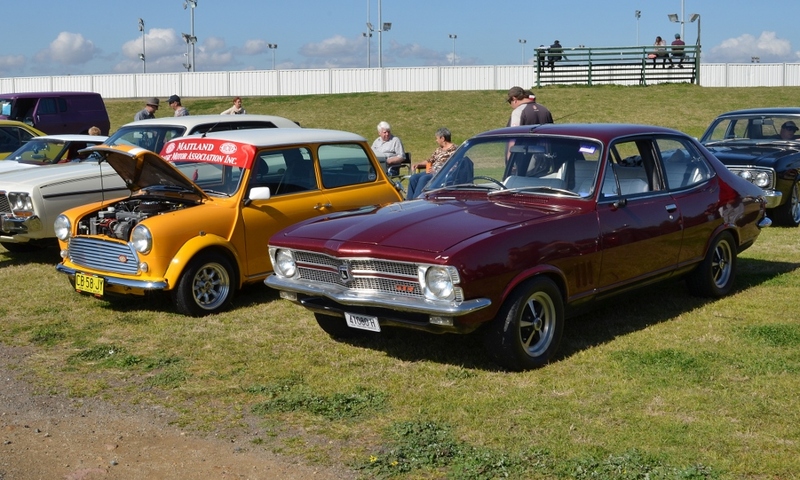 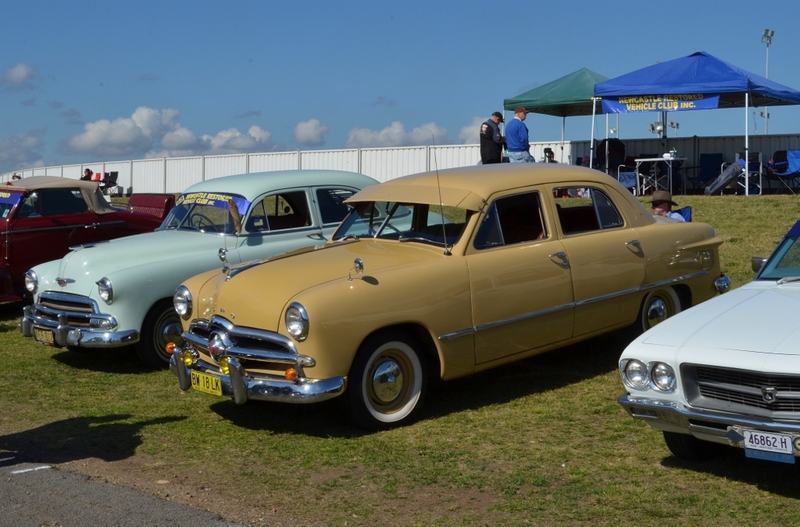 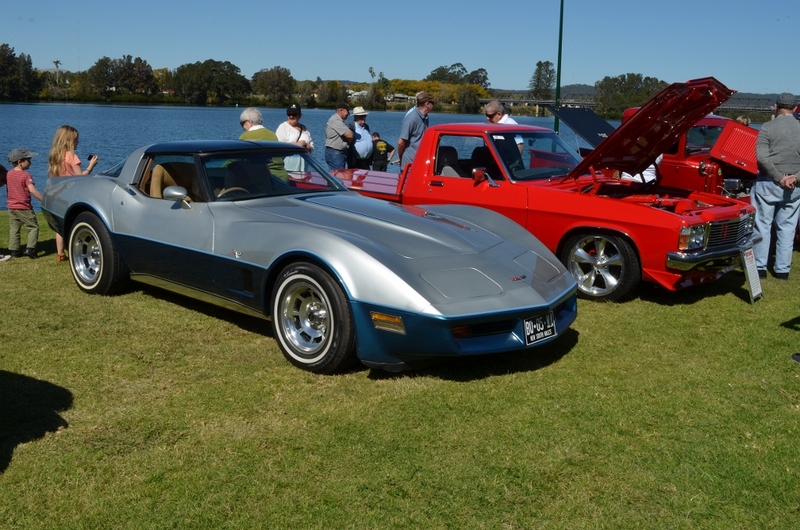 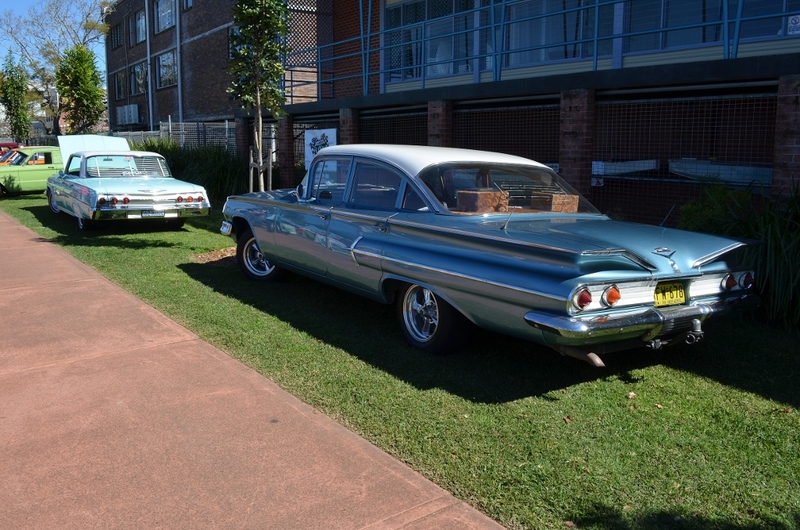 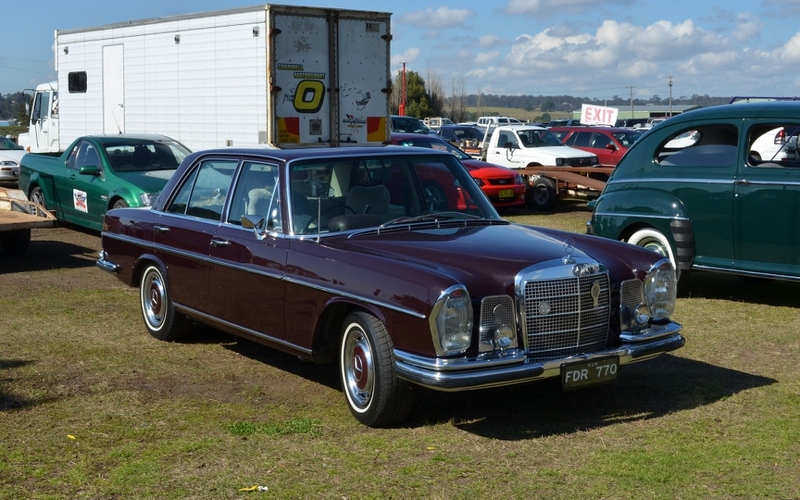 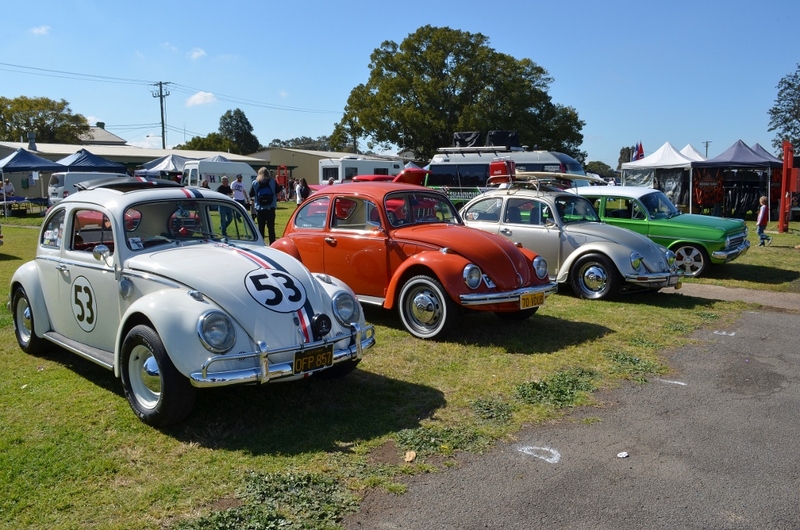 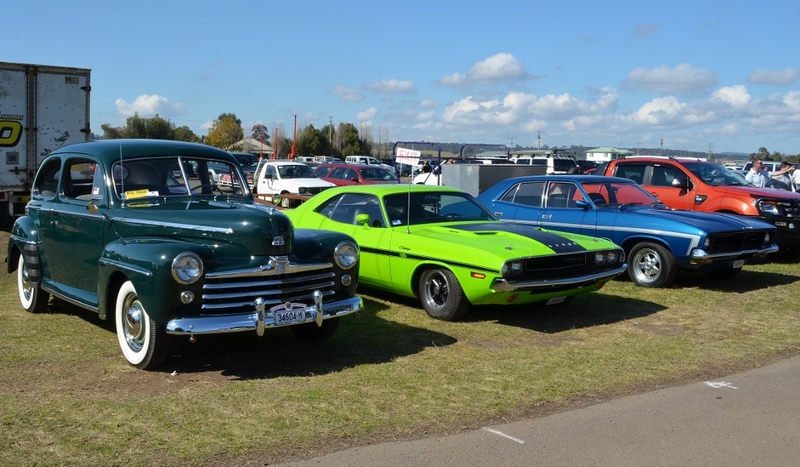 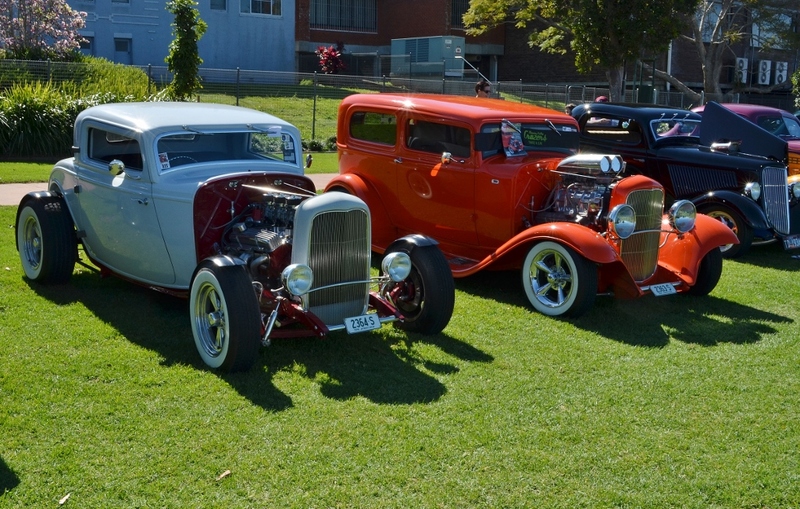 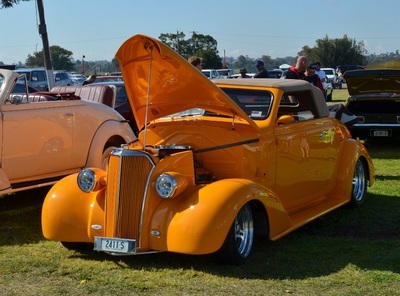 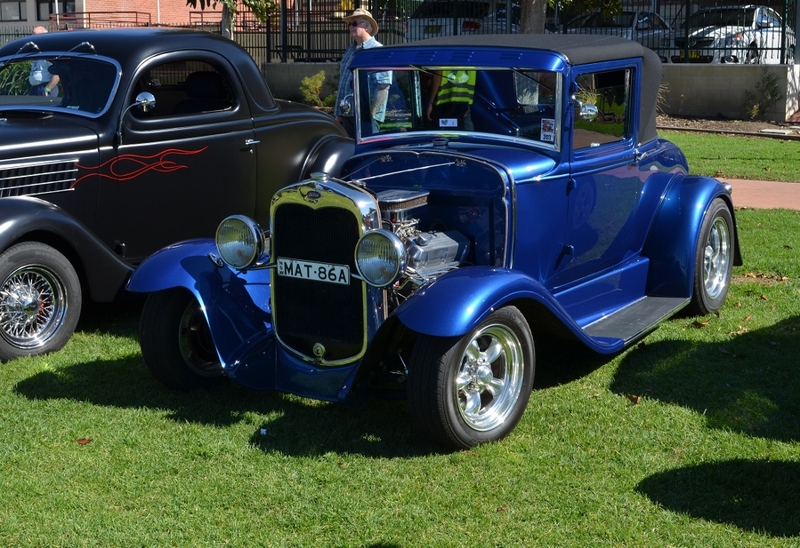 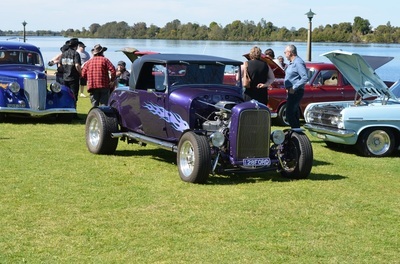 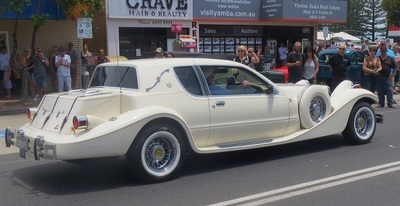 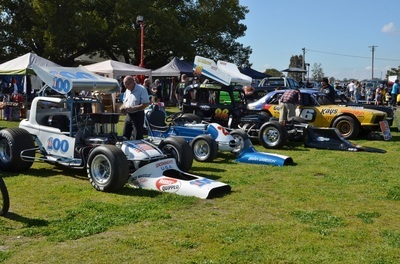 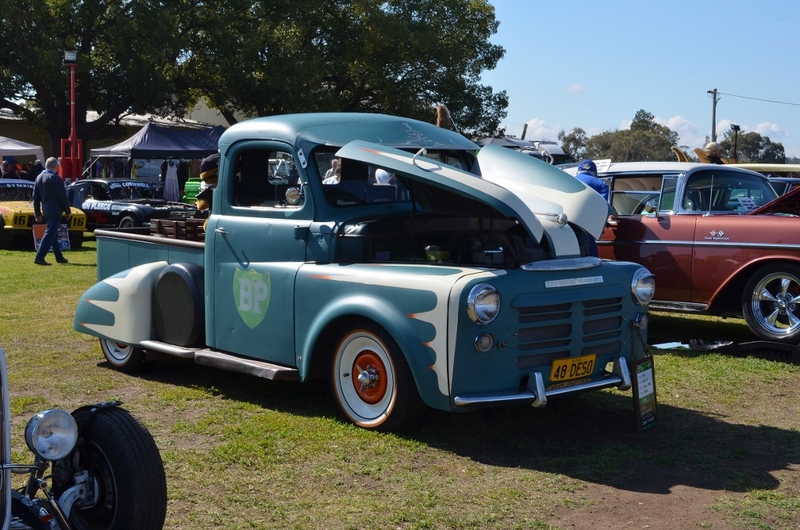 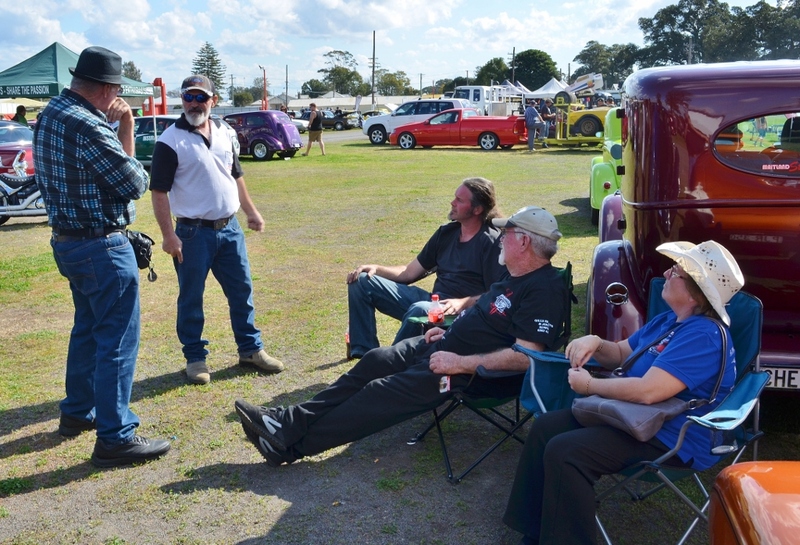 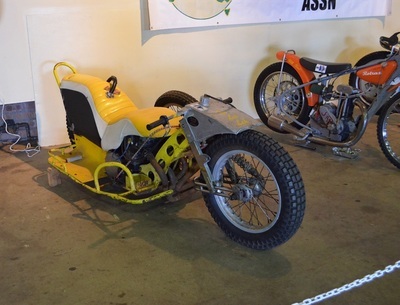 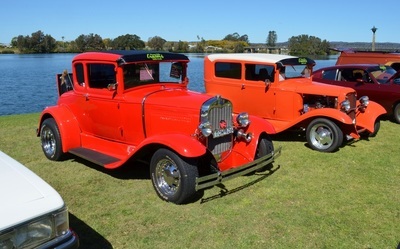 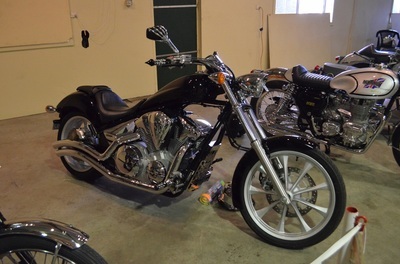 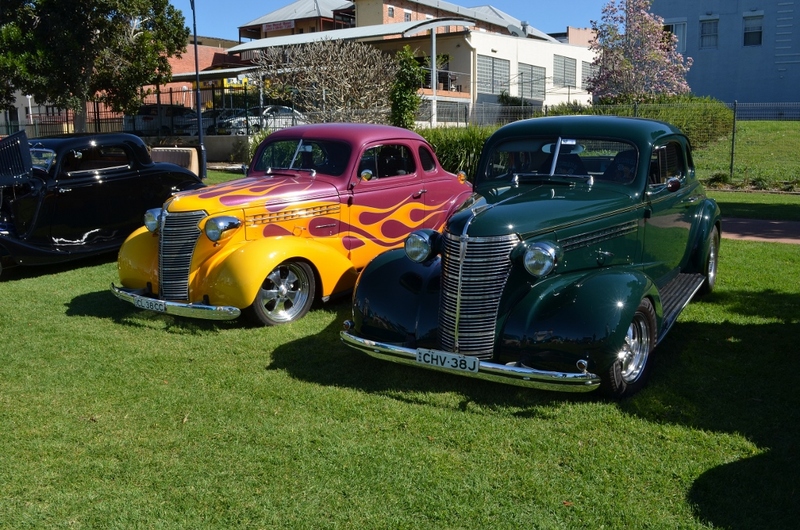 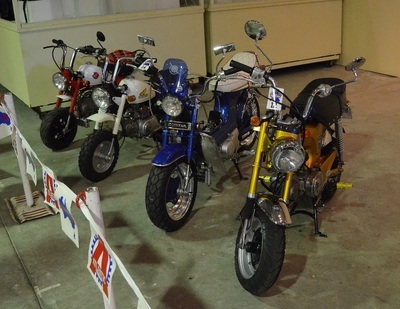 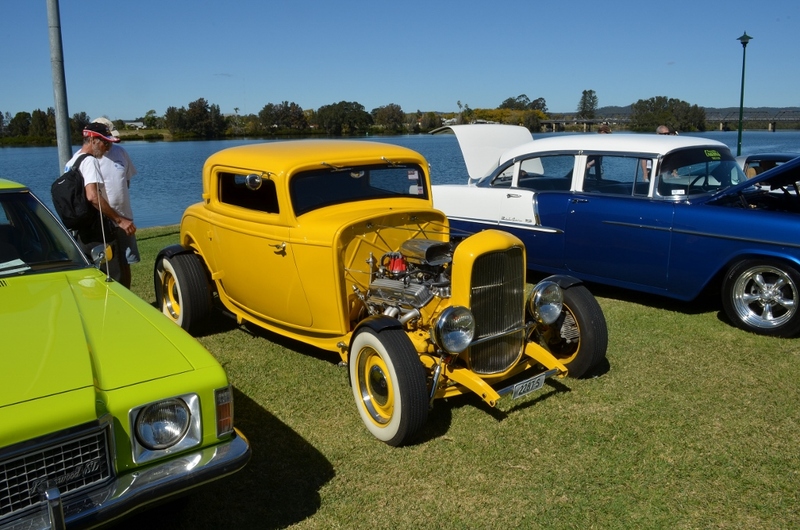 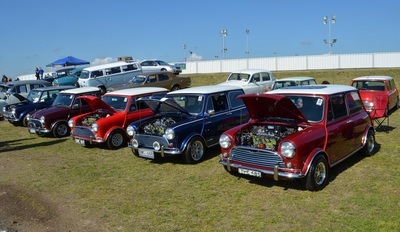 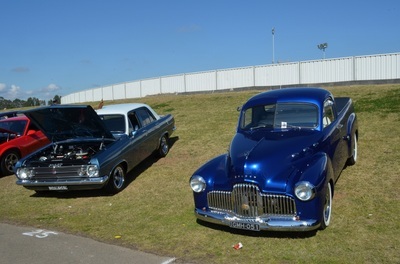 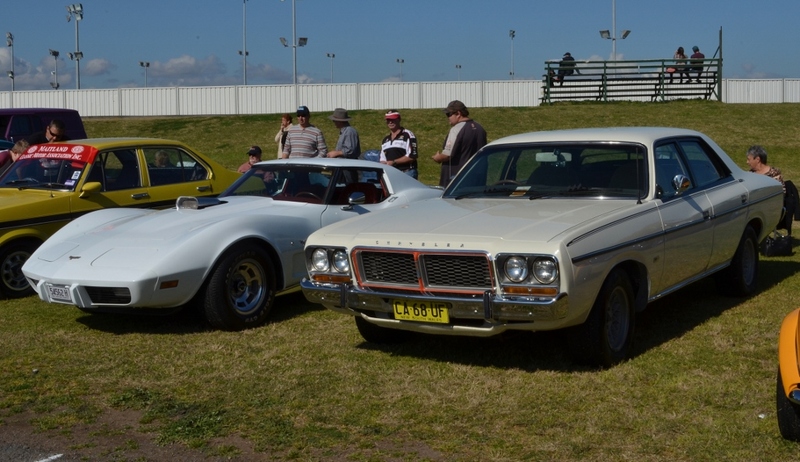 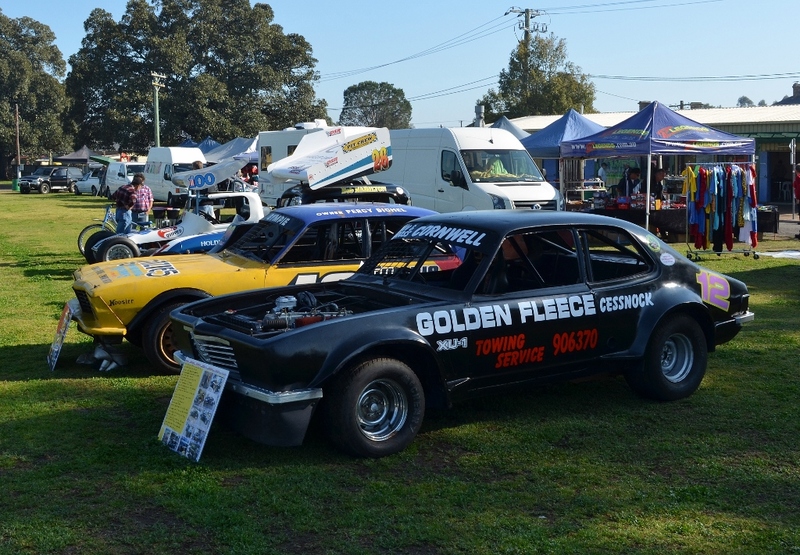 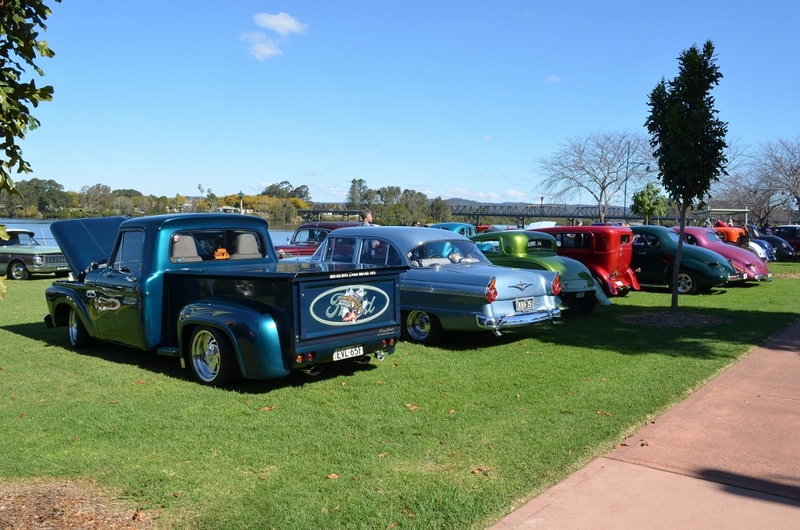 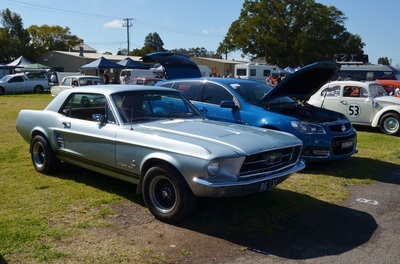 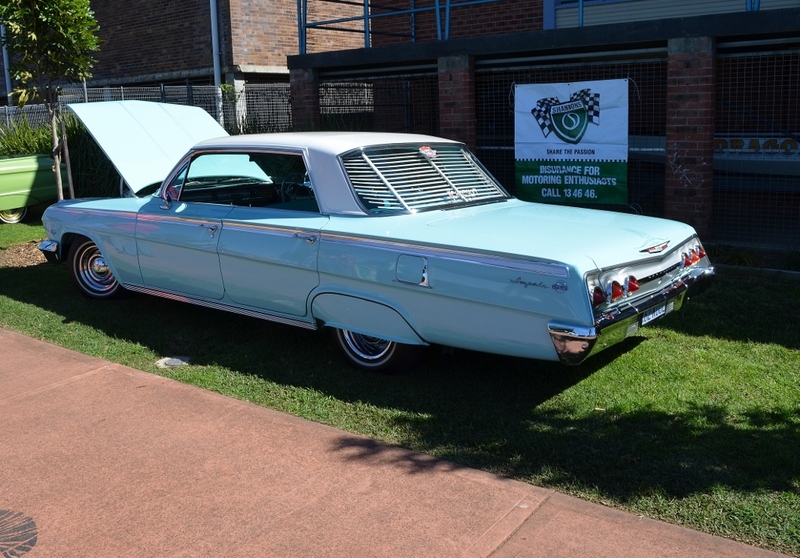 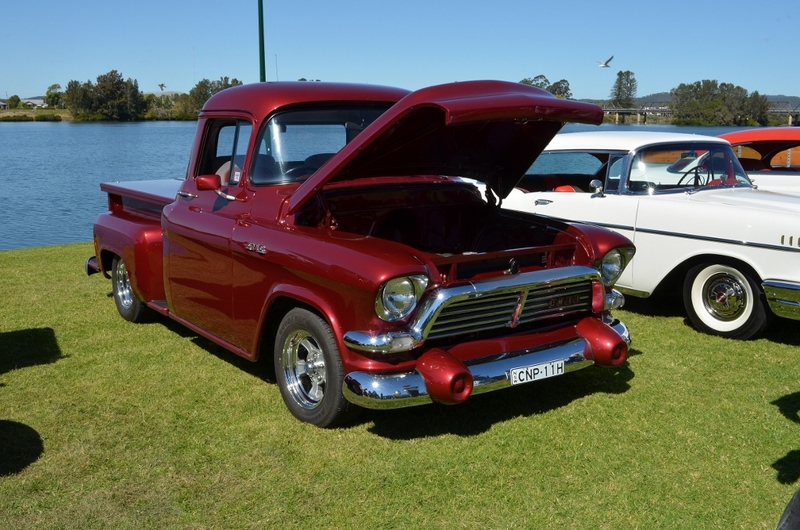 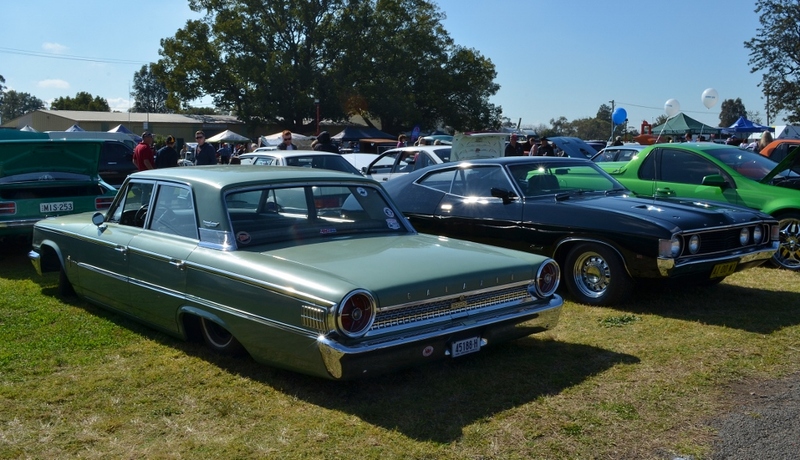 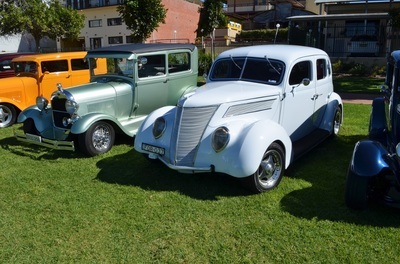 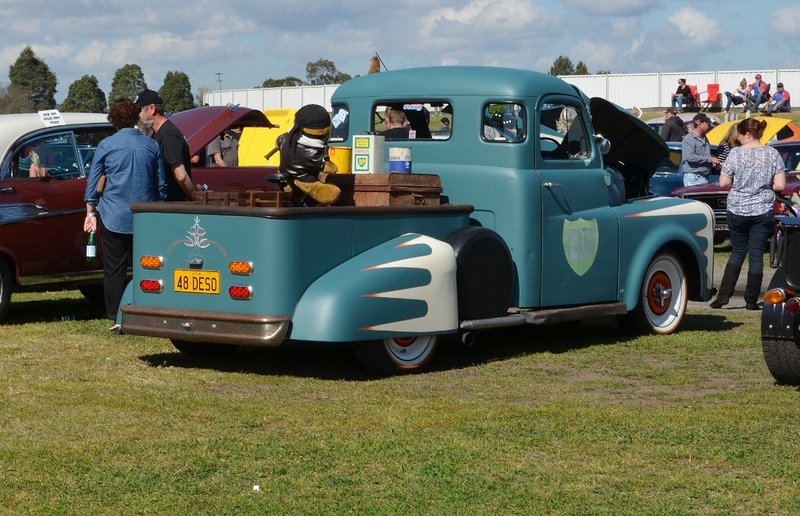 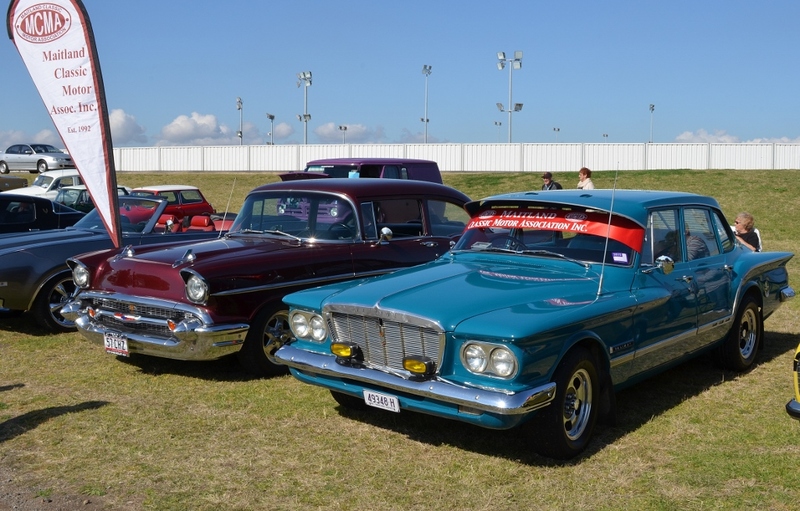 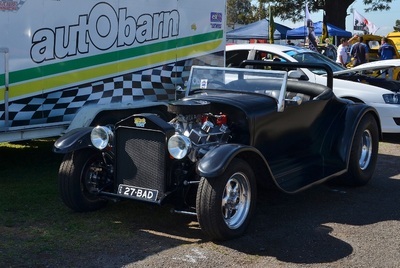 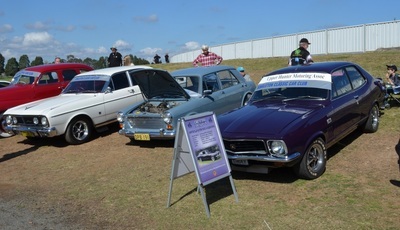 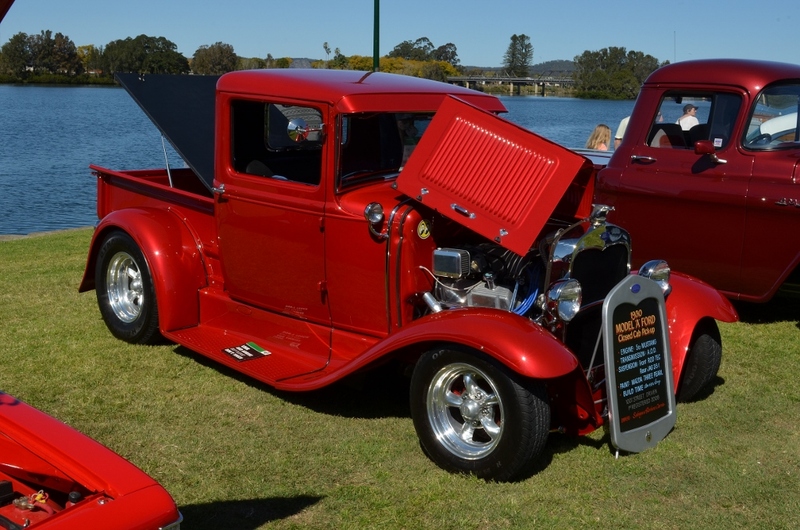 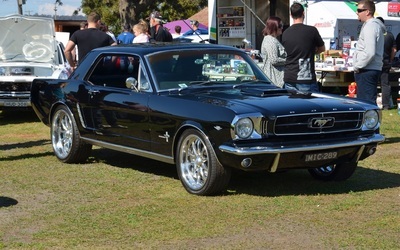 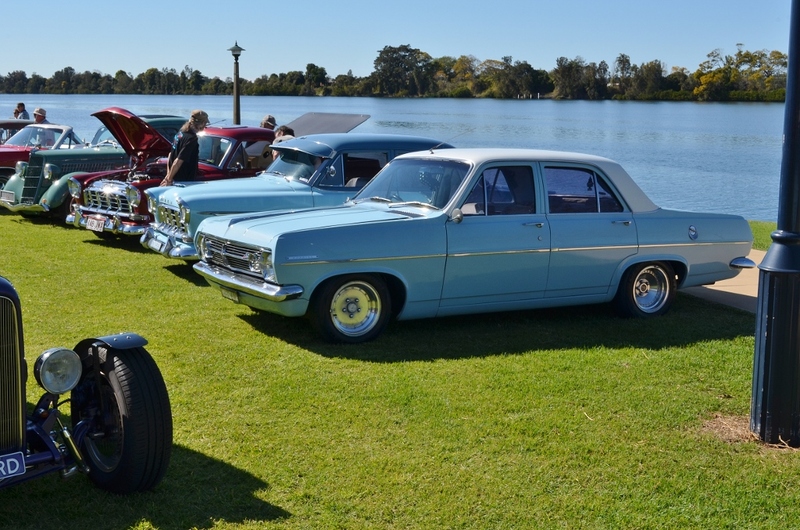 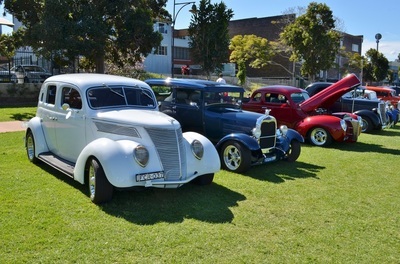 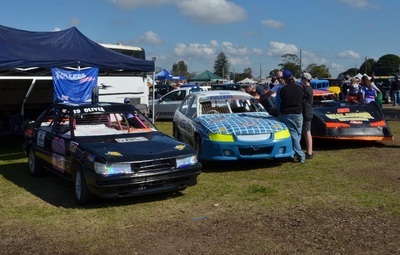 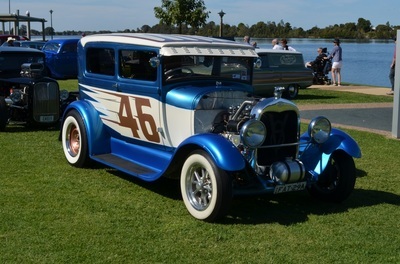 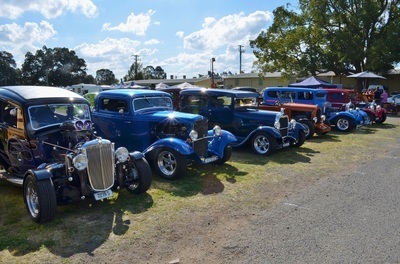 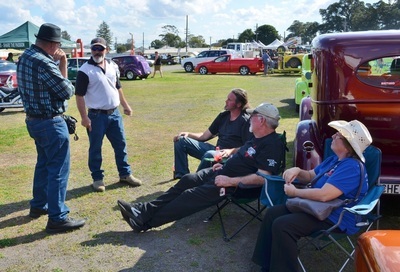 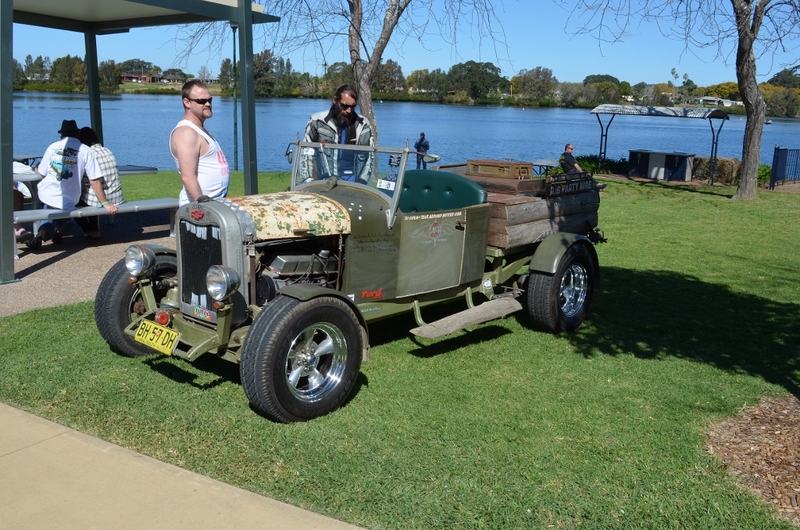 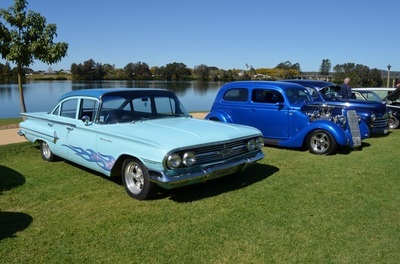 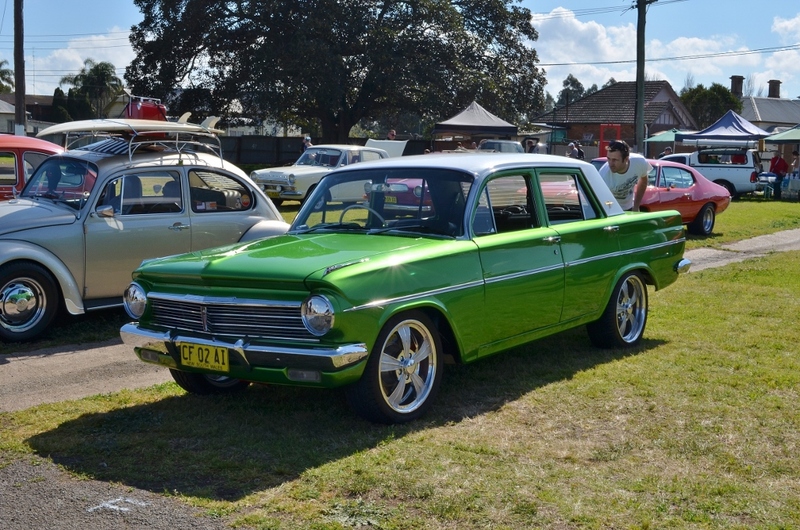 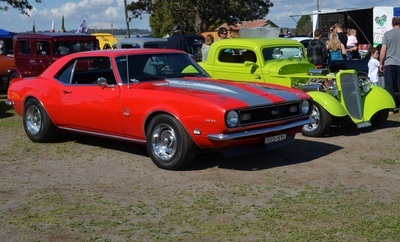 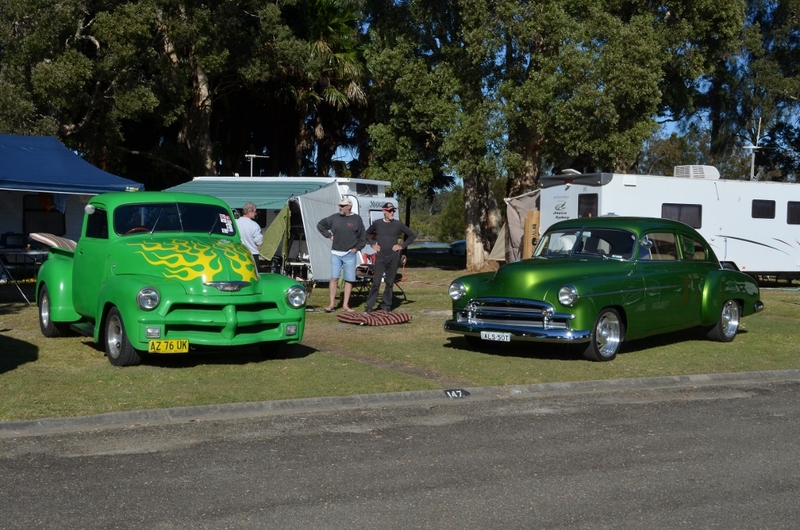 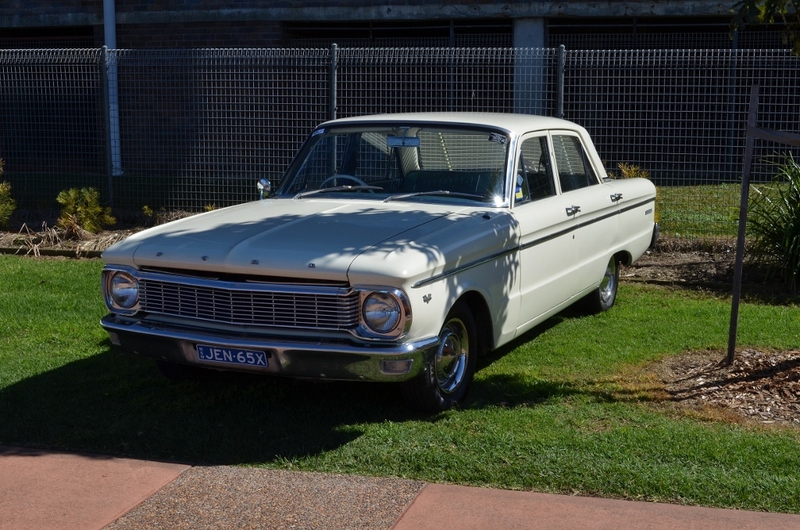 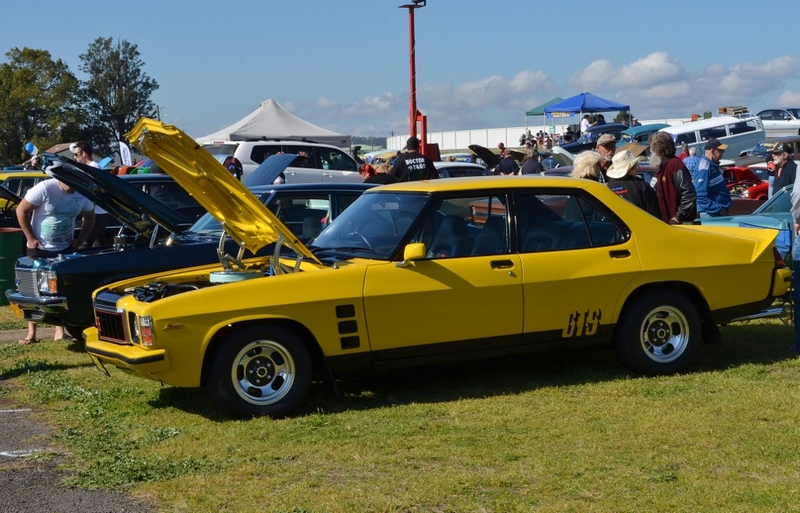 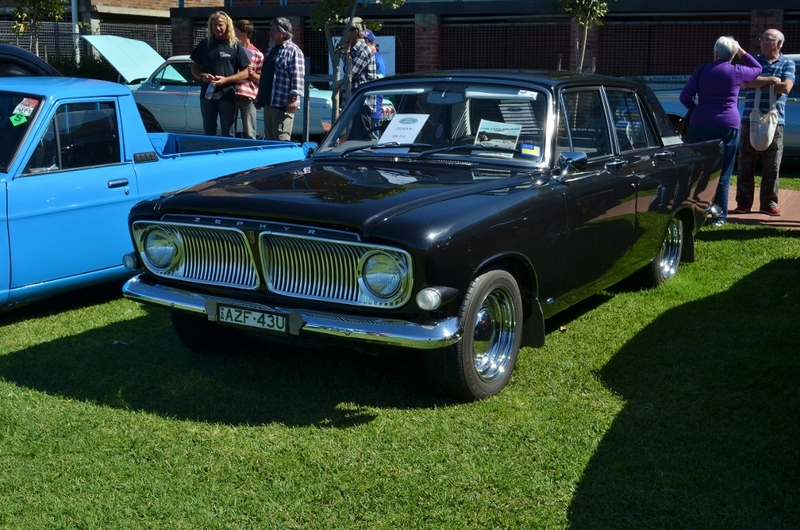 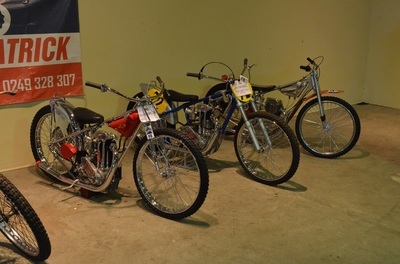 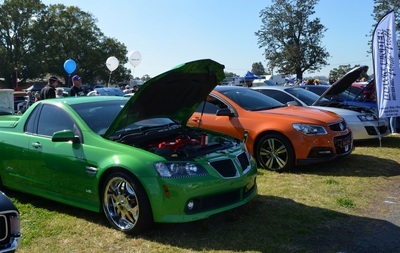 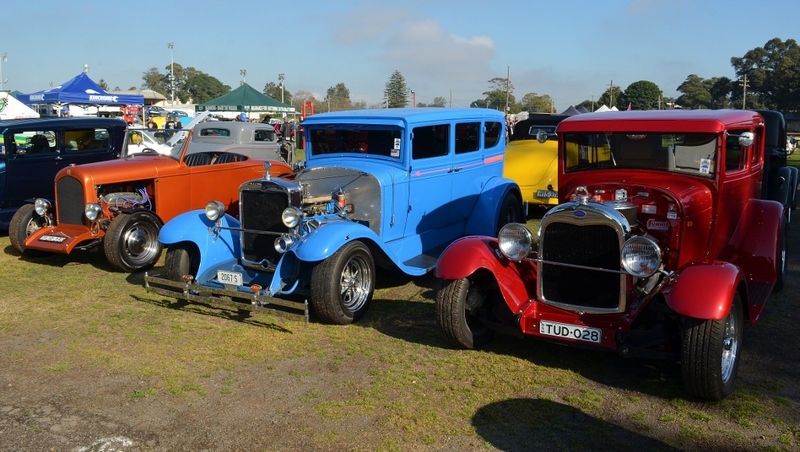 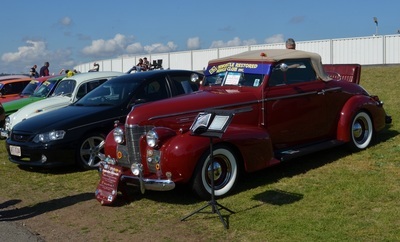 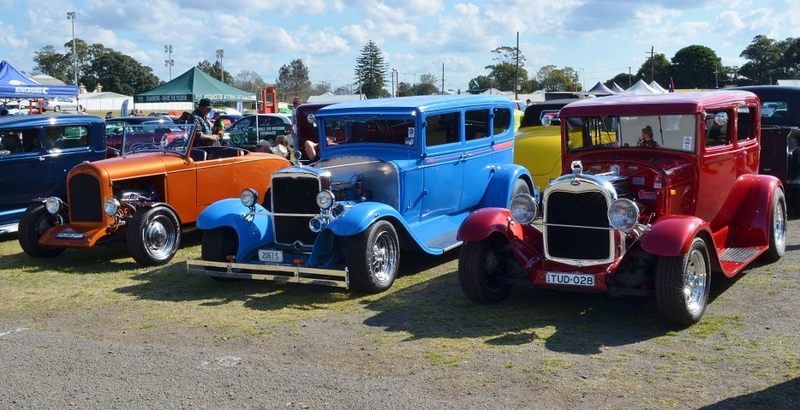 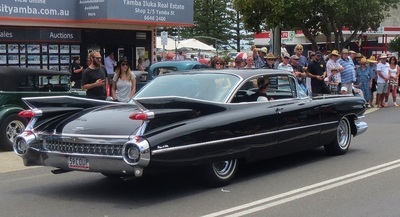 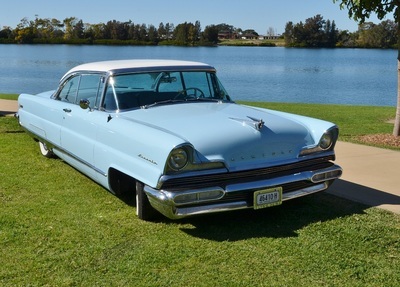 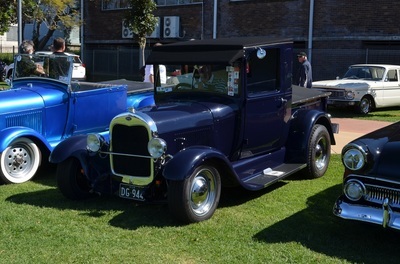 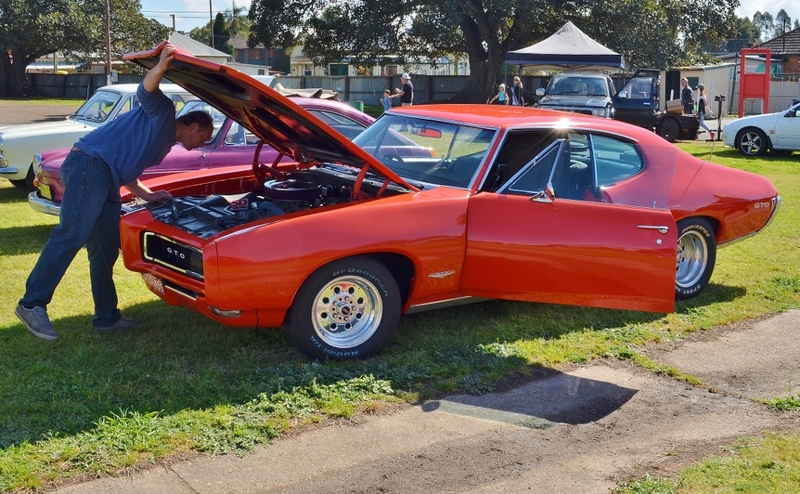 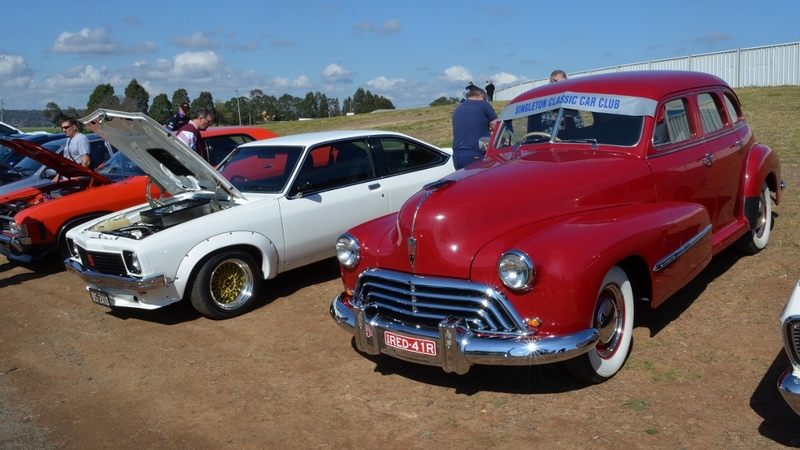 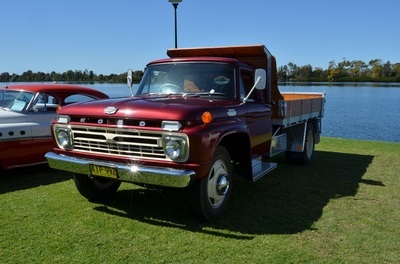 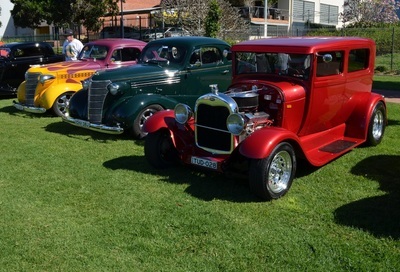 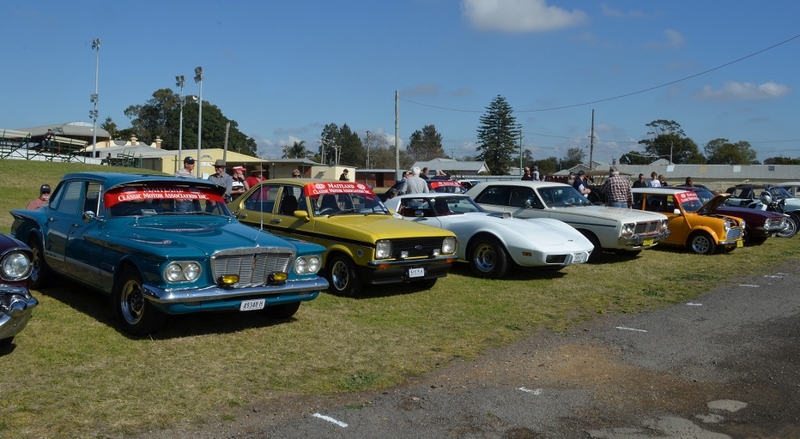 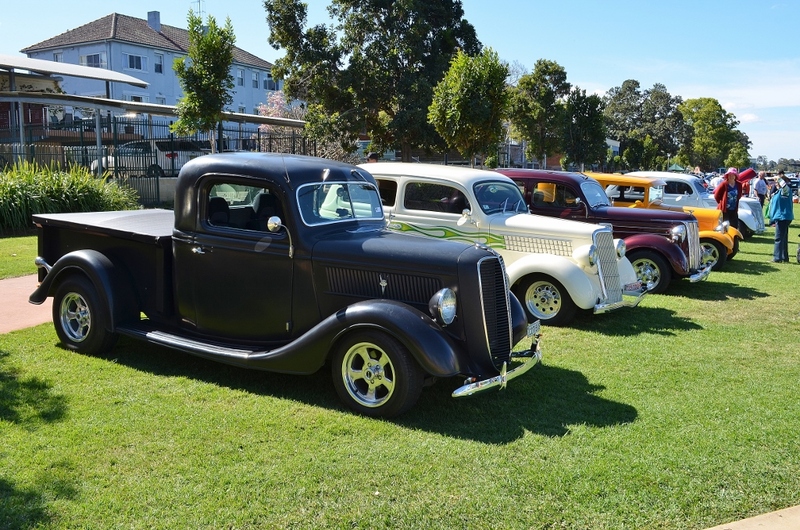 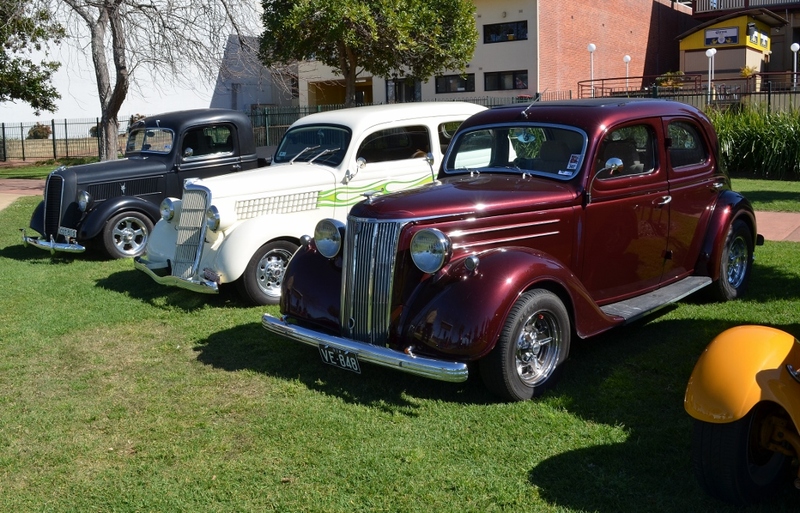 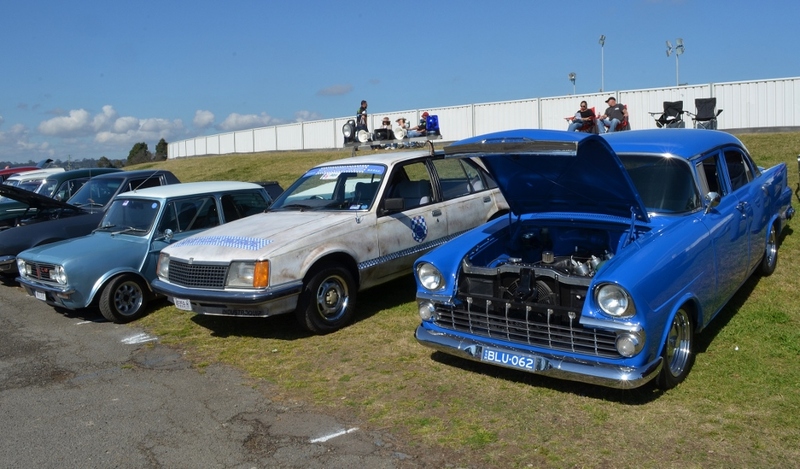 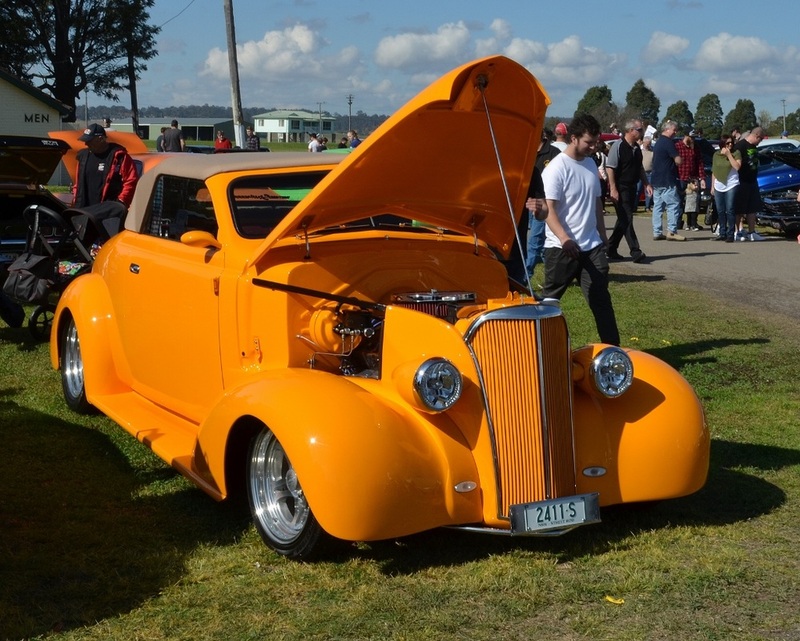 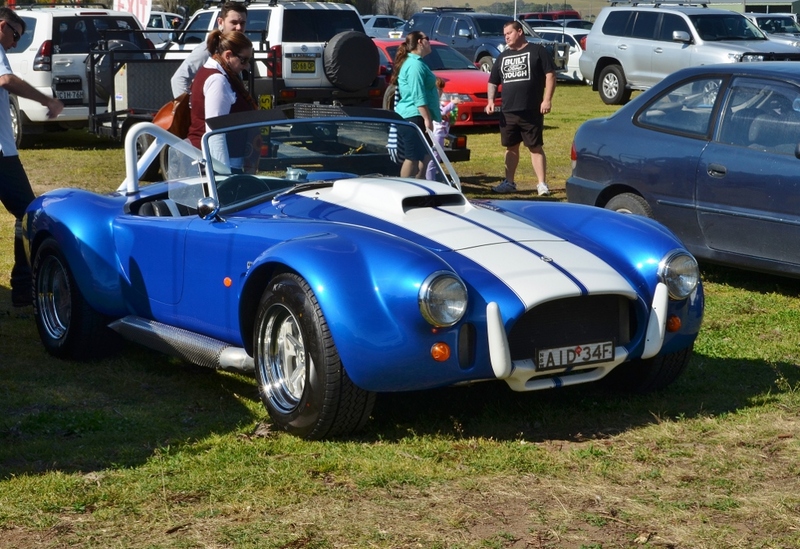 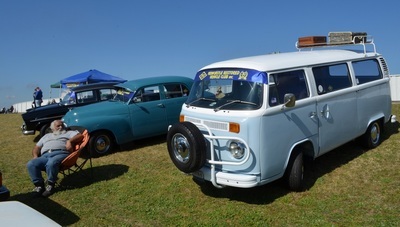 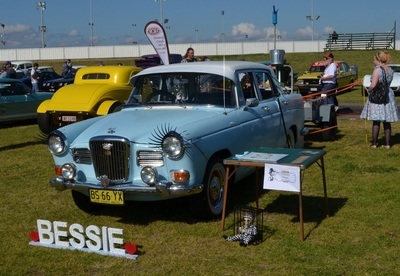 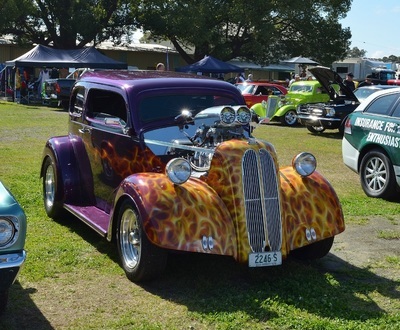 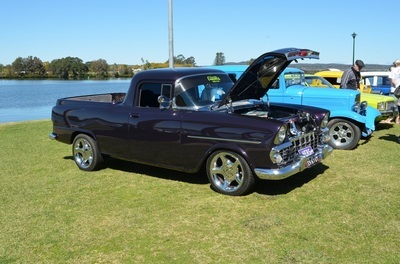 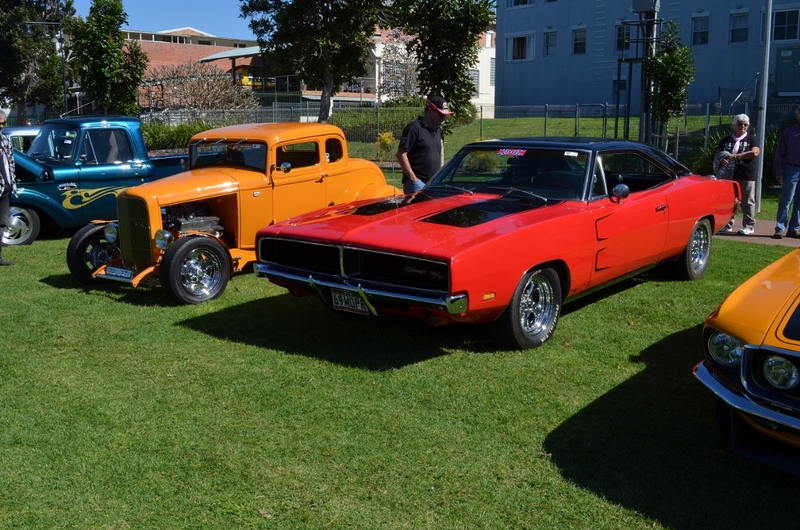 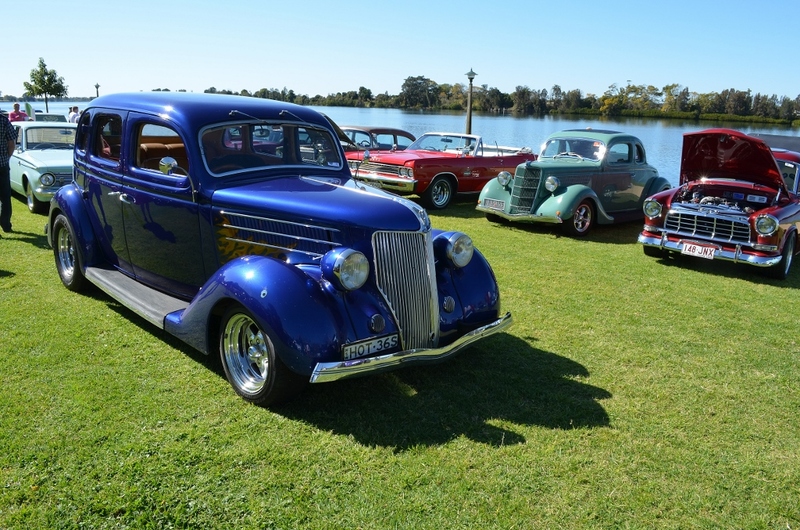 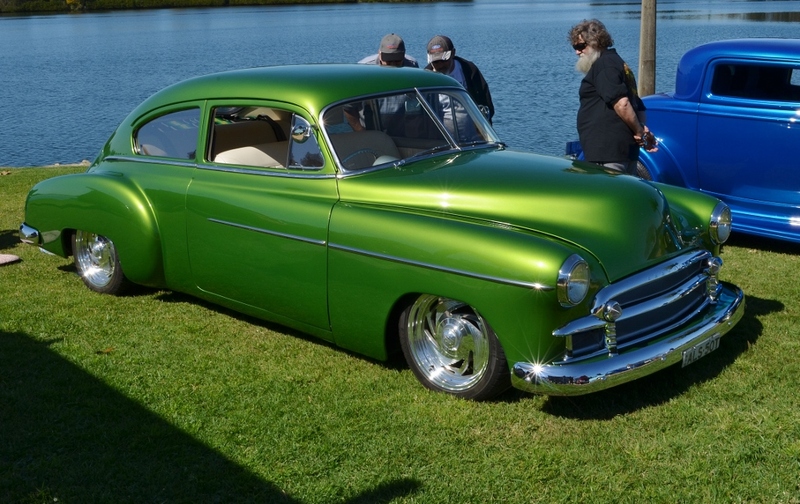 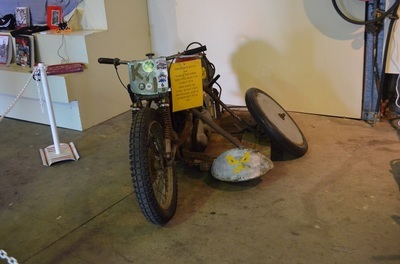 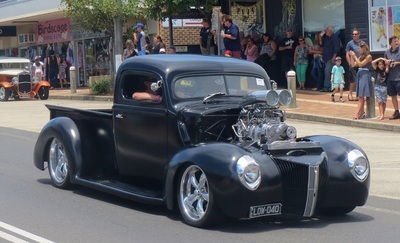 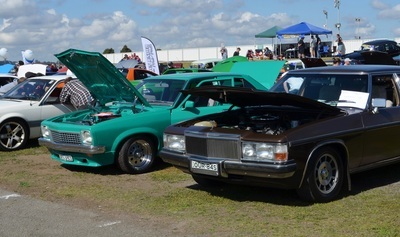 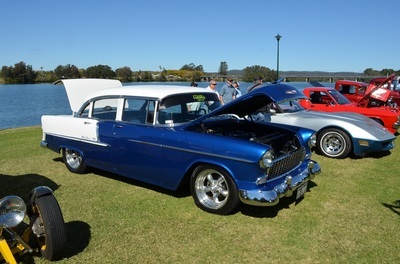 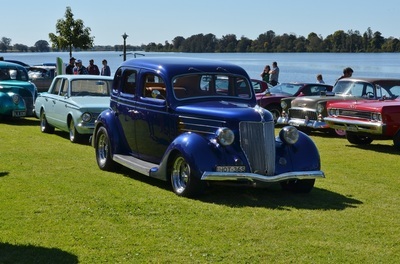 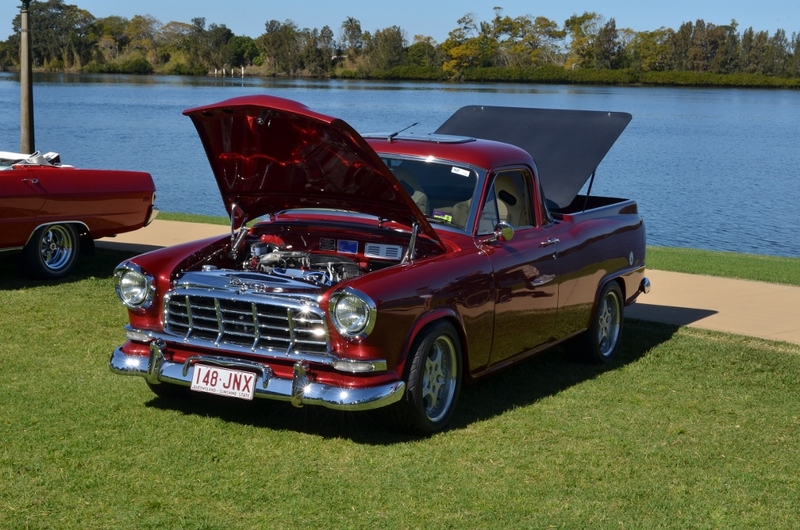 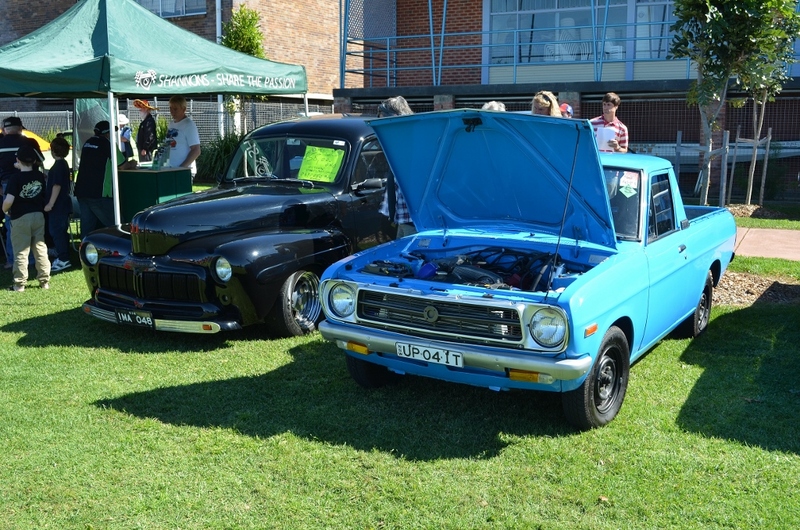 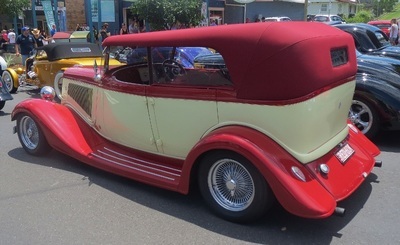 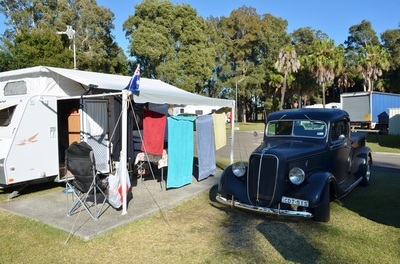 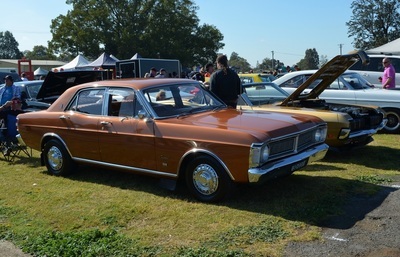 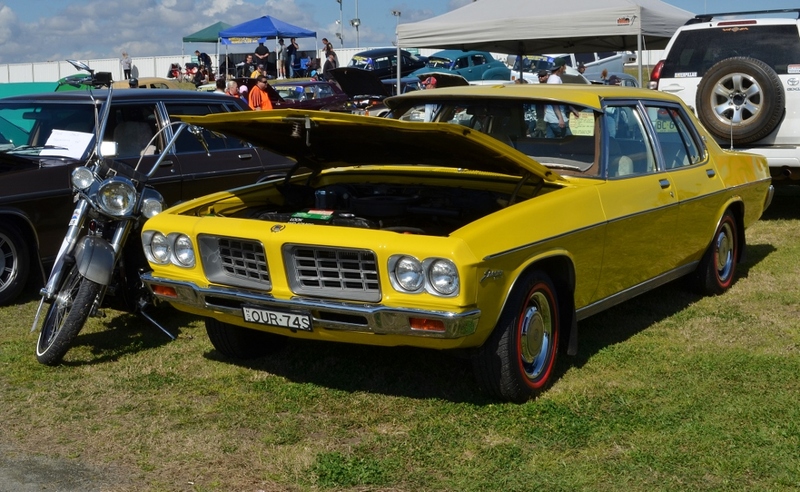 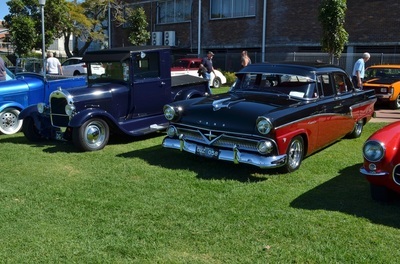 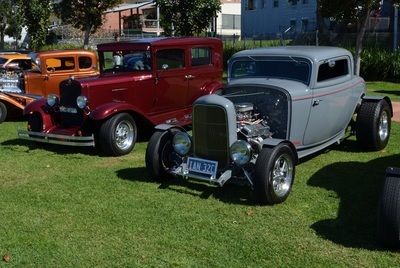 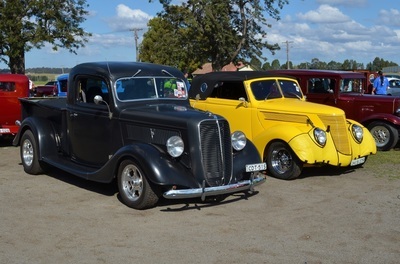 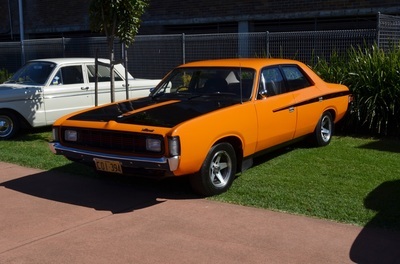 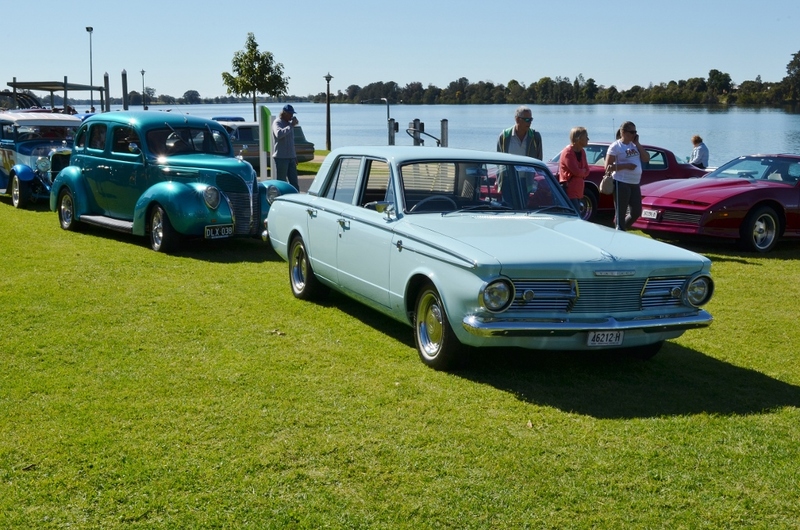 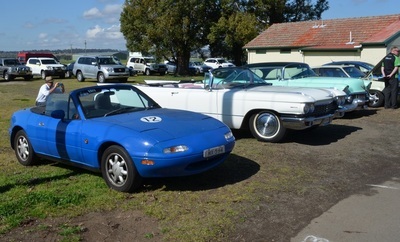 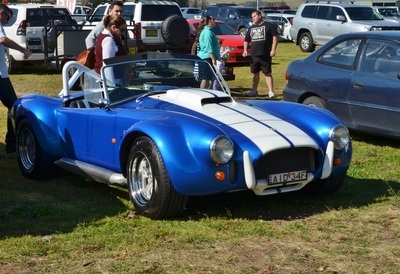 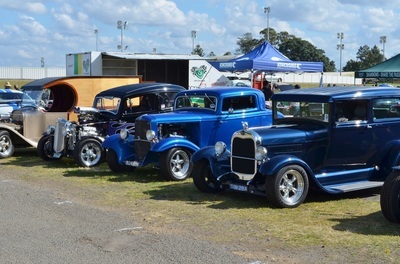 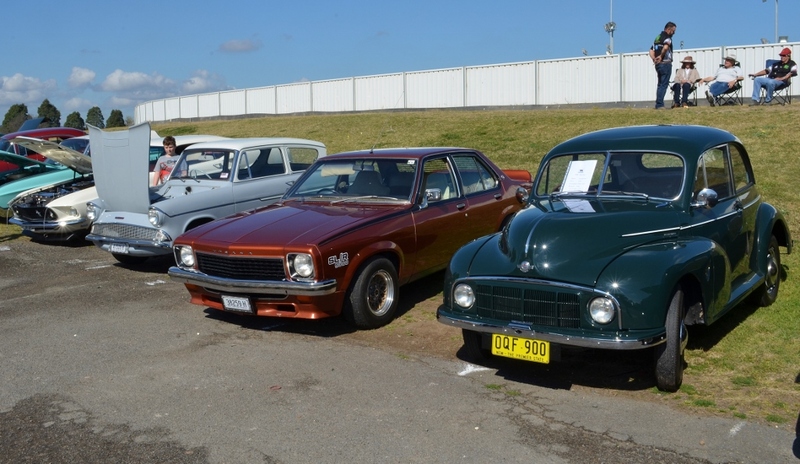 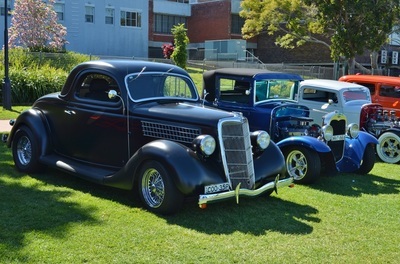 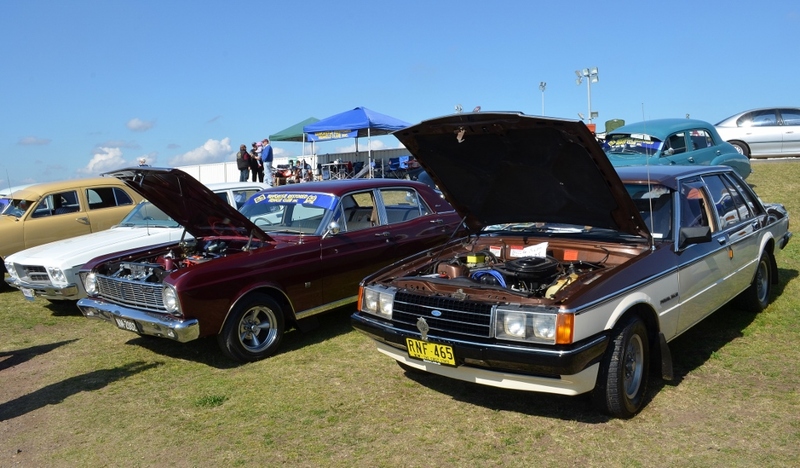 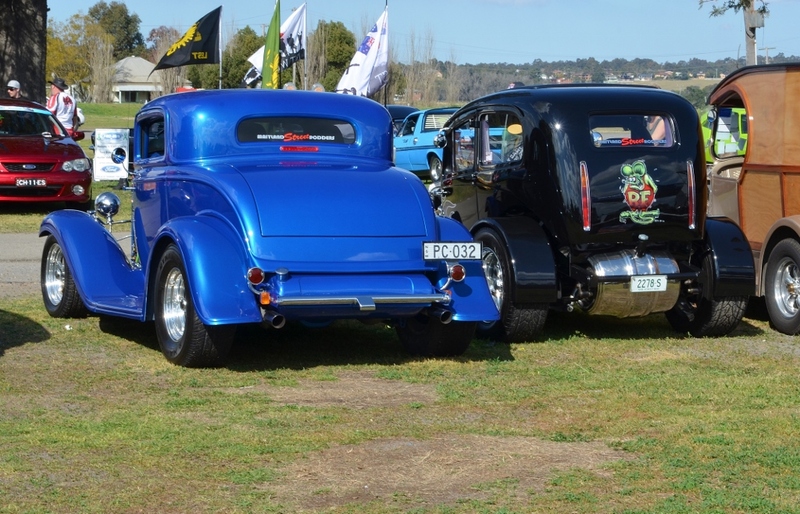 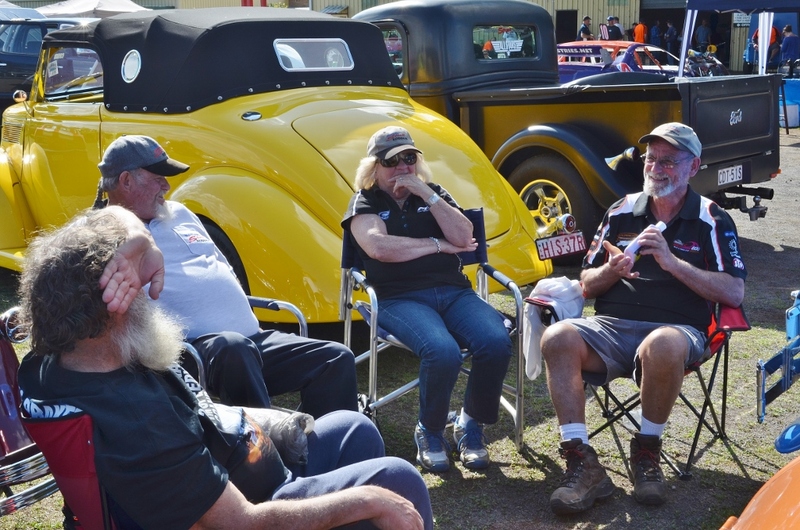 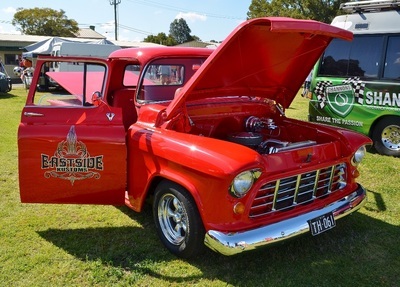 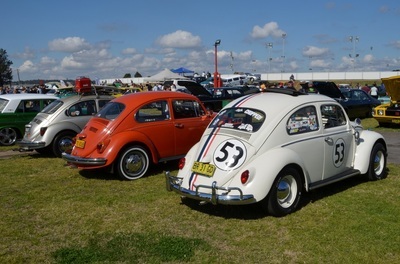 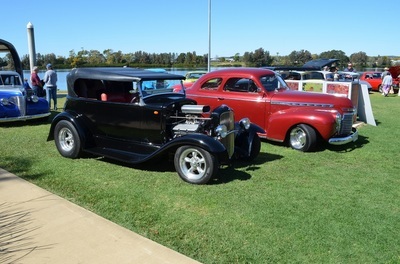 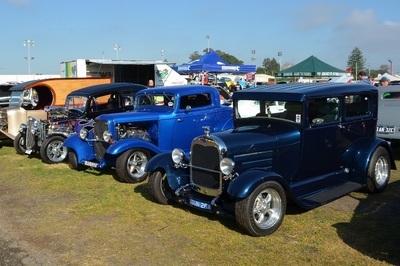 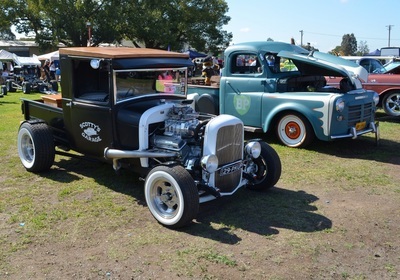 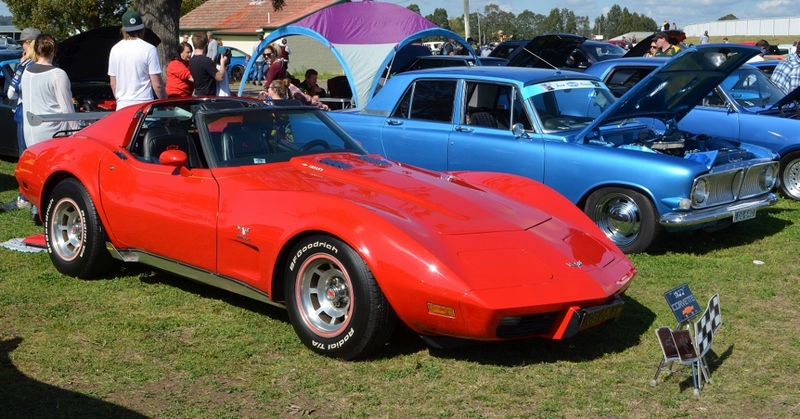 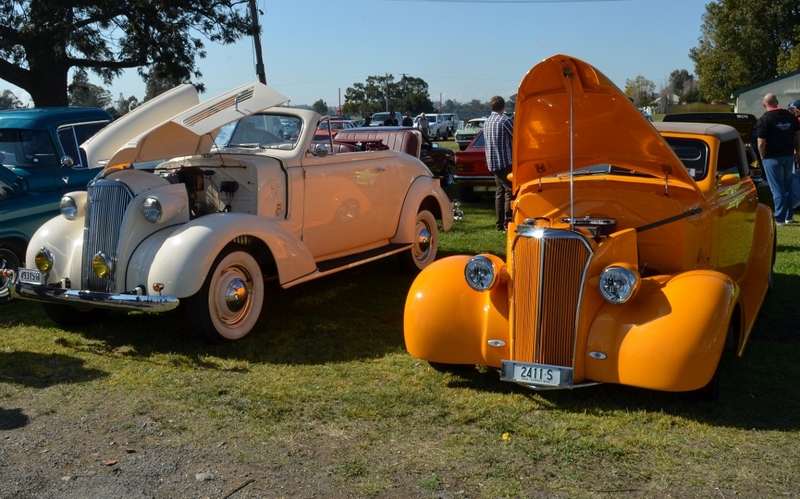 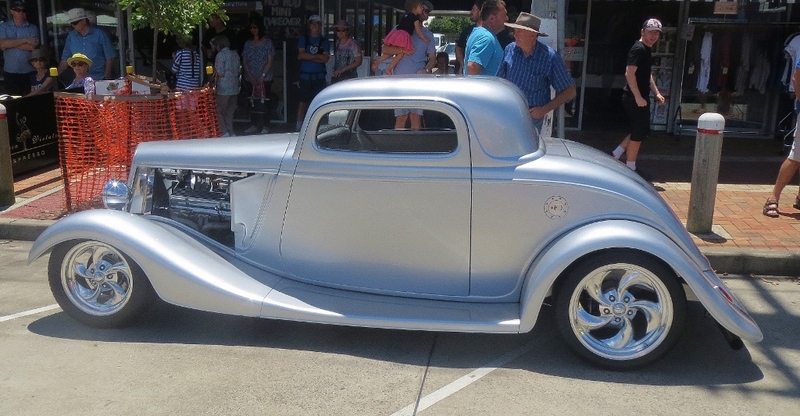 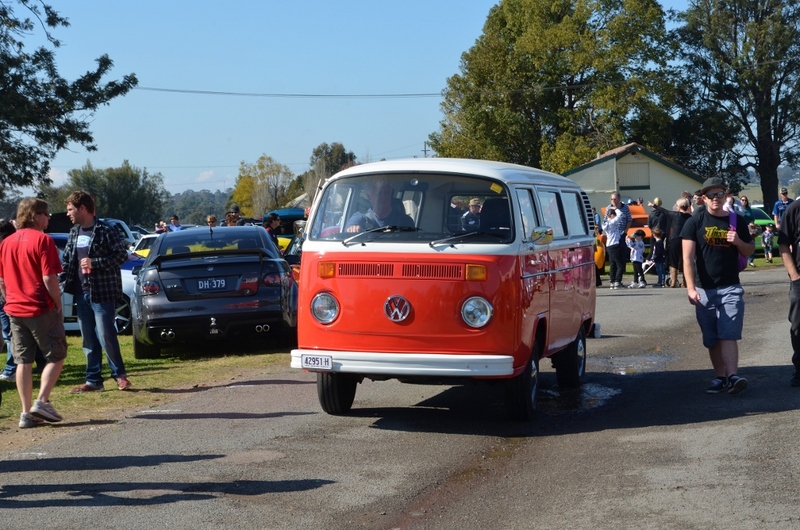 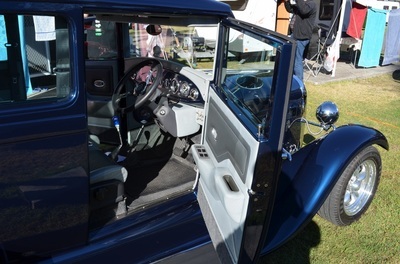 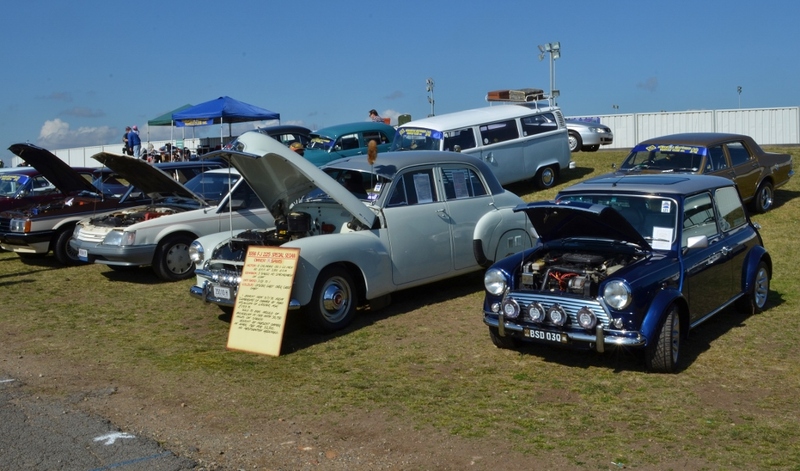 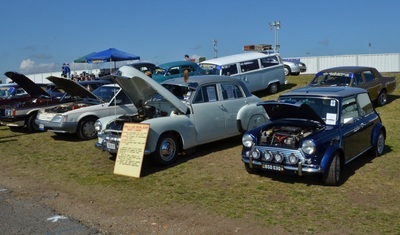 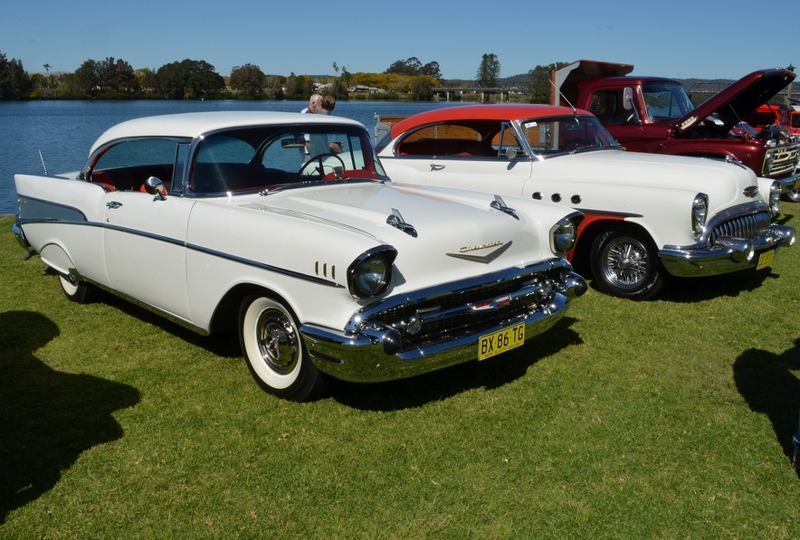 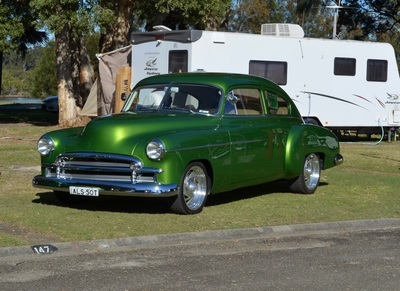 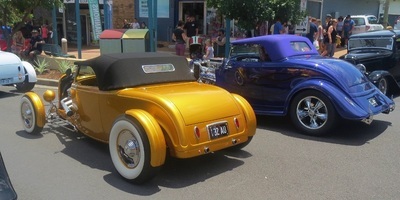 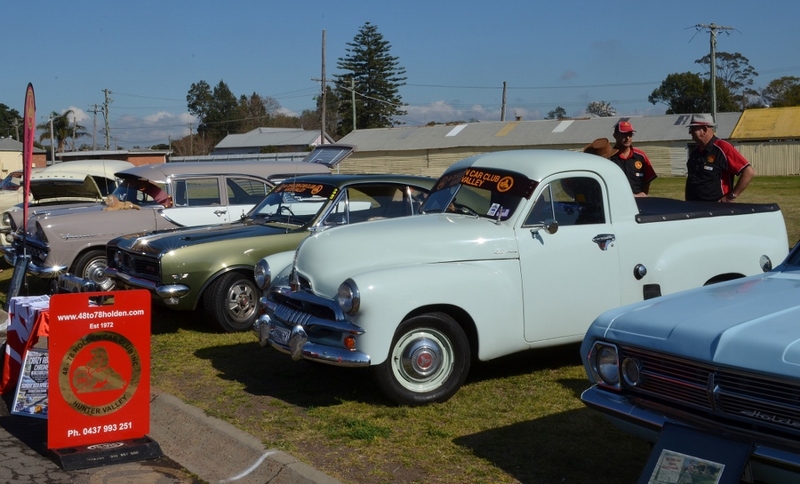 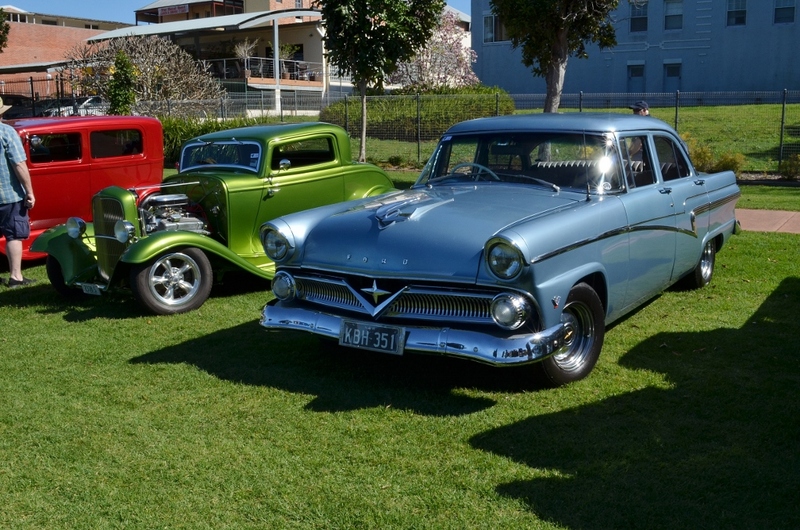 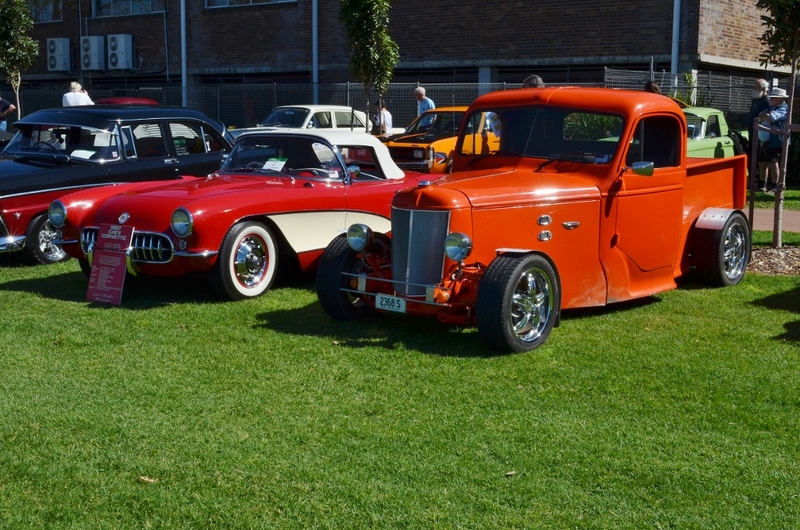 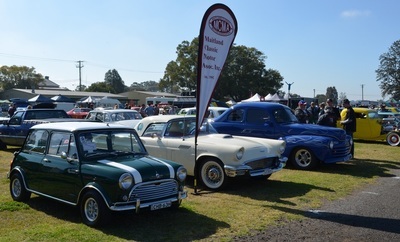 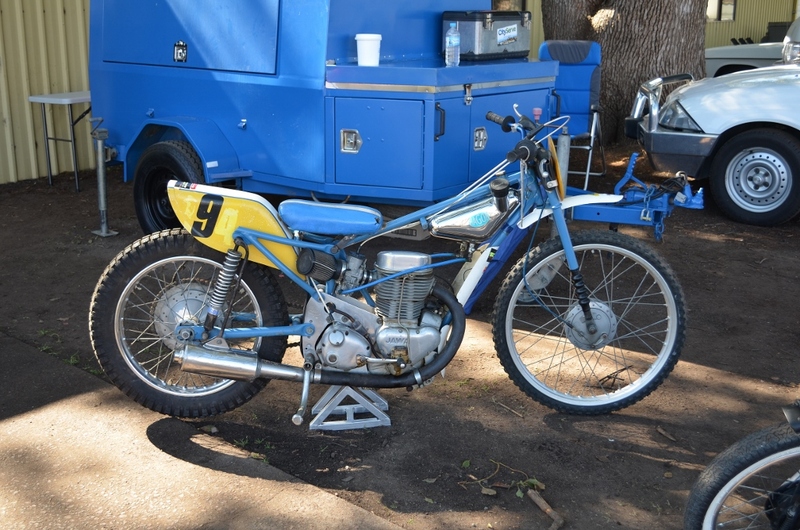 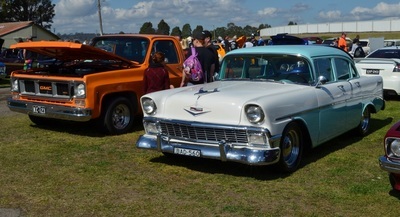 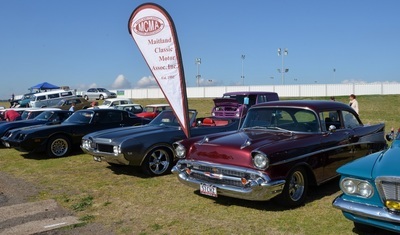 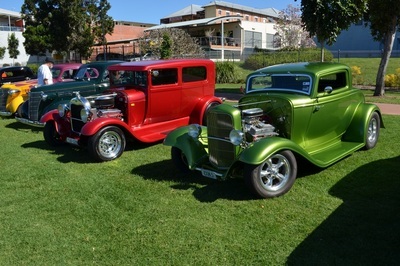 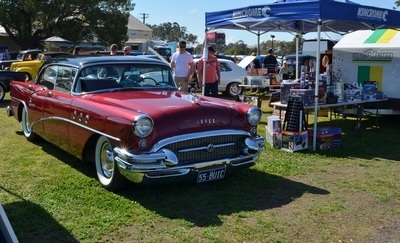 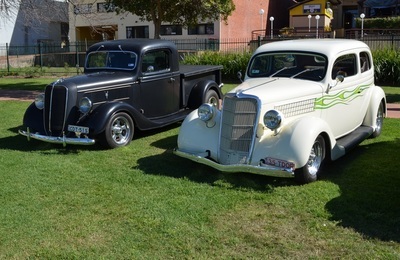 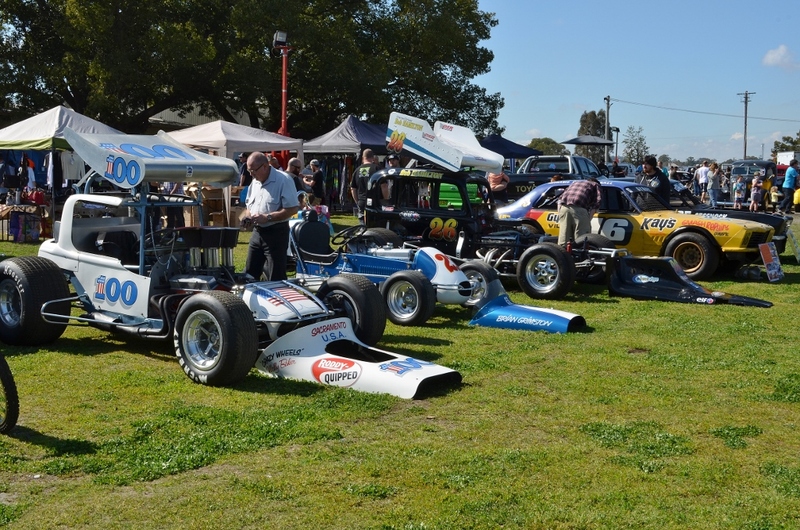 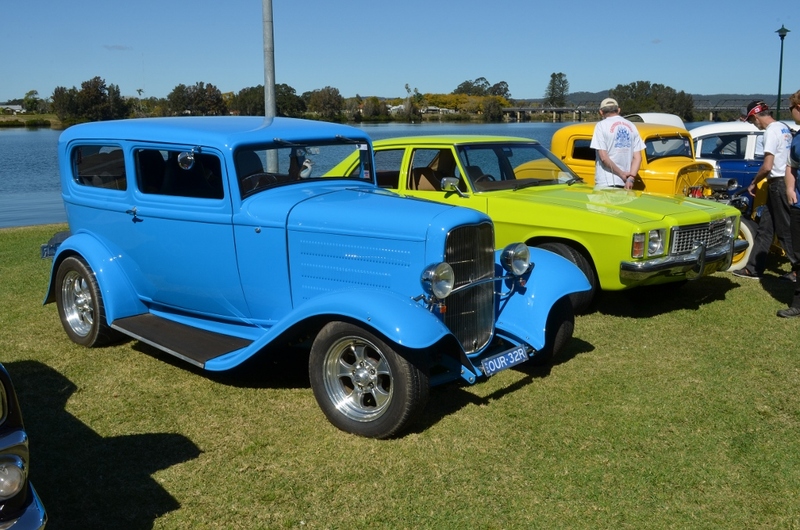 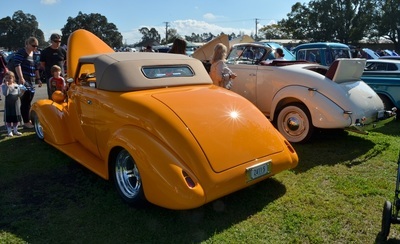 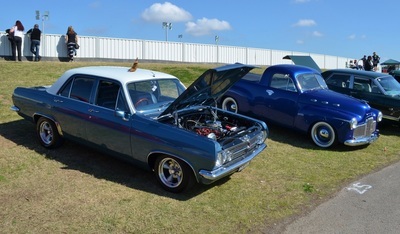 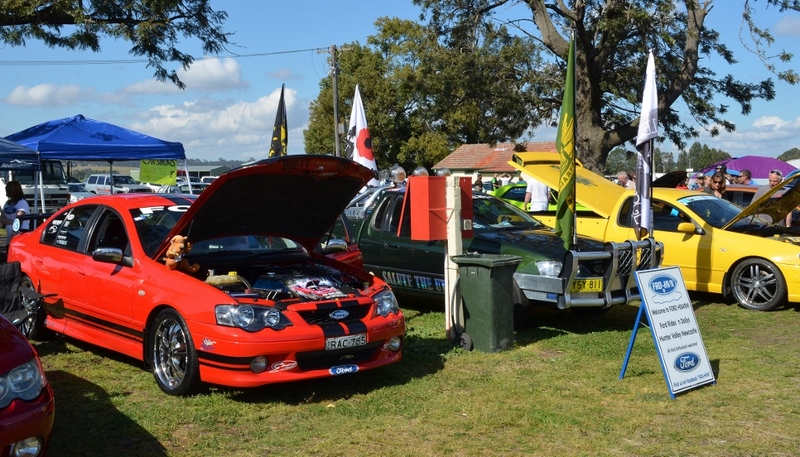 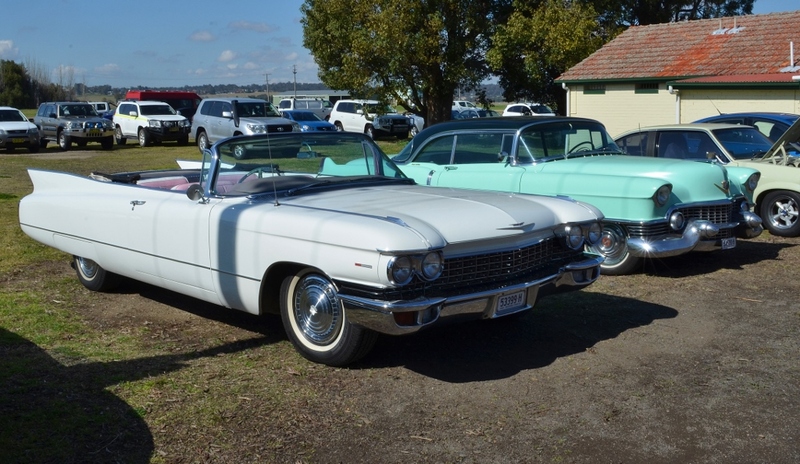 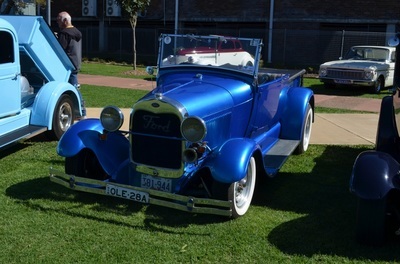 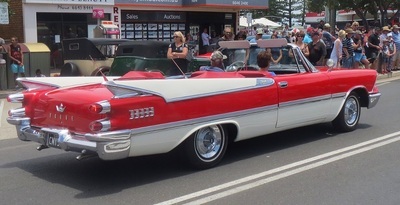 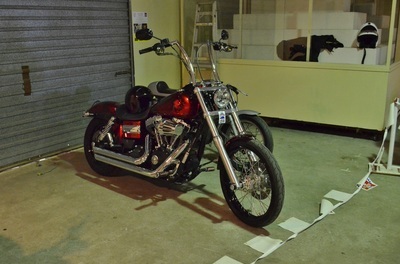 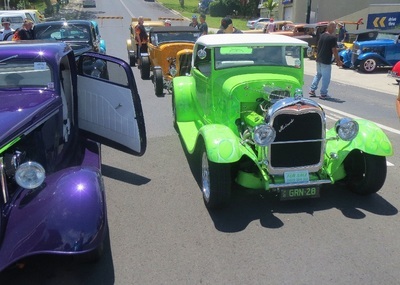 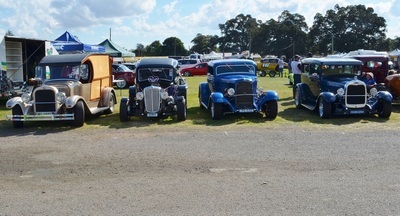 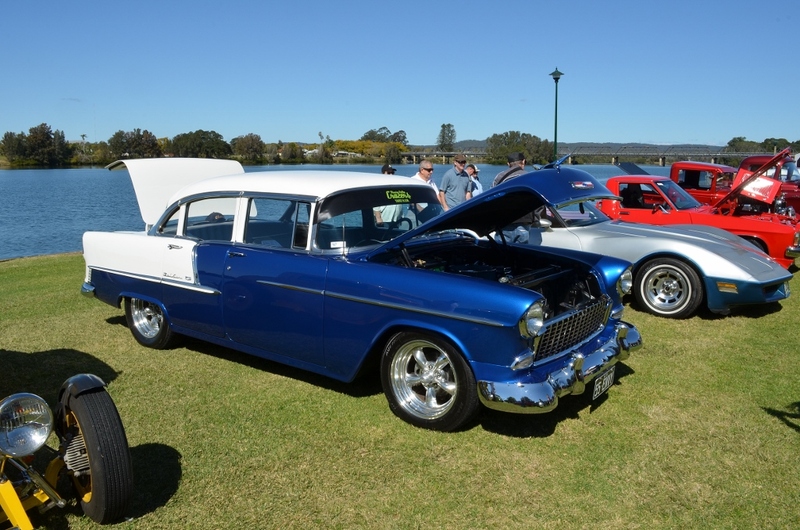 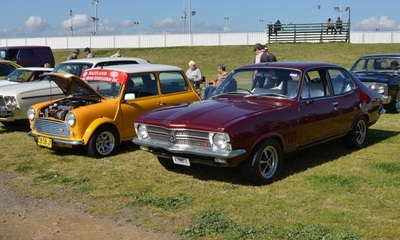 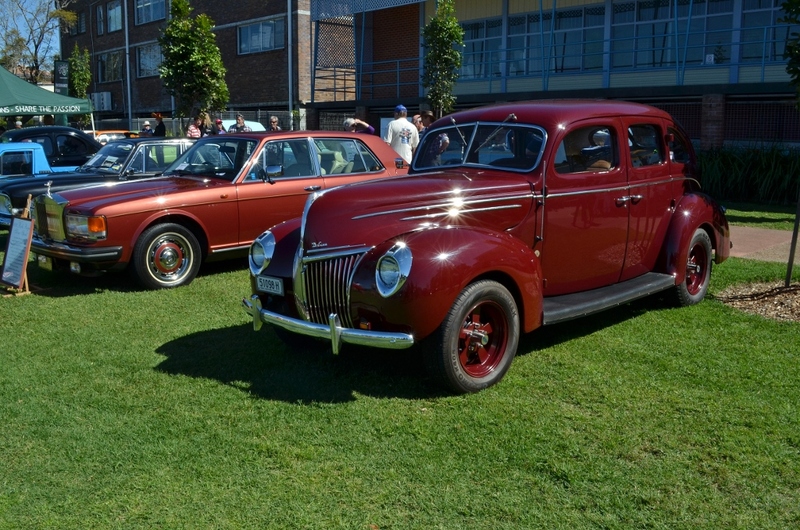 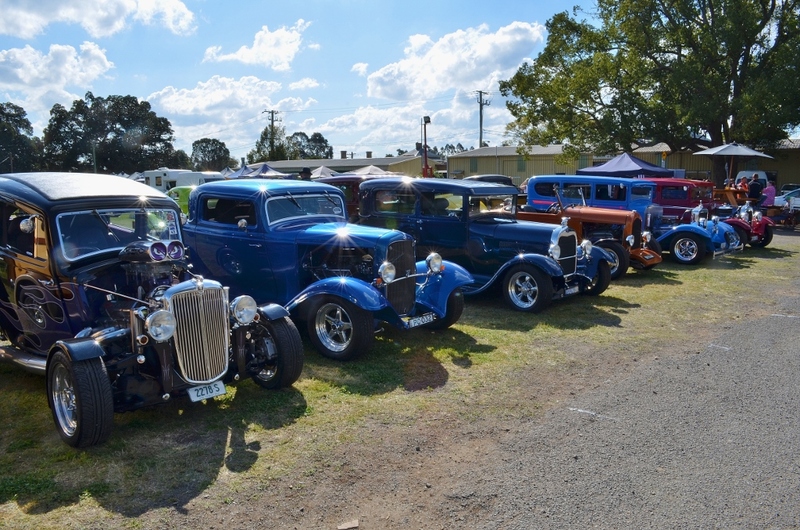 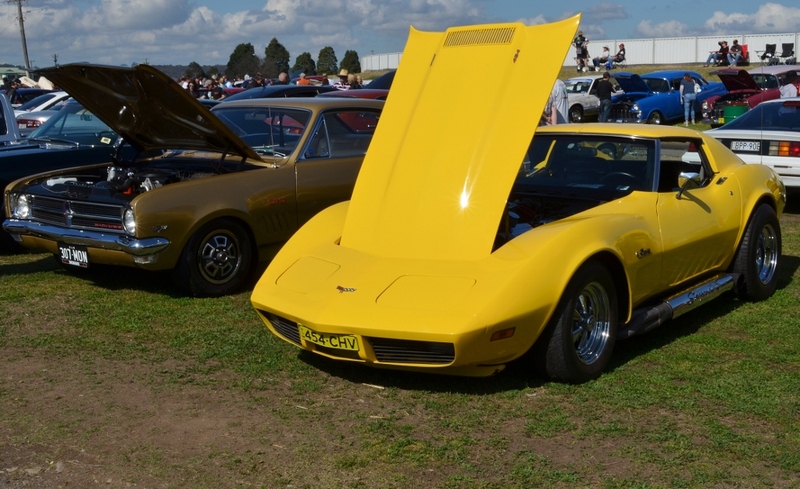 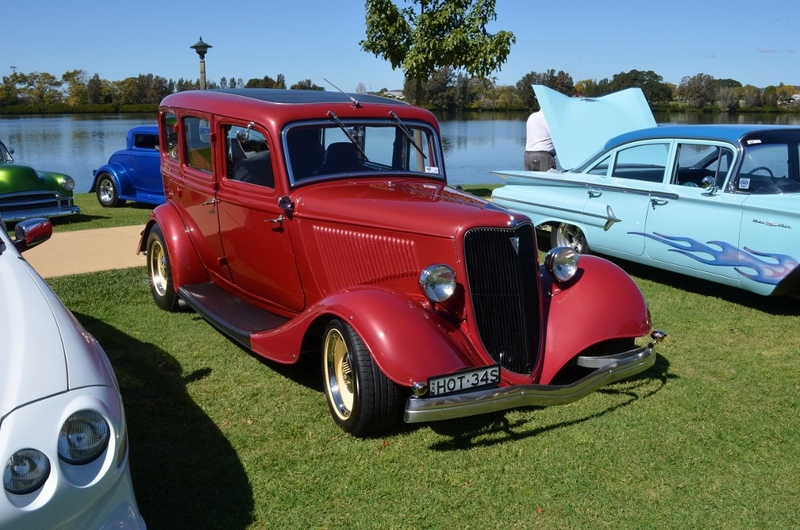 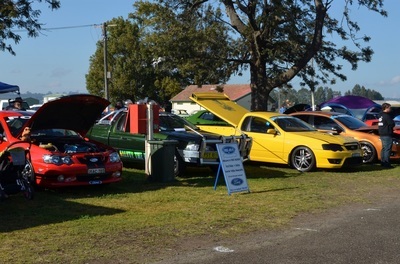 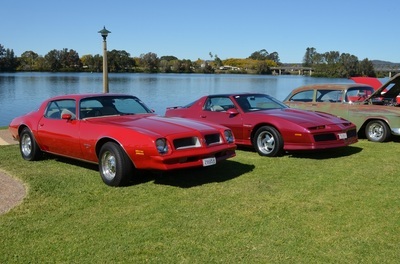 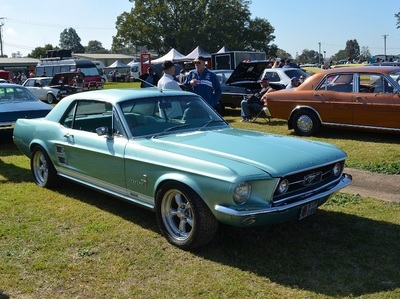 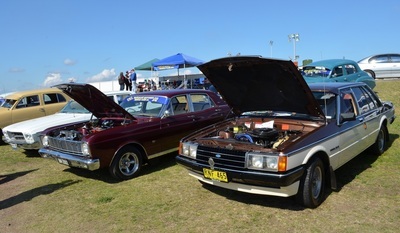 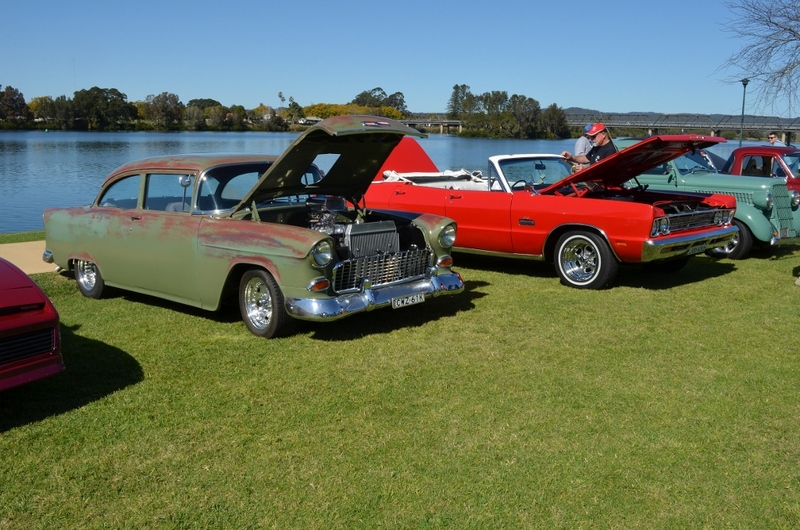 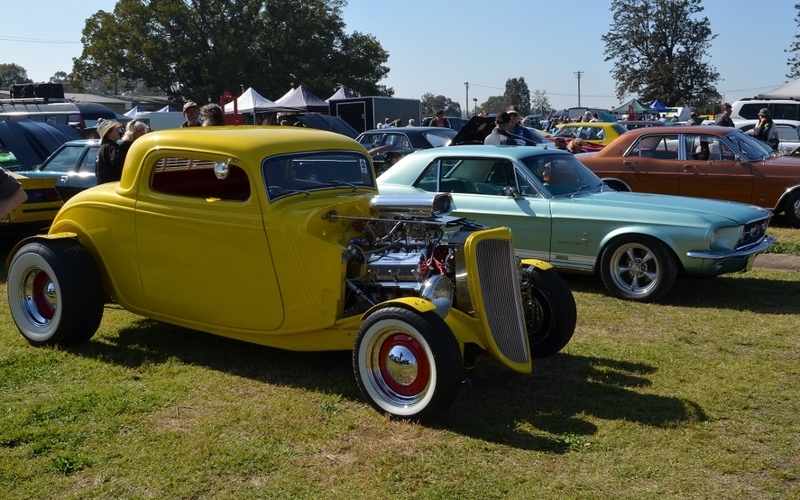 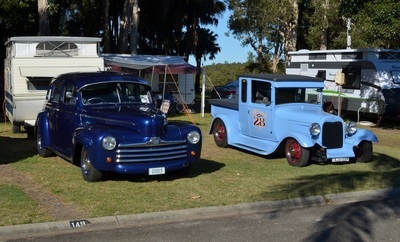 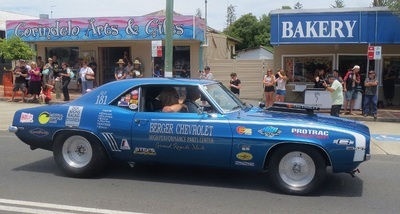 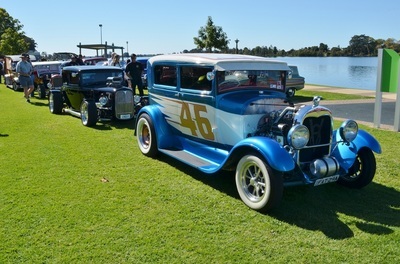 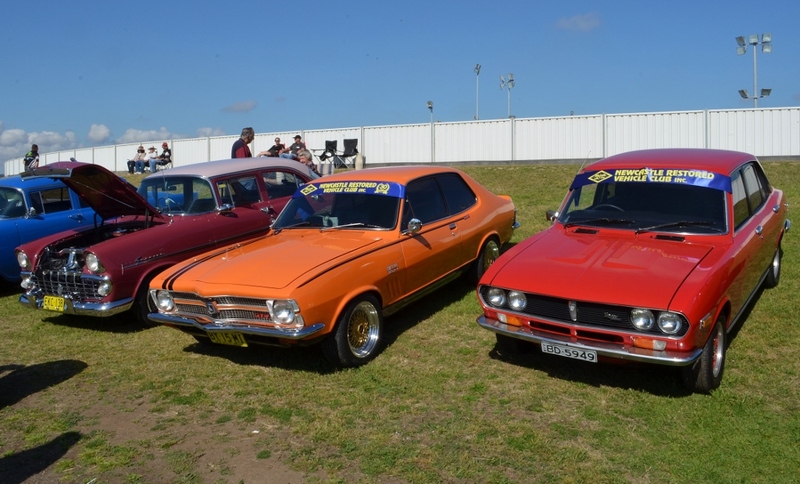 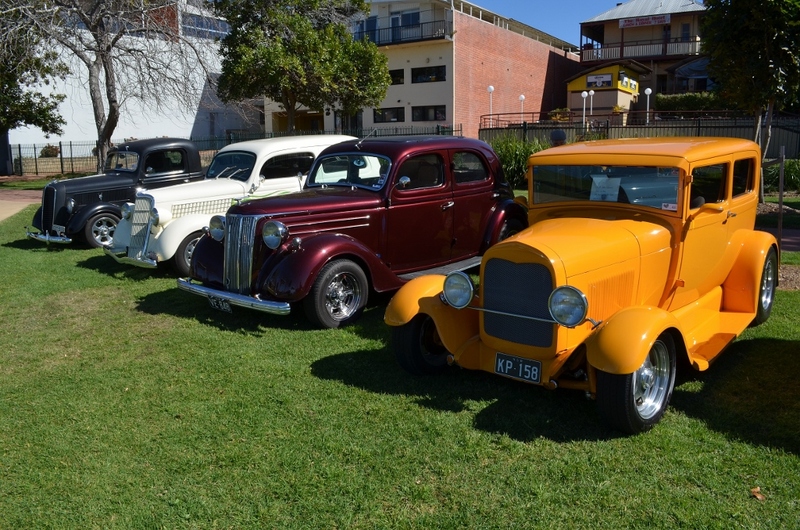 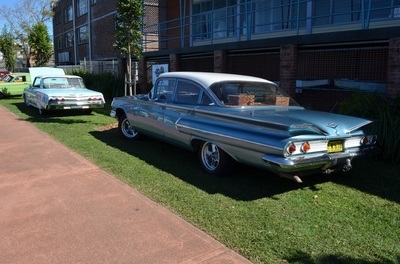 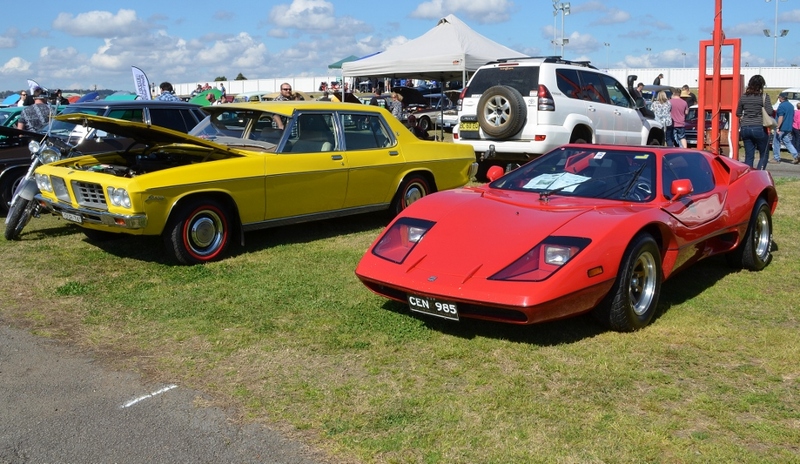 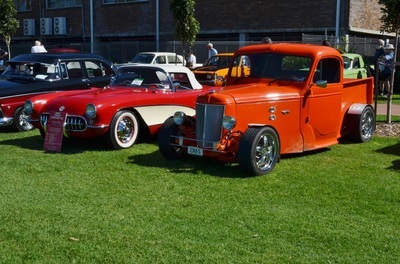 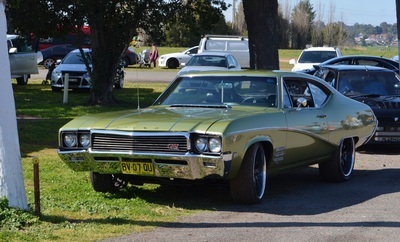 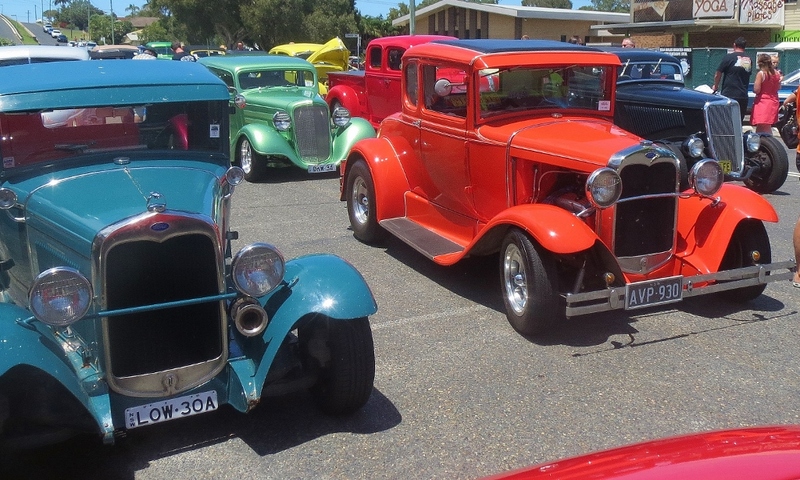 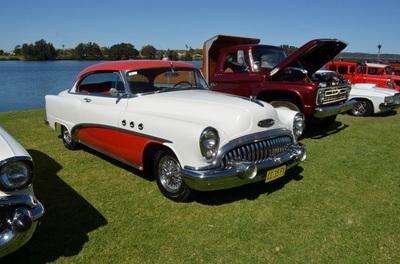 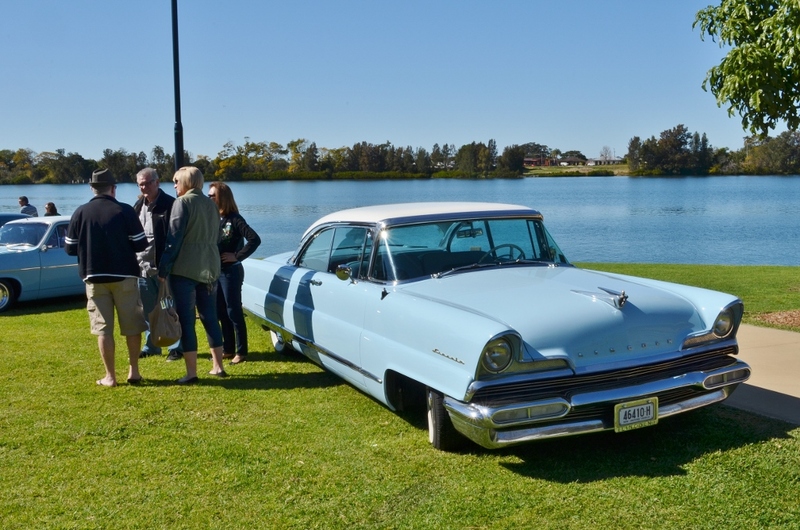 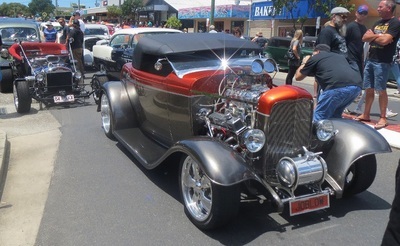 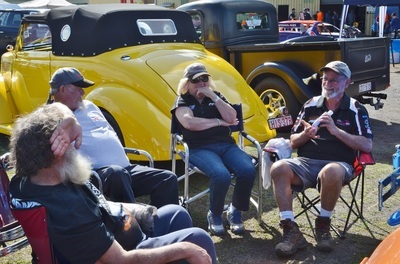 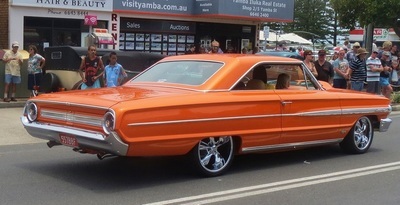 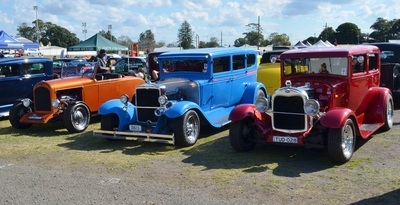 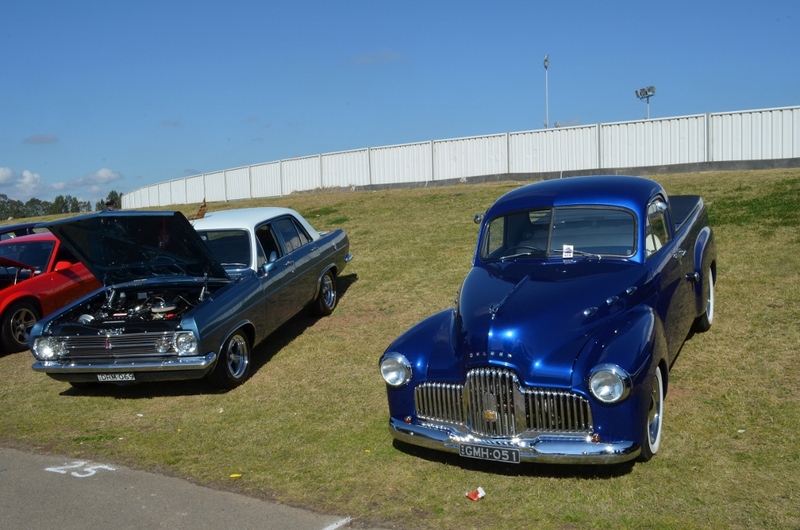 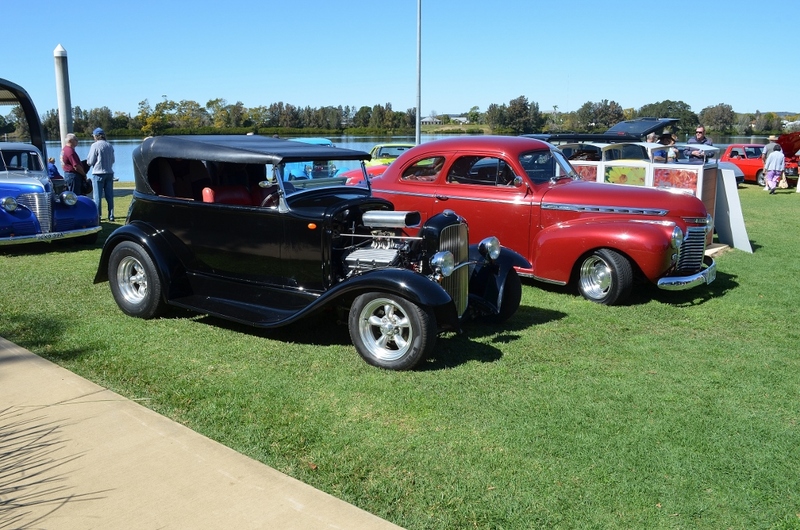 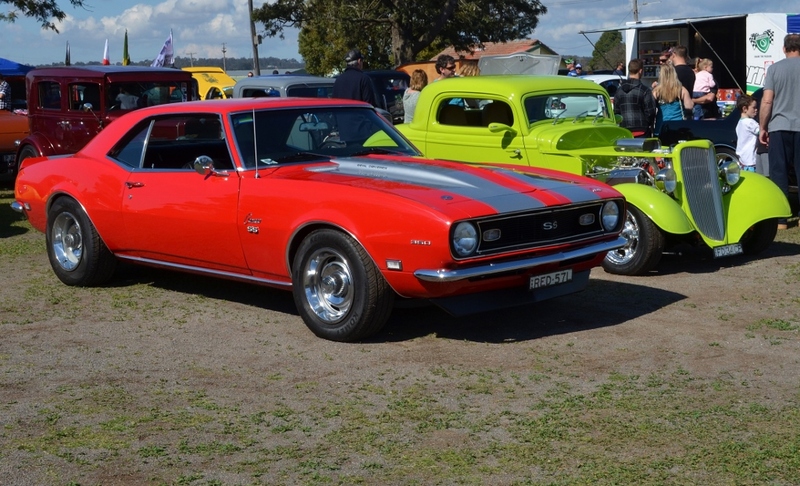 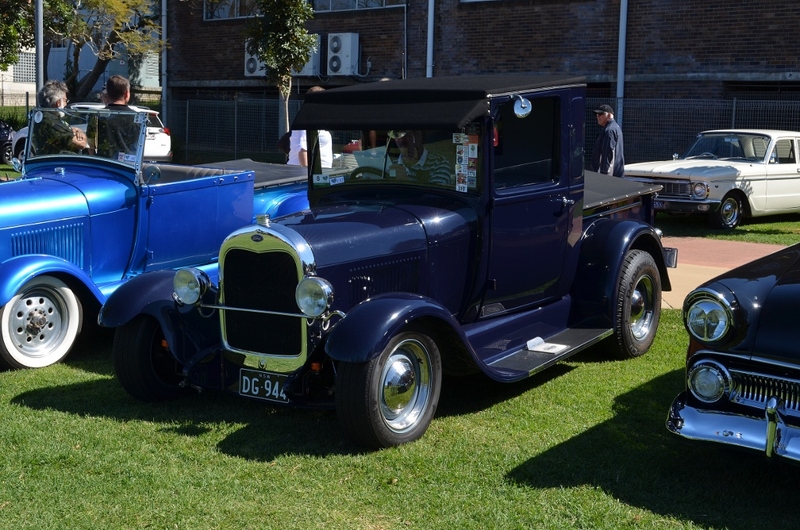 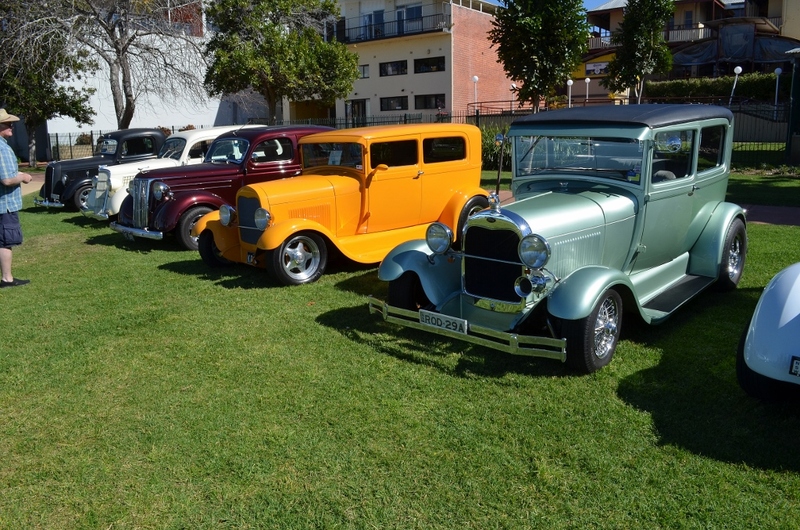 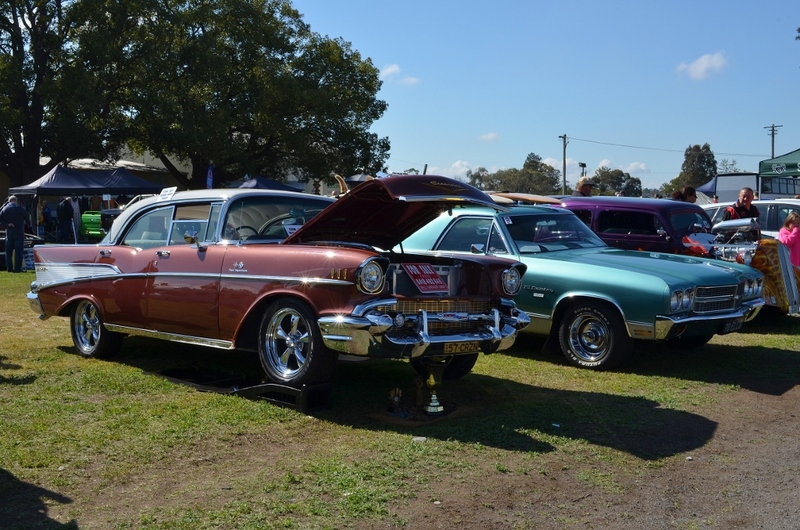 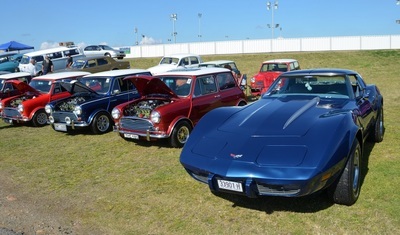 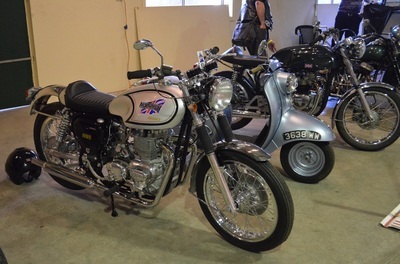 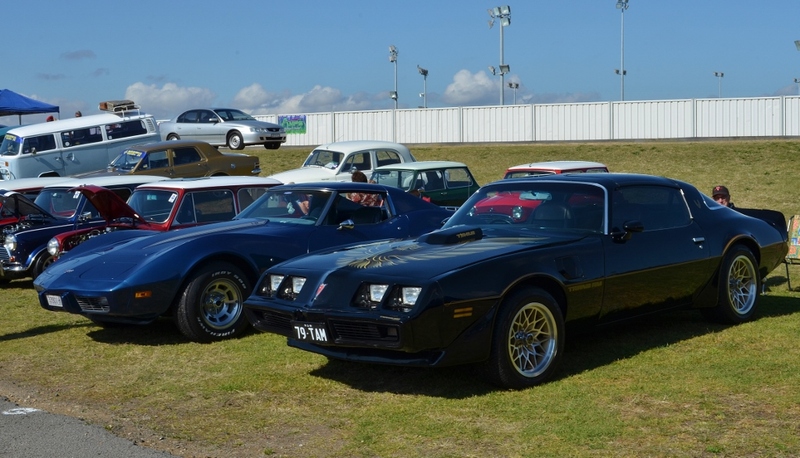 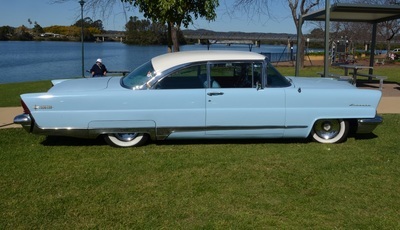 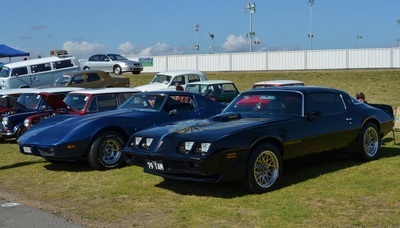 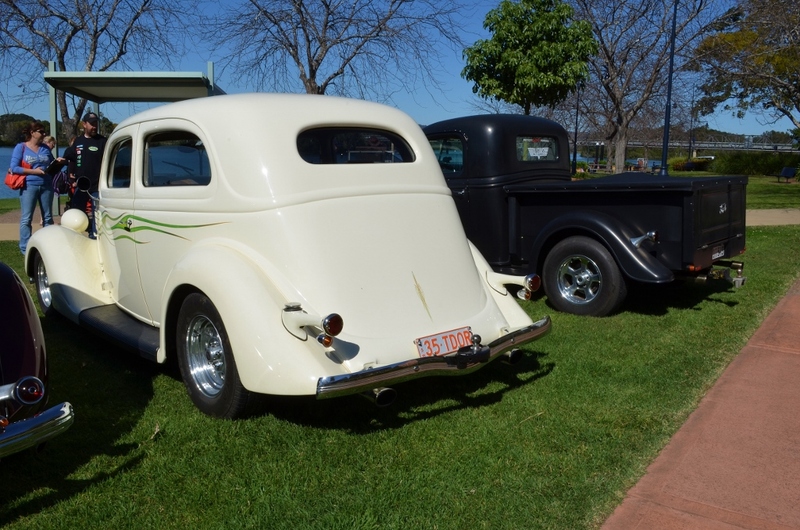 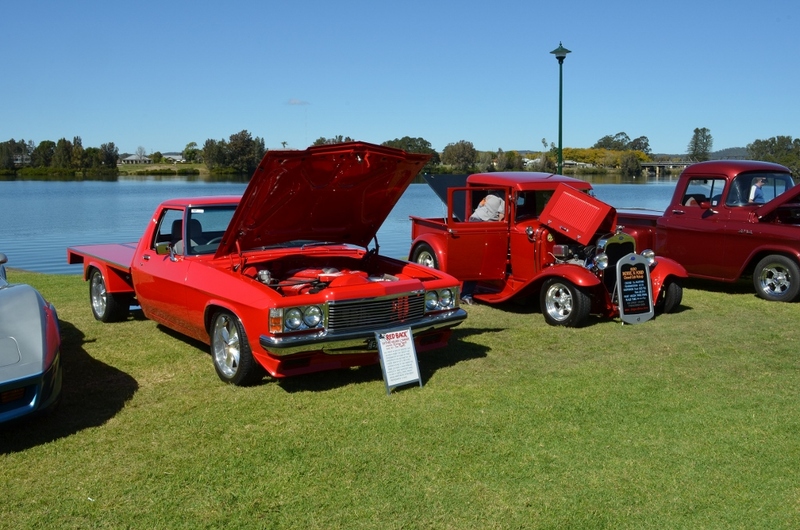 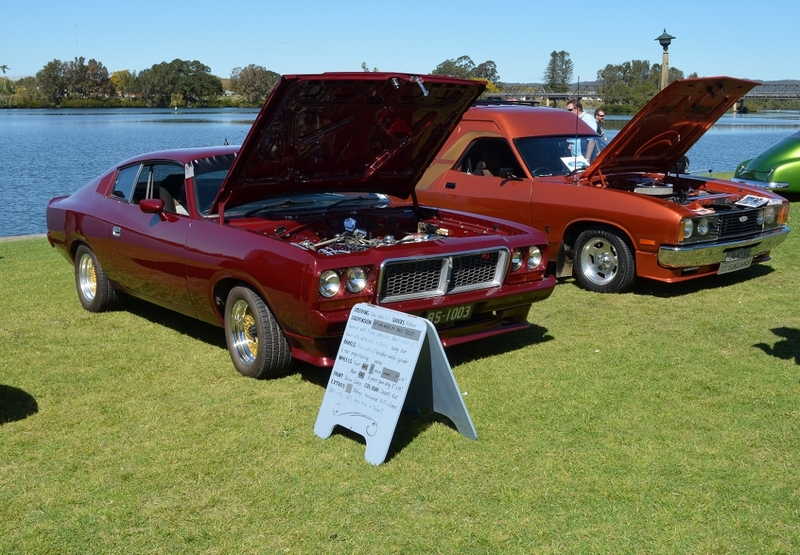 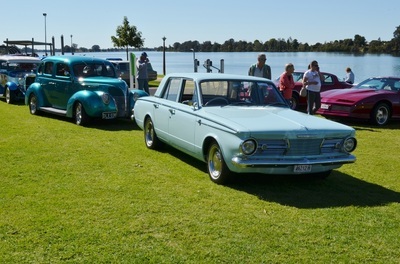 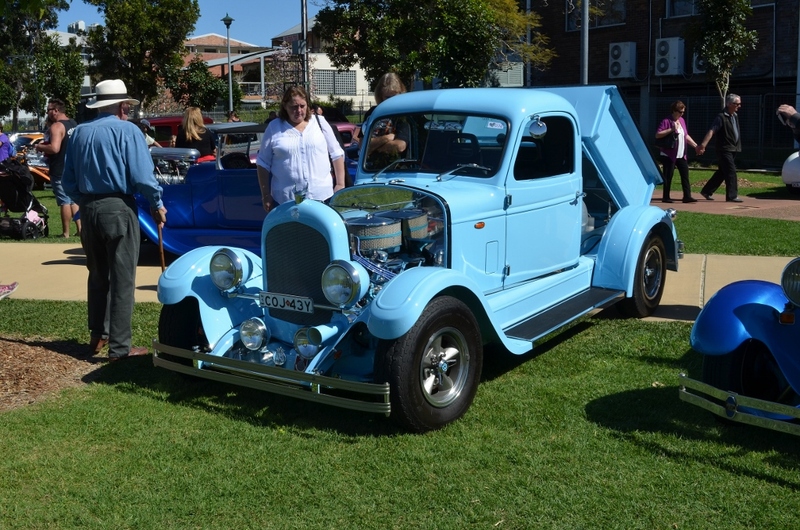 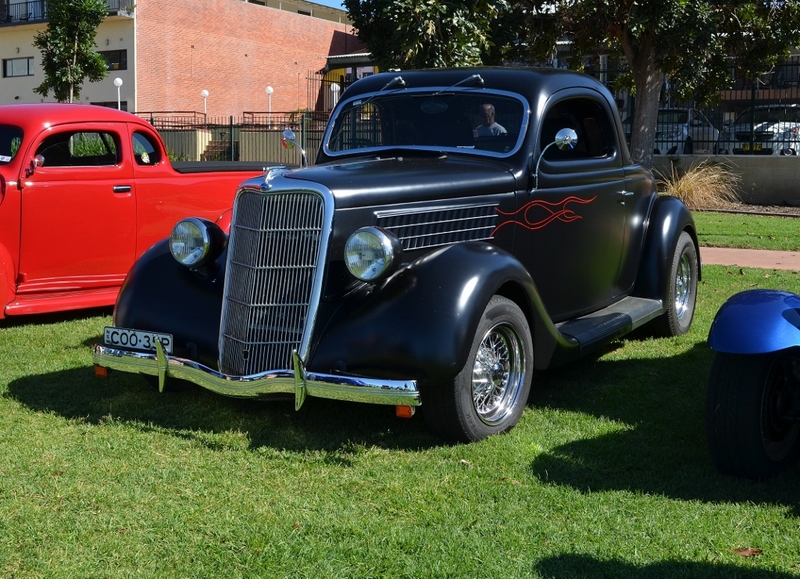 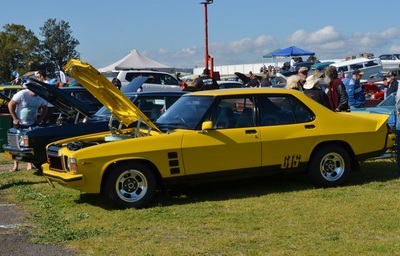 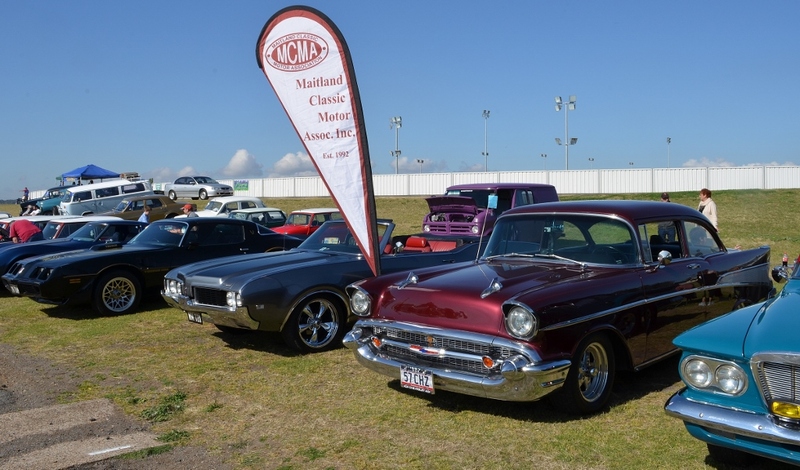 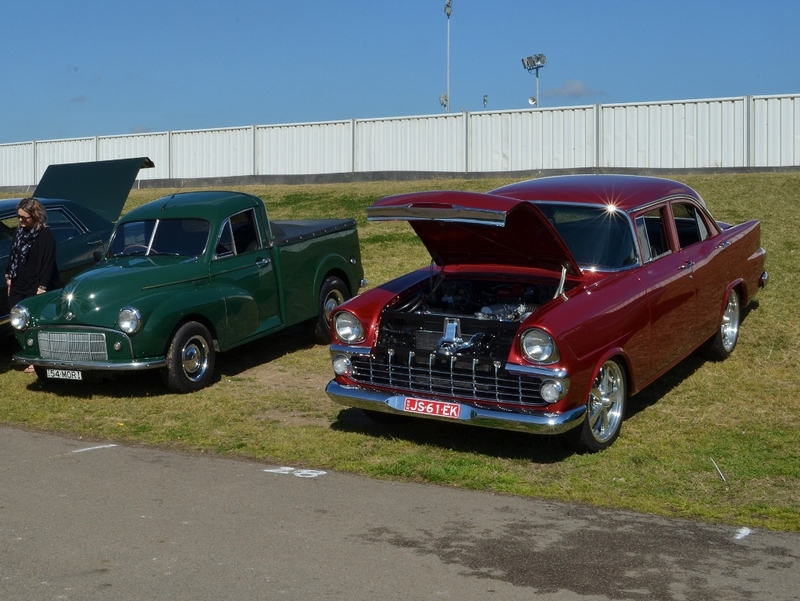 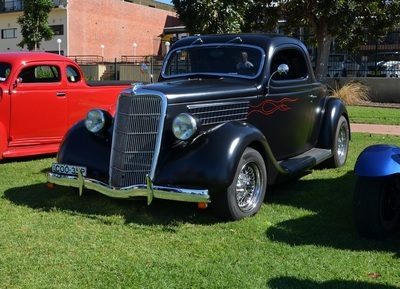 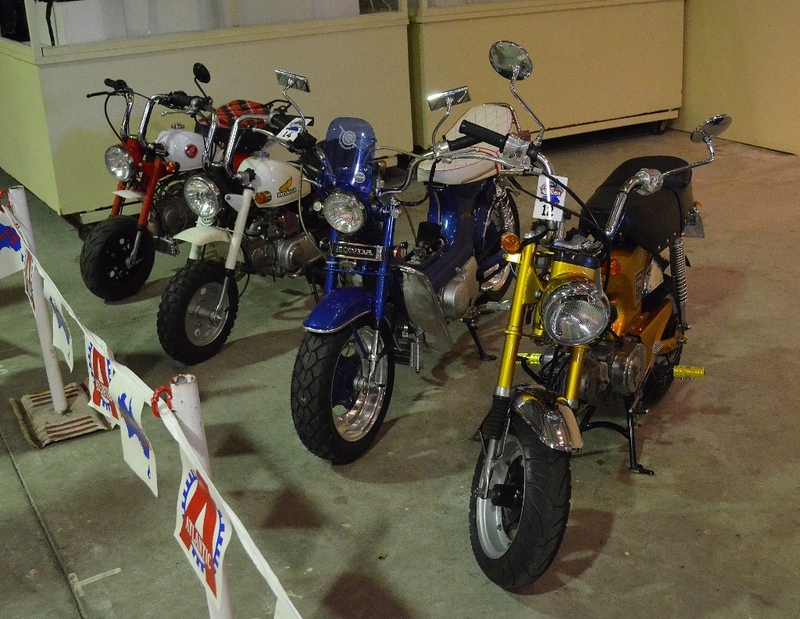 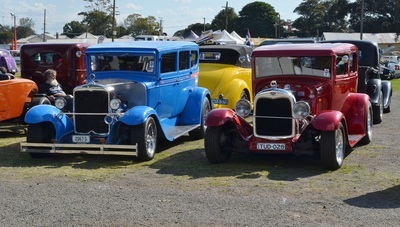 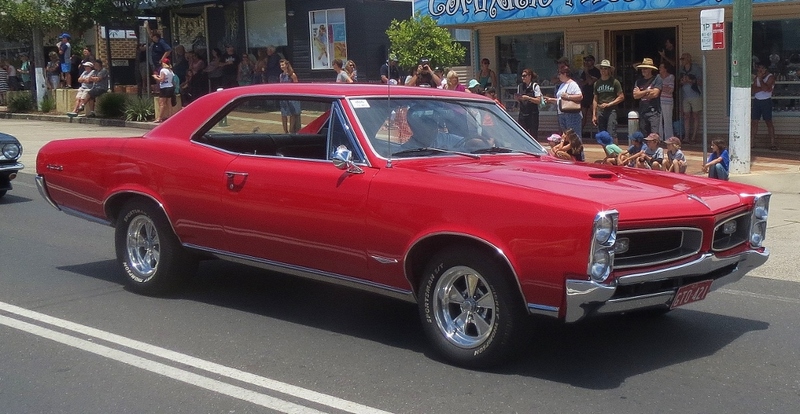 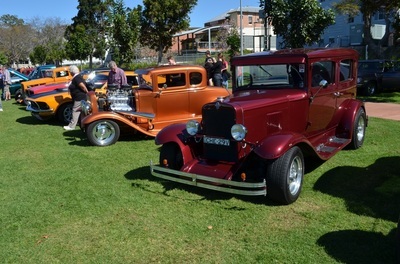 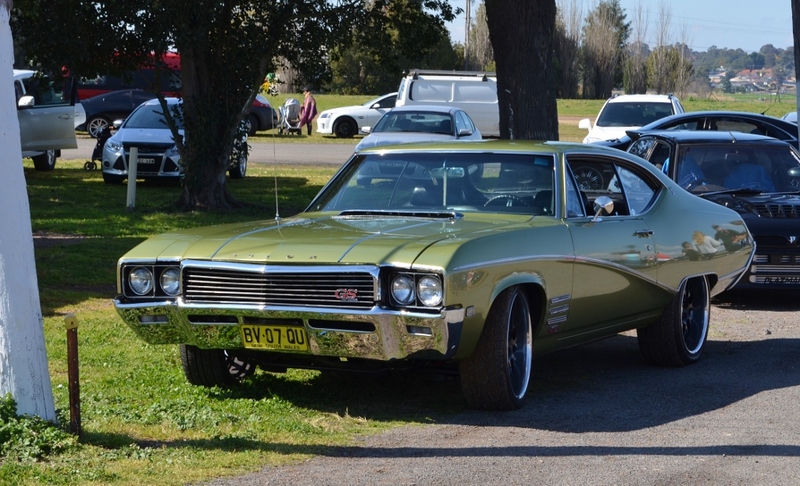 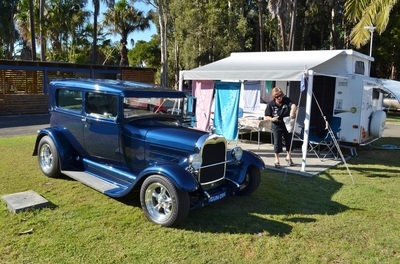 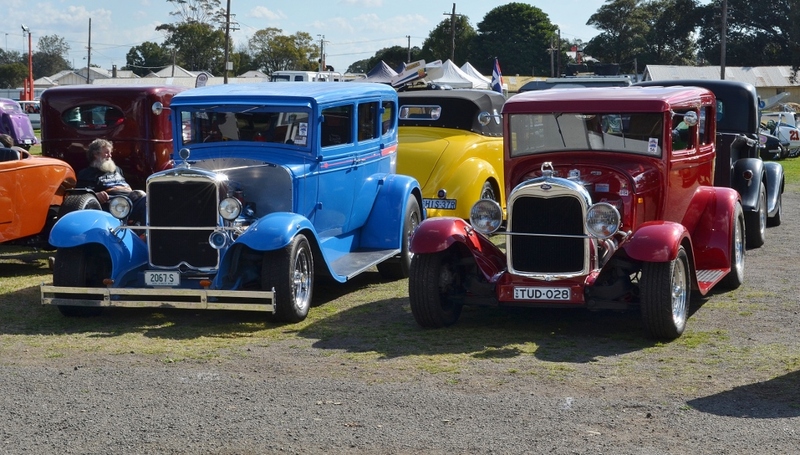 This year they had about 86 entrants but far more than that attended the Show and Shine at Taree. The weather was terrific this year and for those of us that spent the week rather than weekend we had a fantastic time which seemed to go much too quickly. 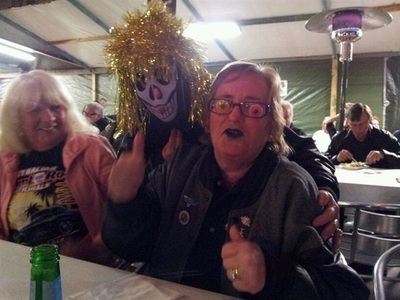 Glenda was lucky enough to have her rod in the top 5 but we missed out to Easy Street for the best represented club which we had held for the previous four years. 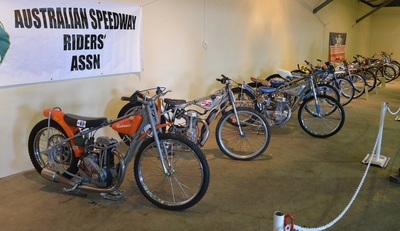 We will be back again next year and hopefully we can persuade some more of our members to return and get that trophy back. 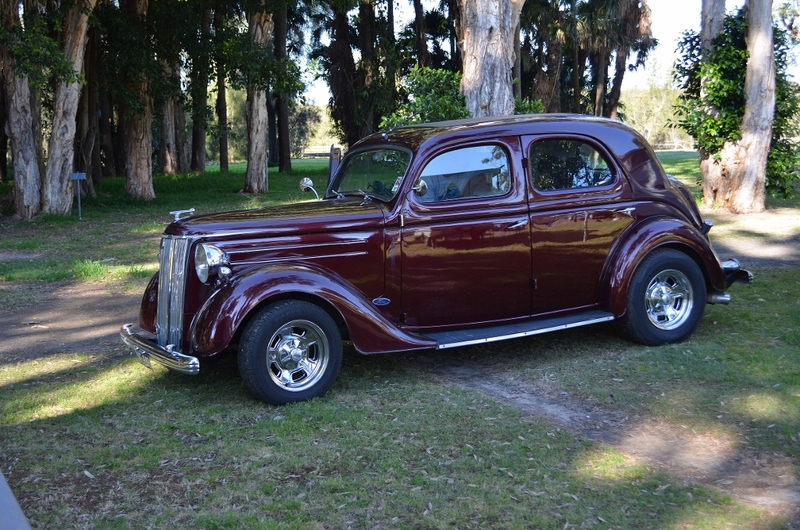 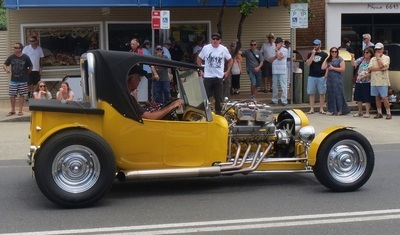 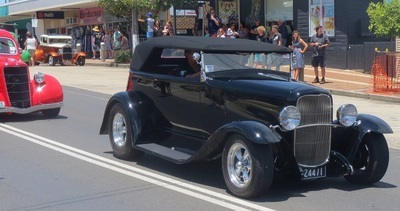 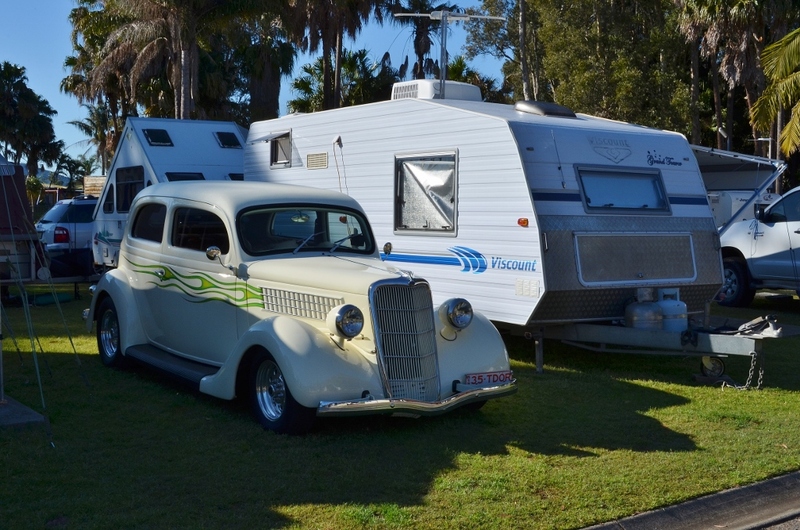 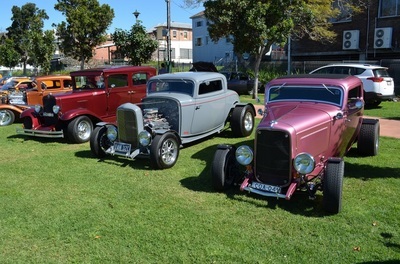 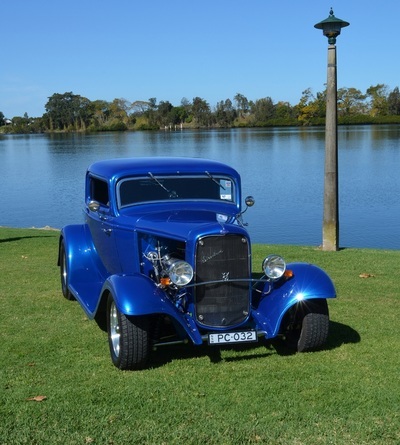 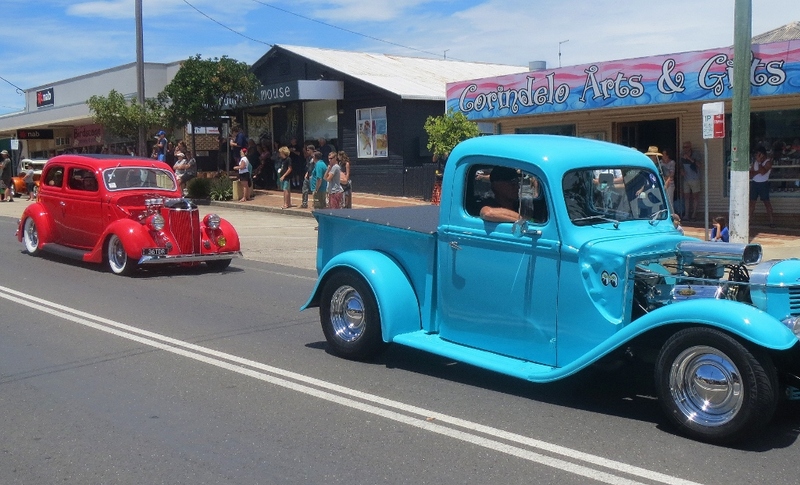 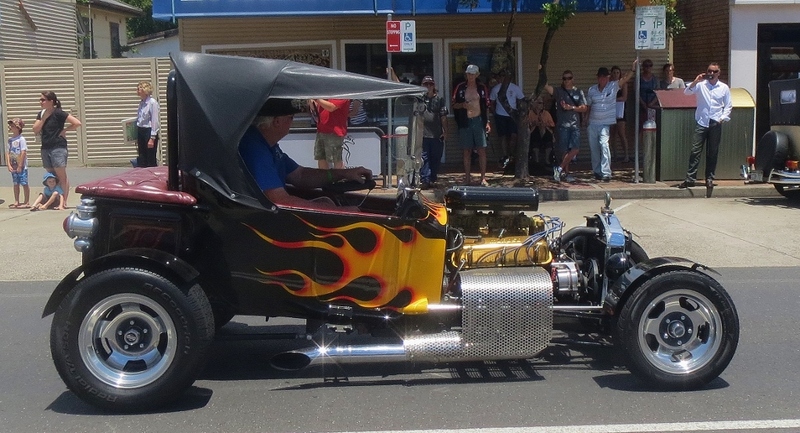 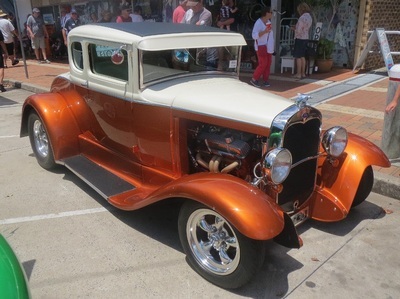 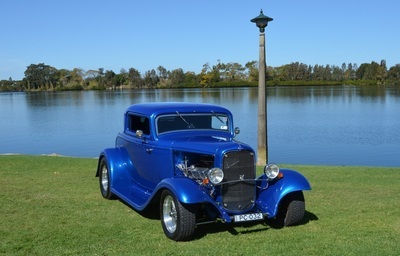 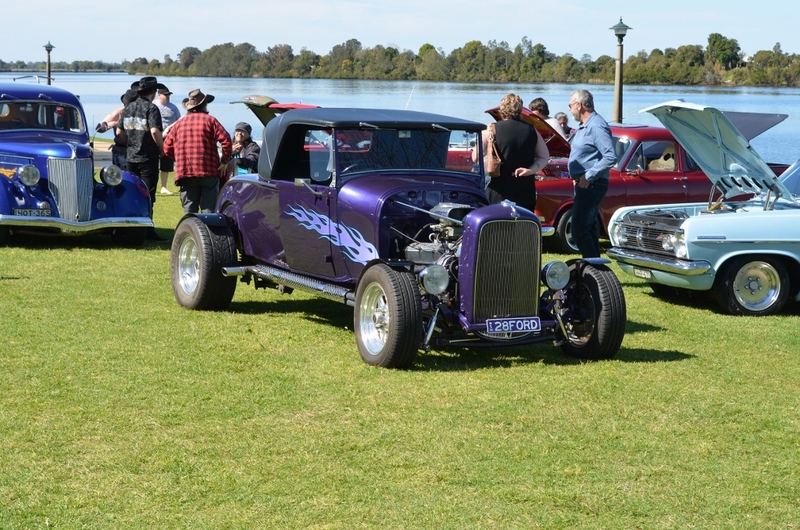 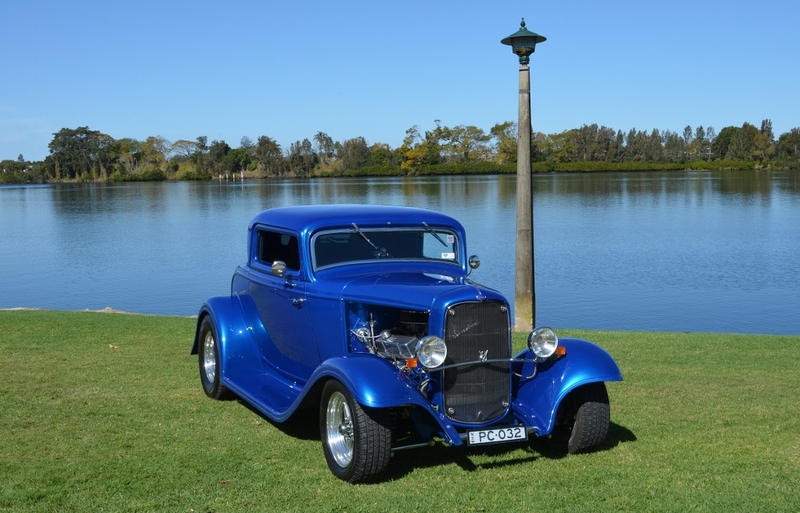 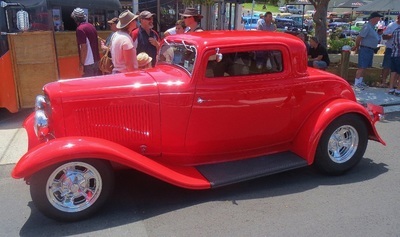 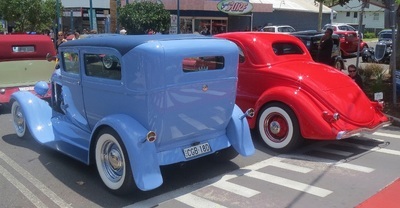 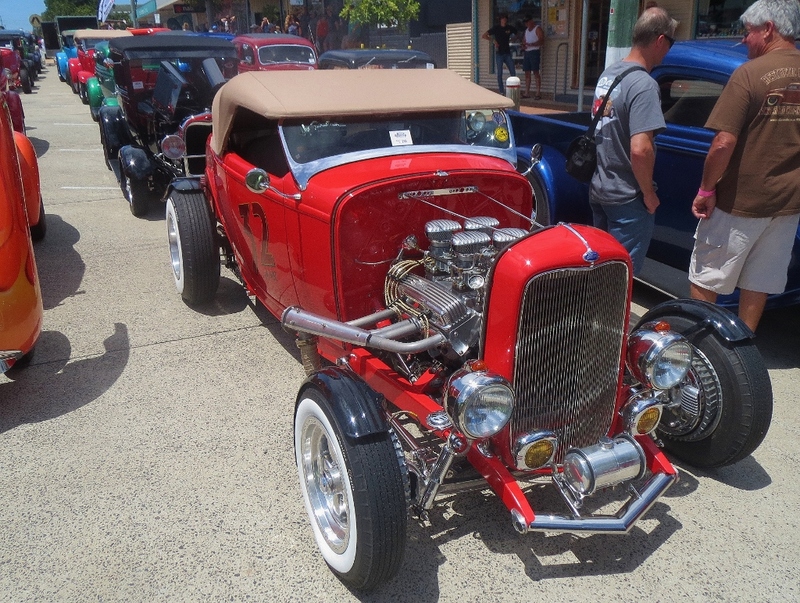 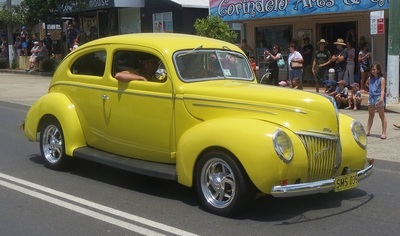 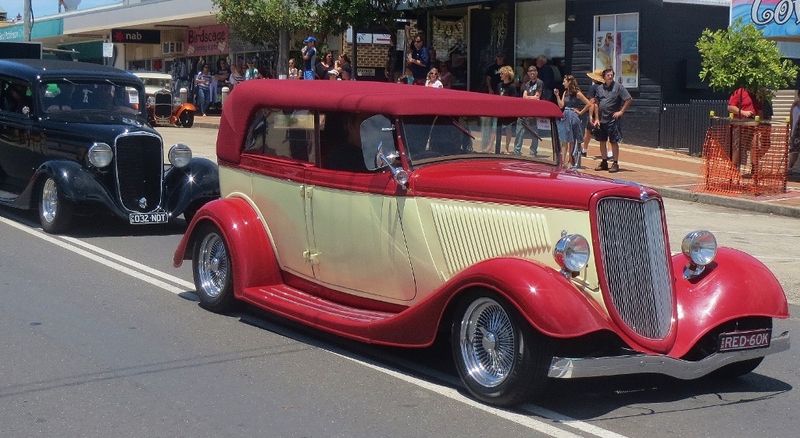 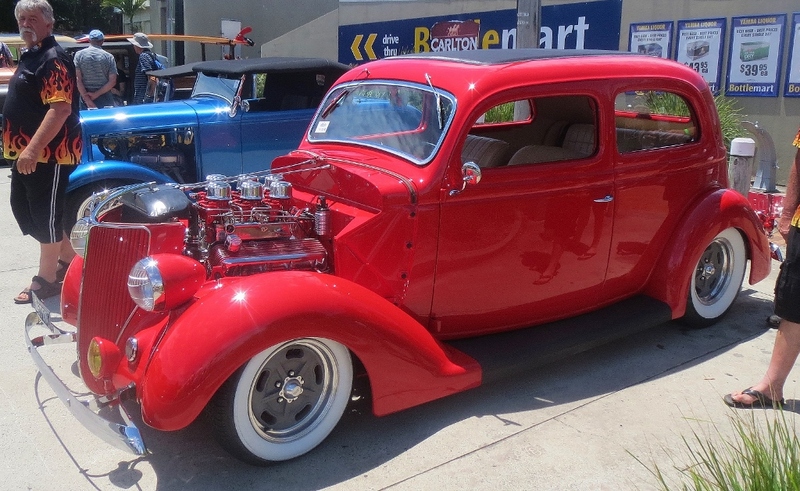 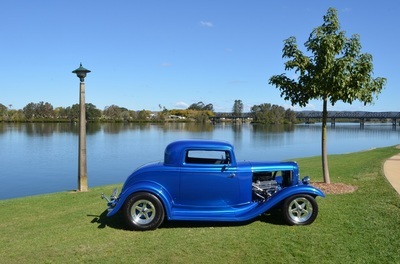 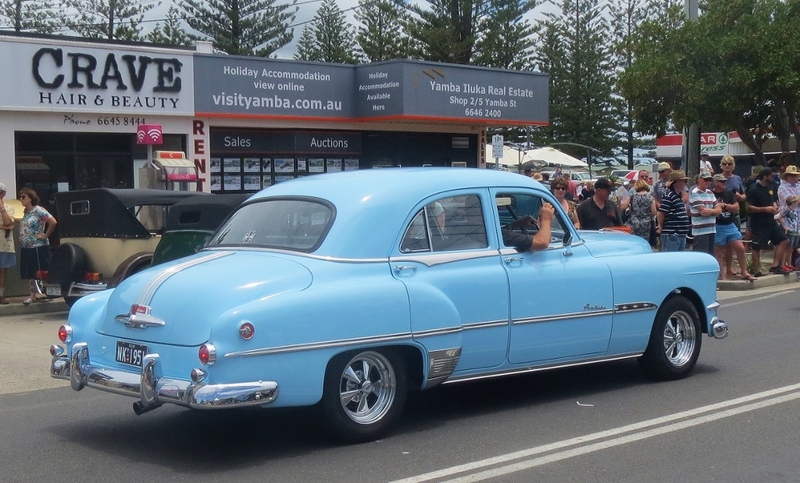 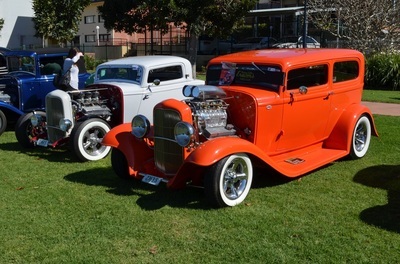 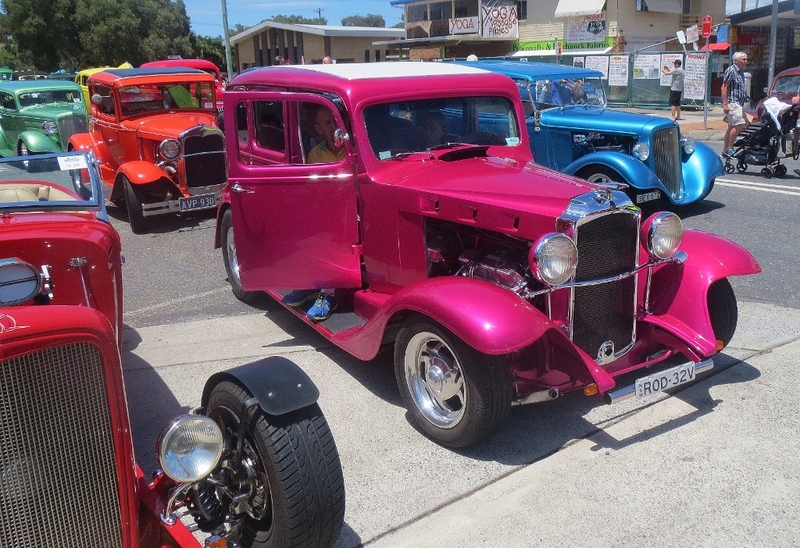 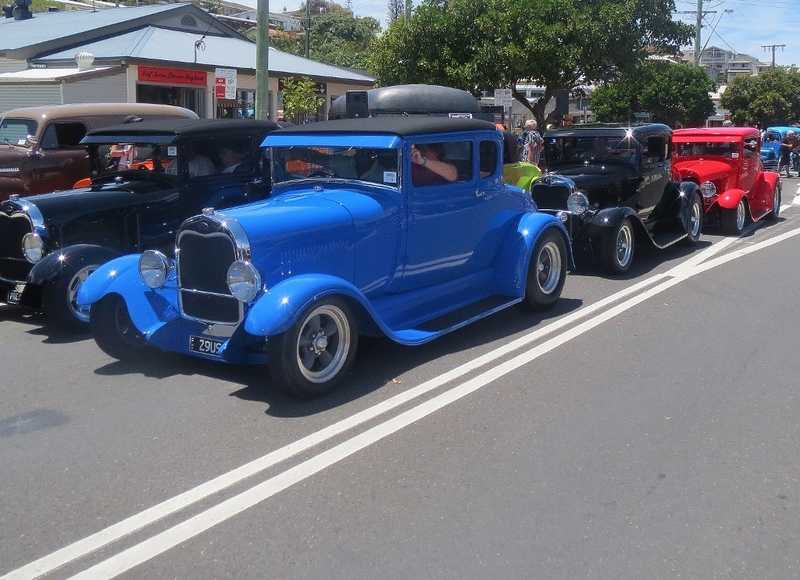 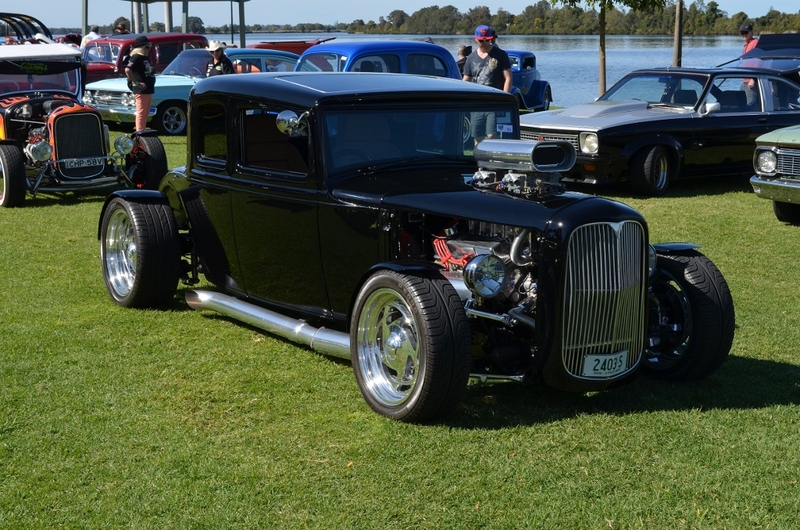 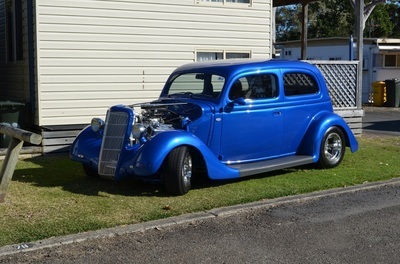 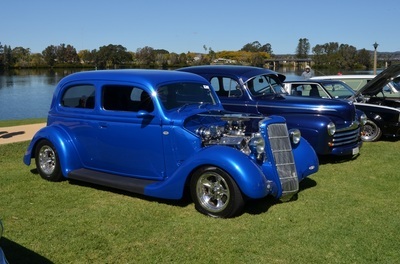 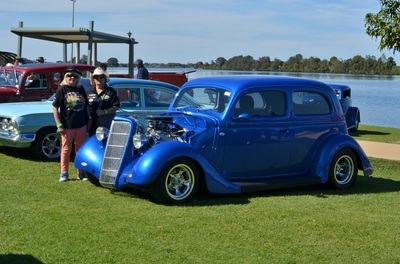 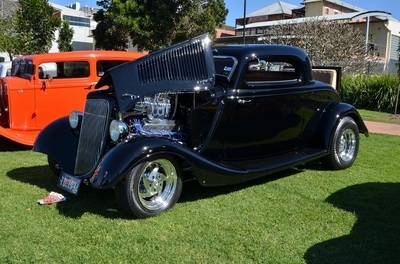 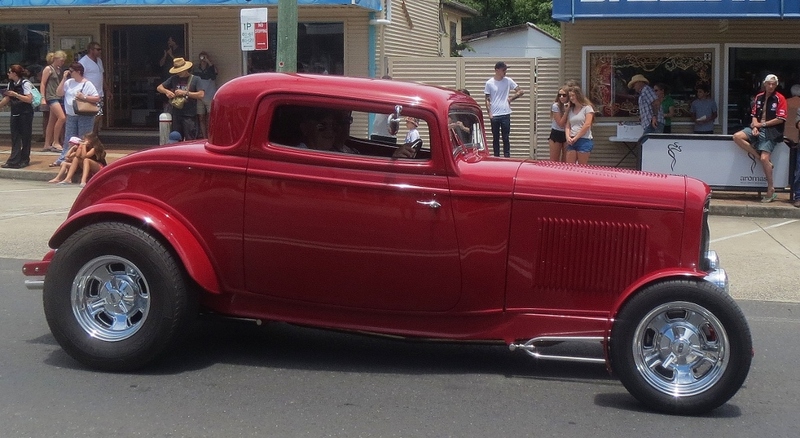 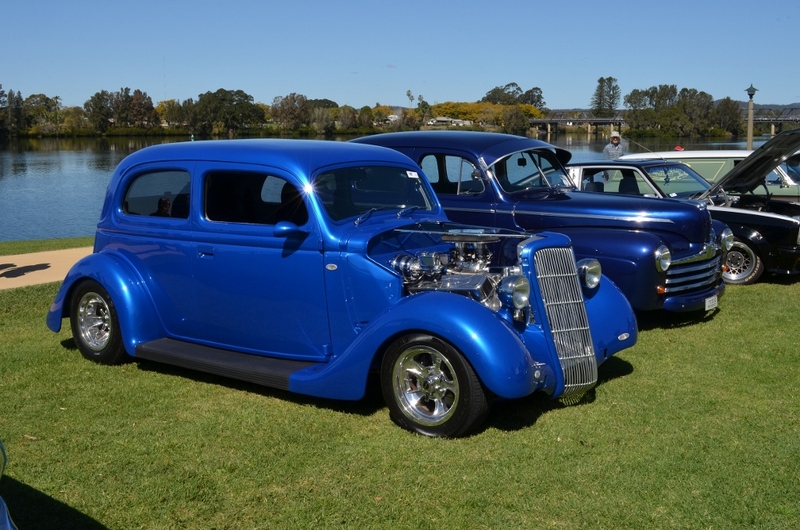 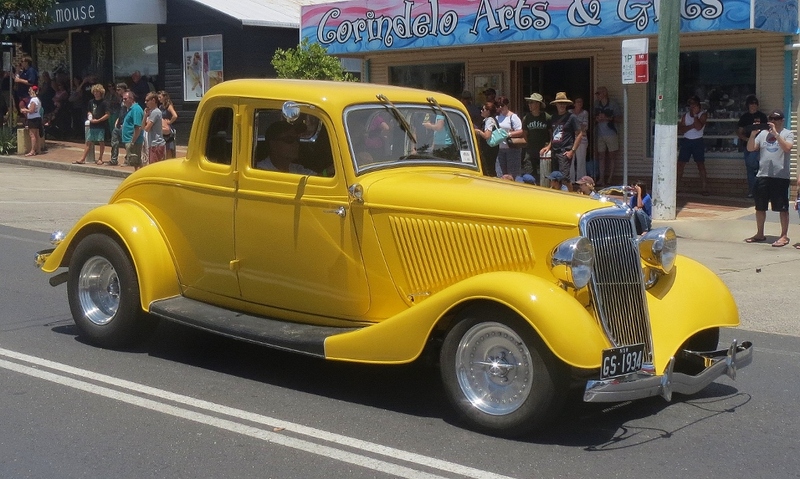 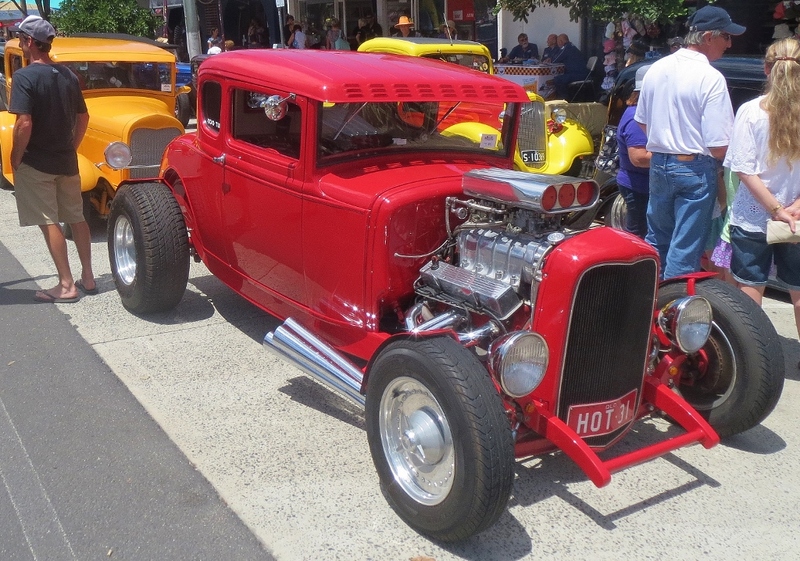 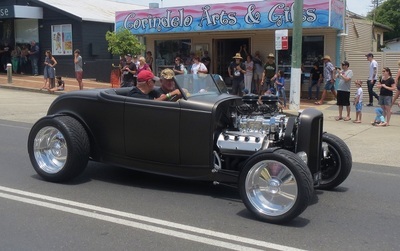 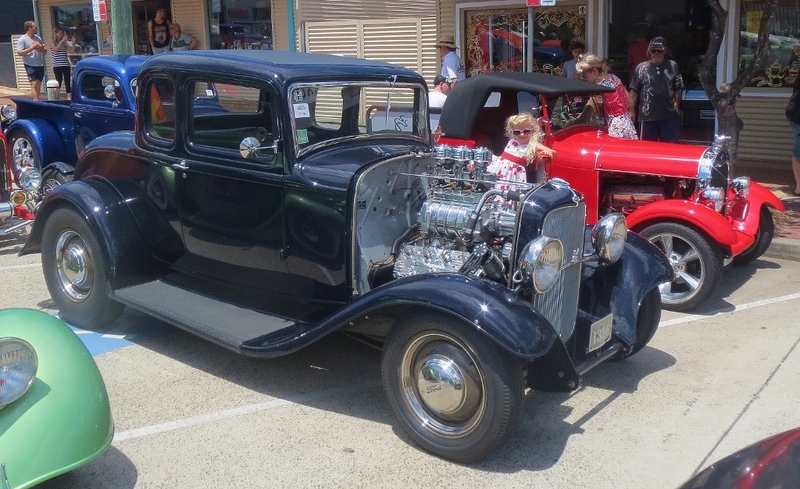 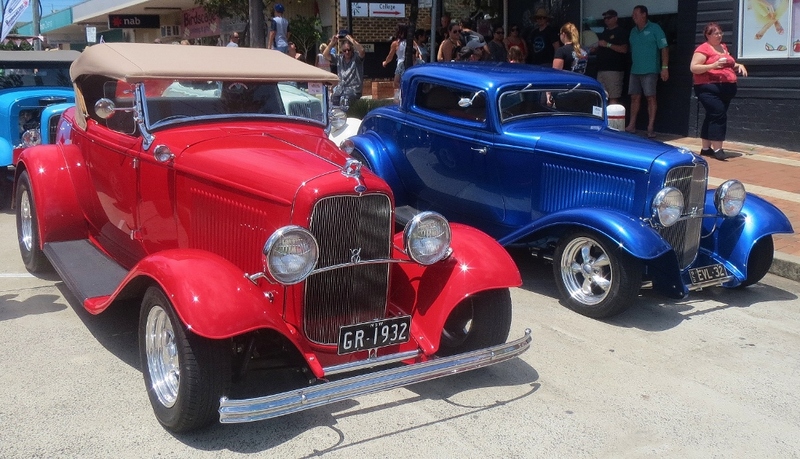 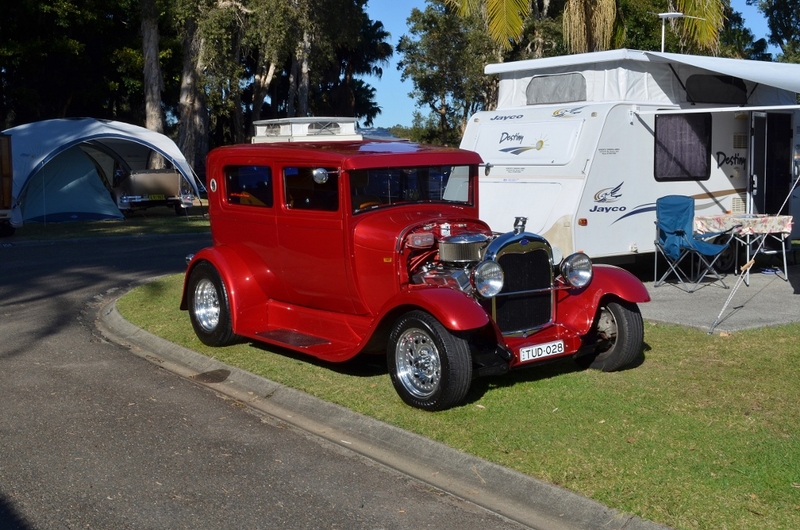 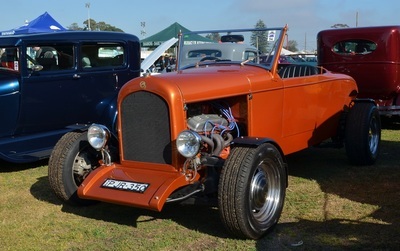 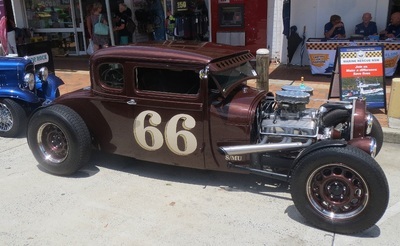 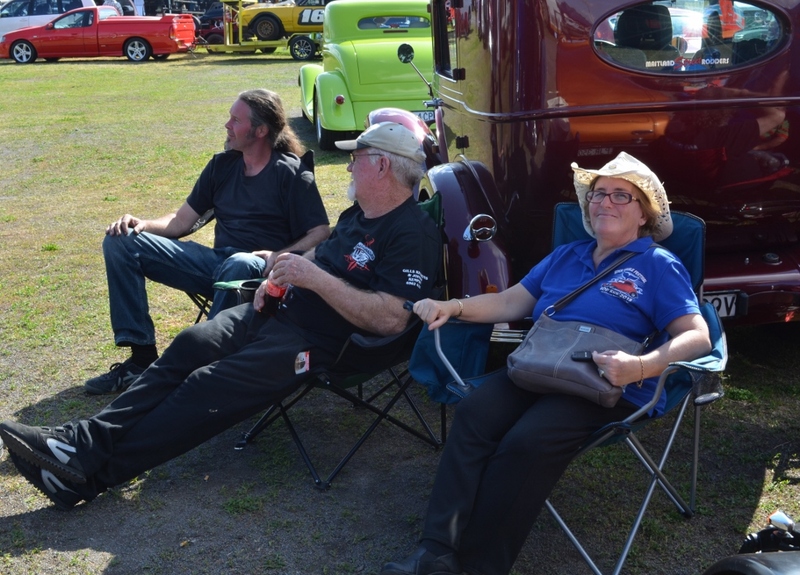 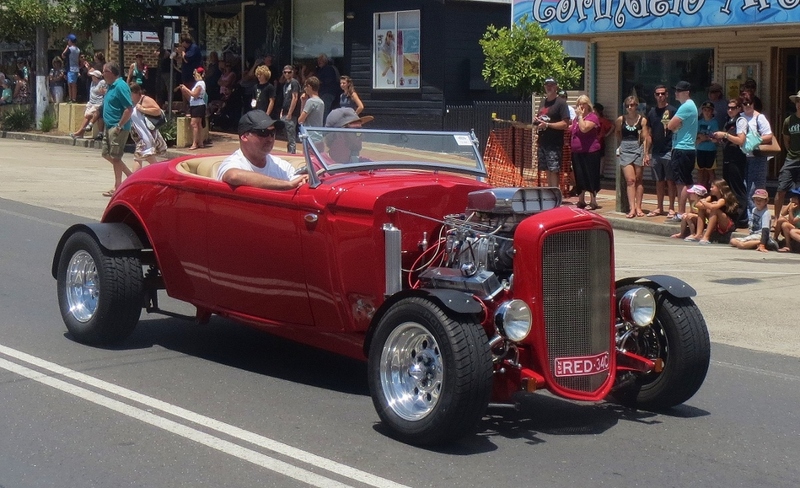 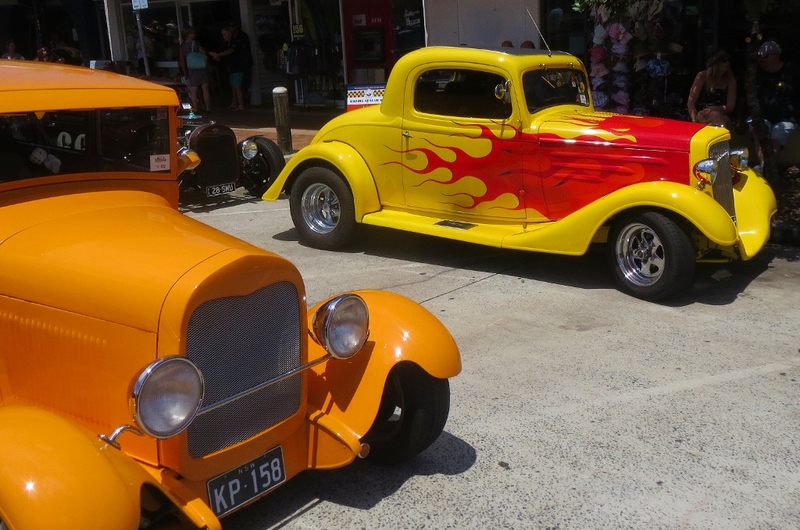 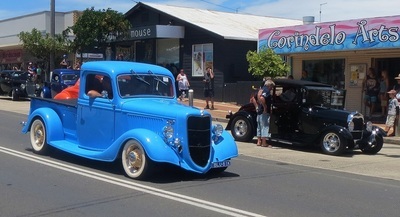 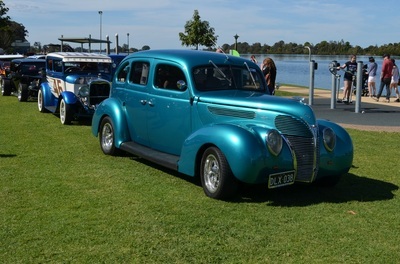 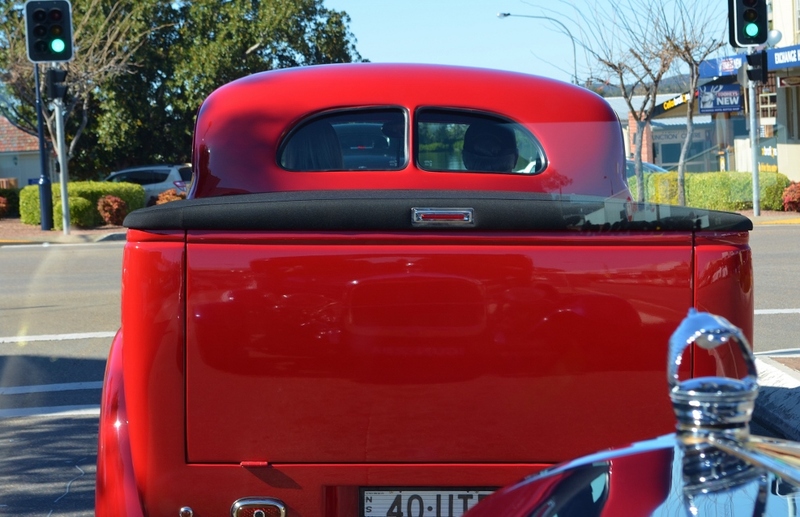 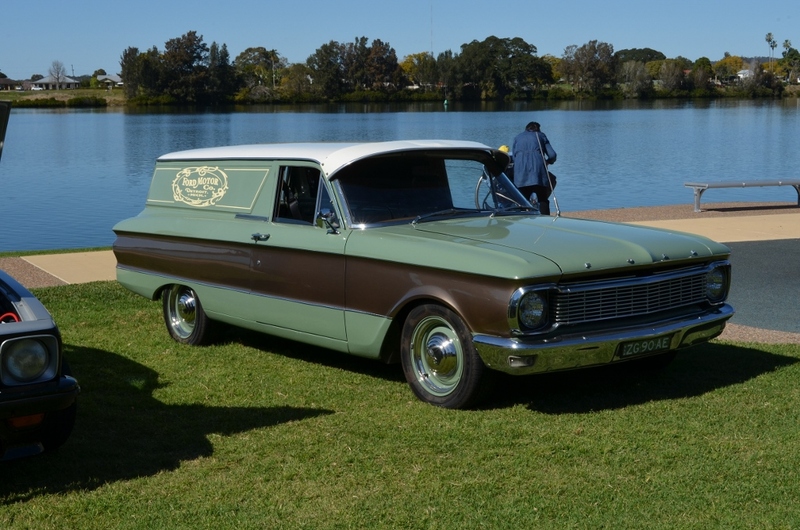 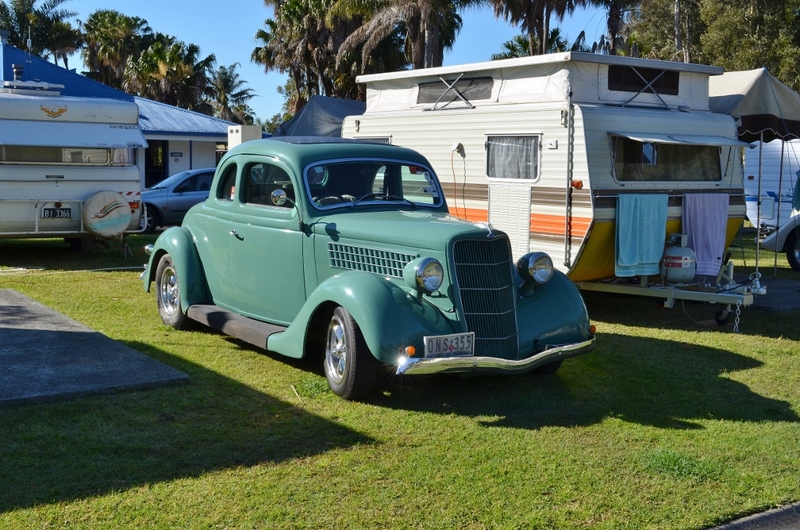 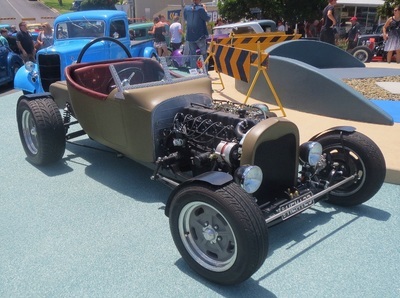 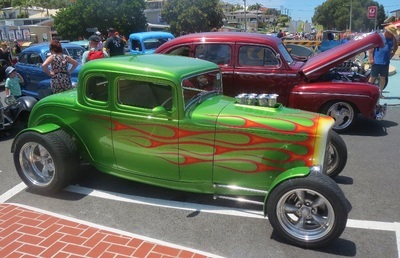 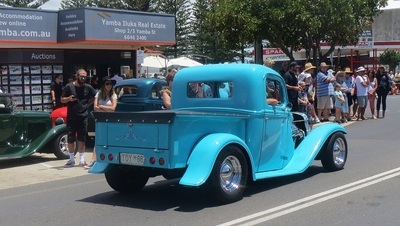 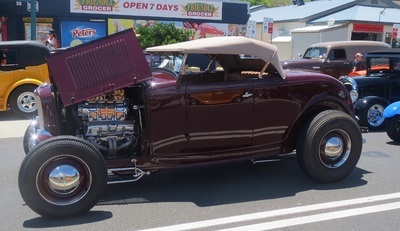 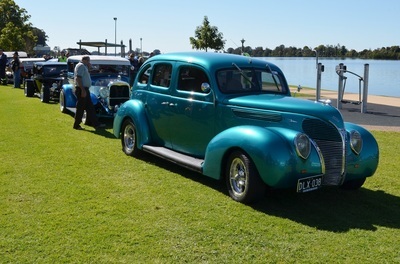 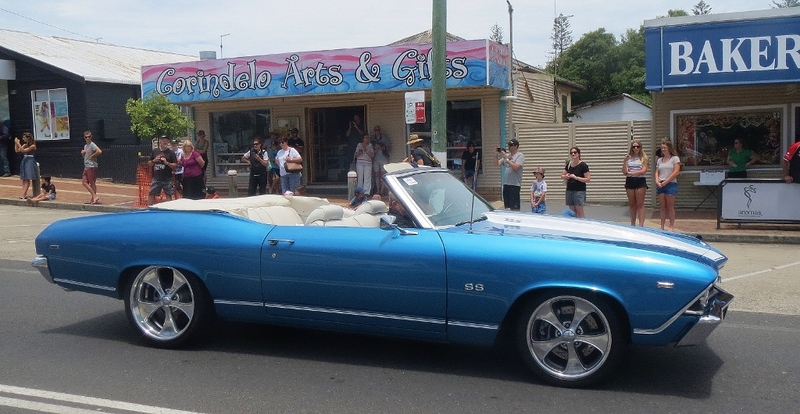 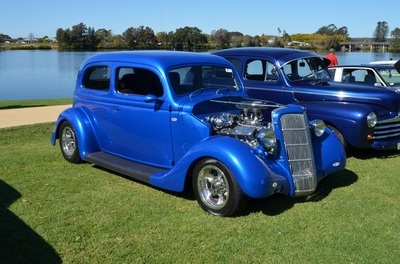 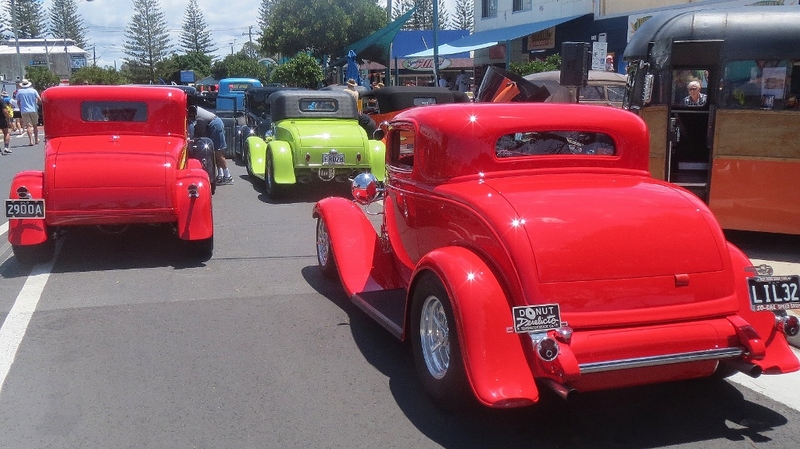 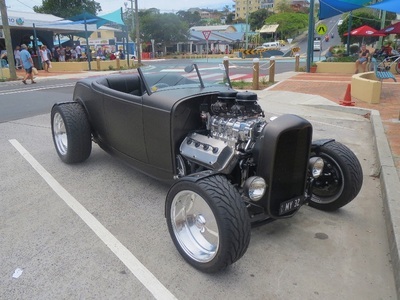 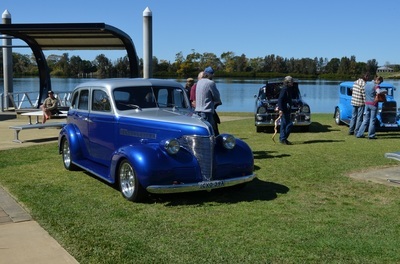 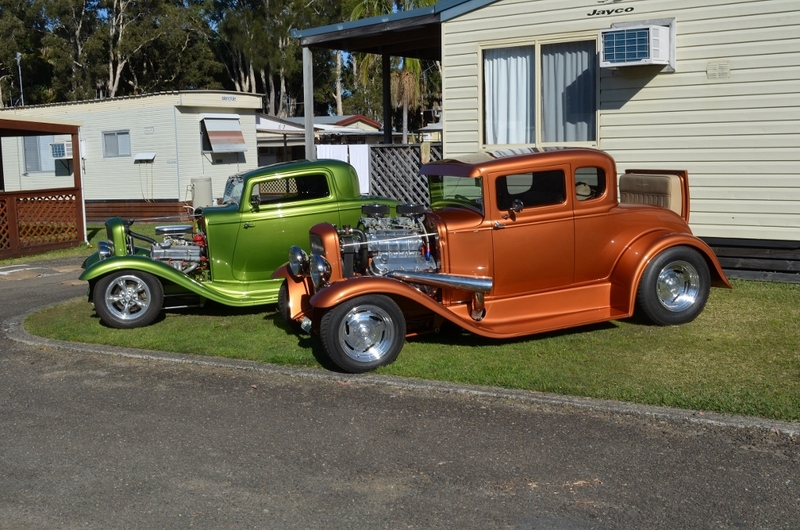 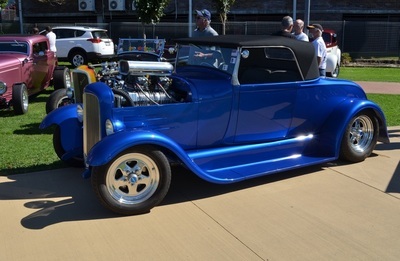 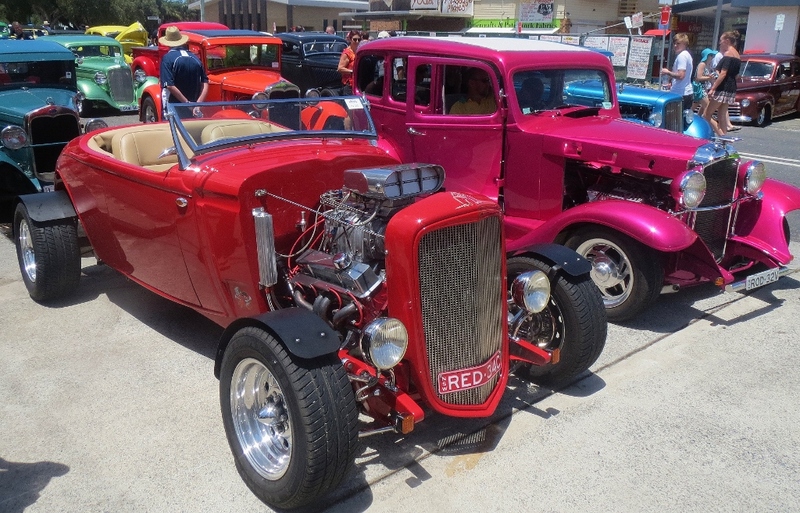 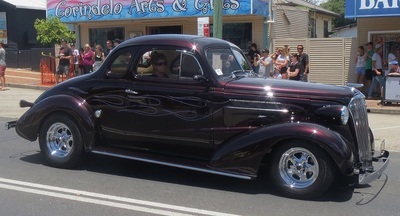 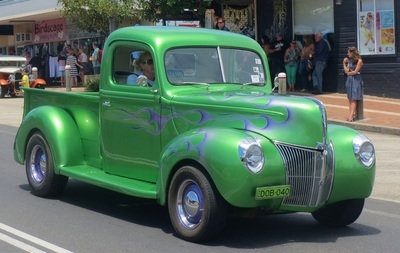 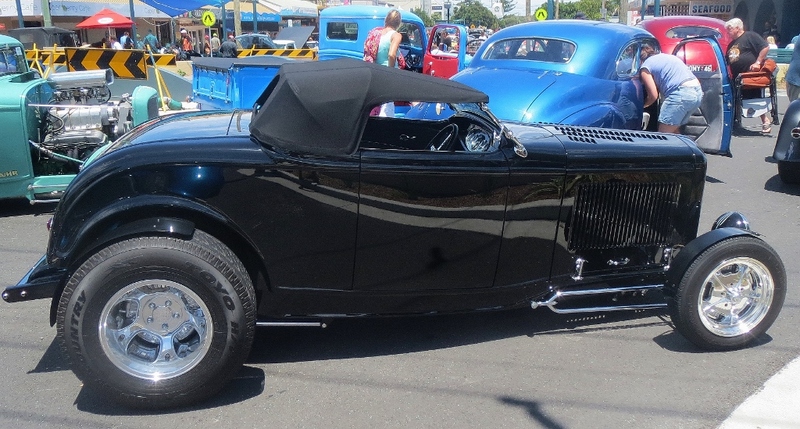 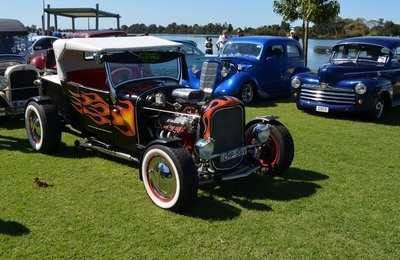 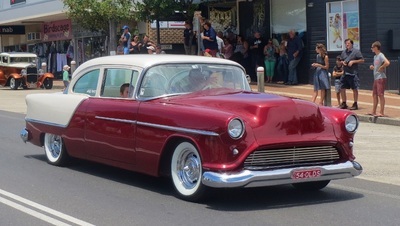 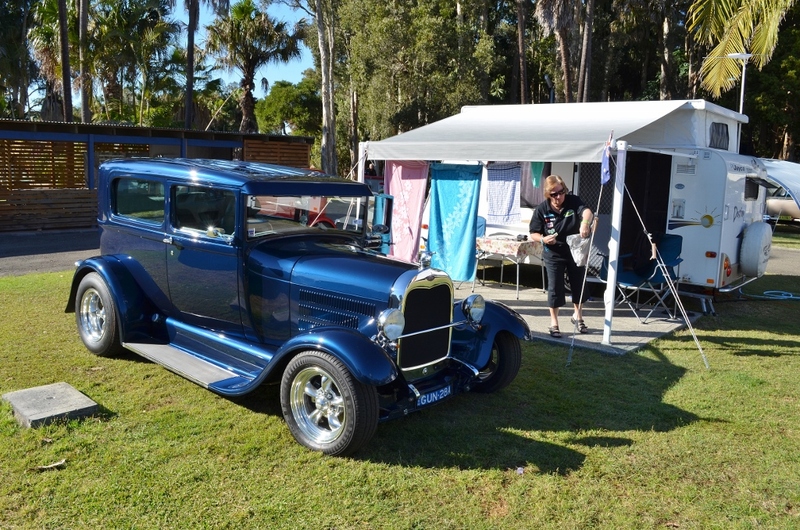 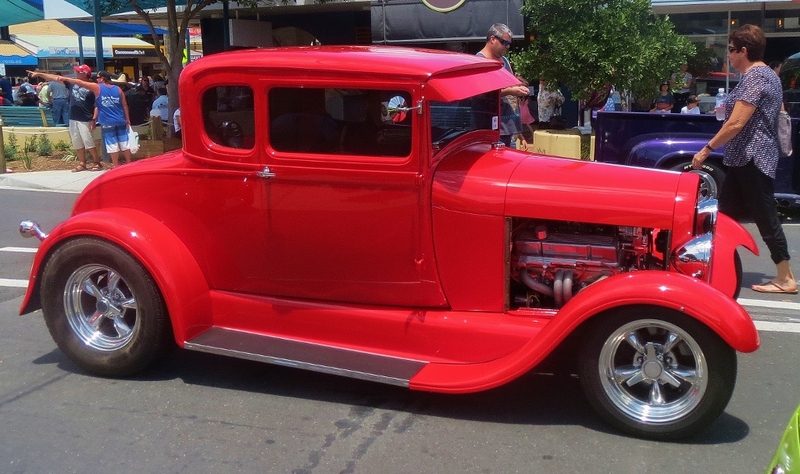 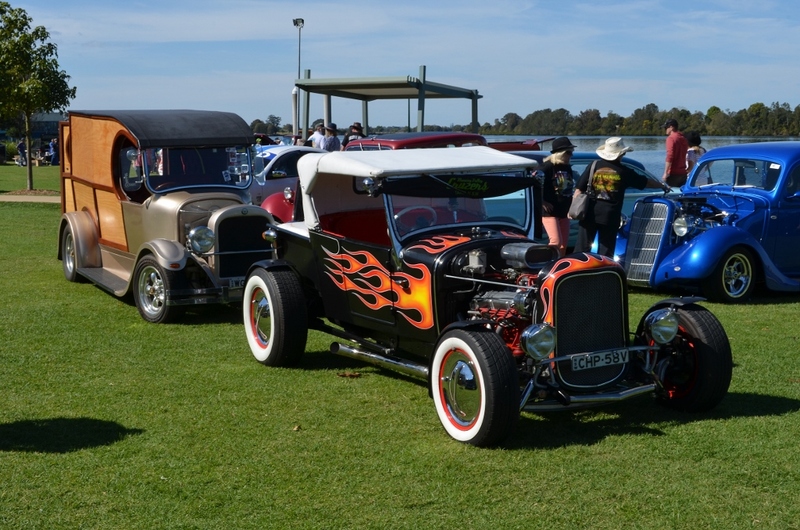 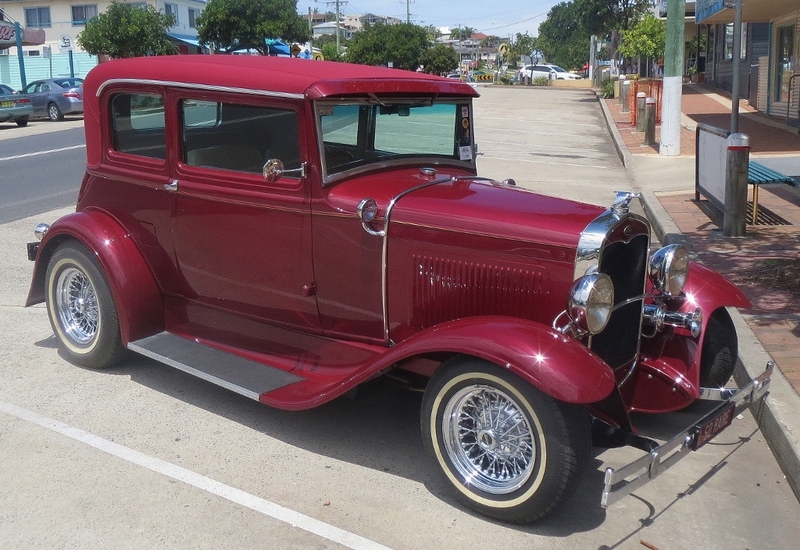 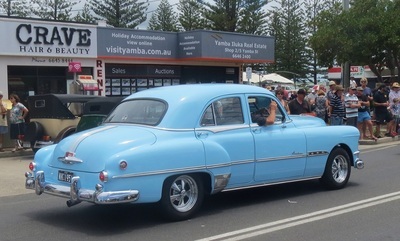 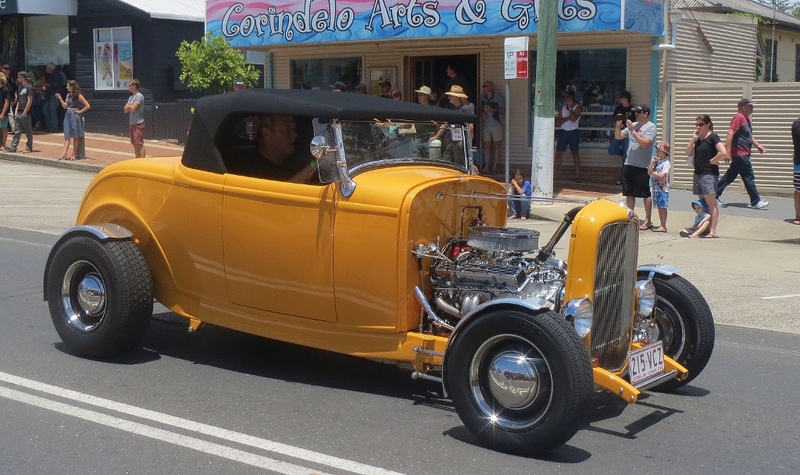 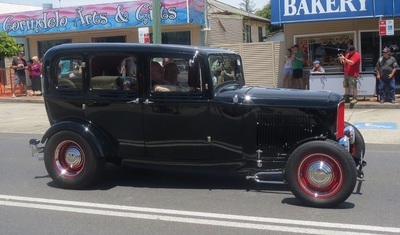 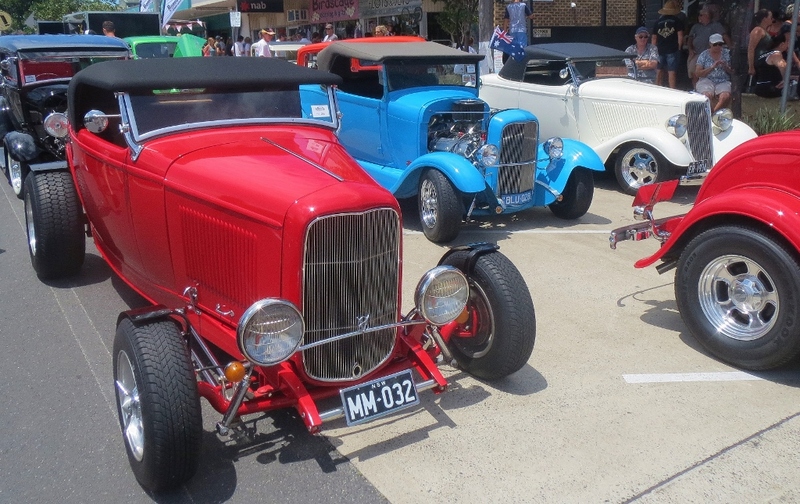 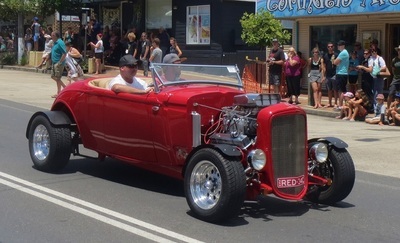 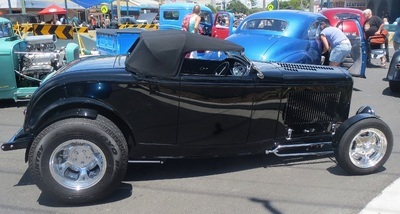 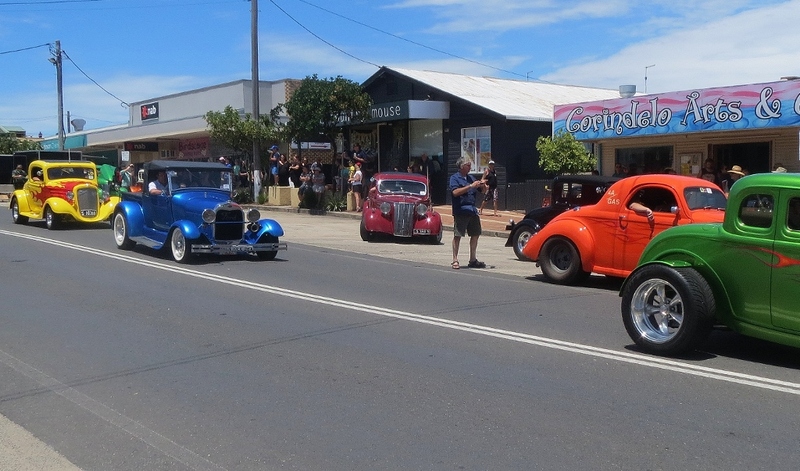 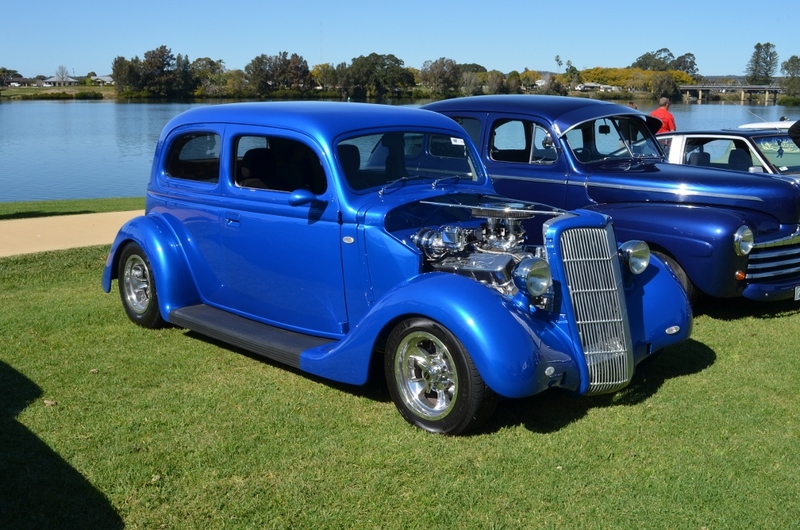 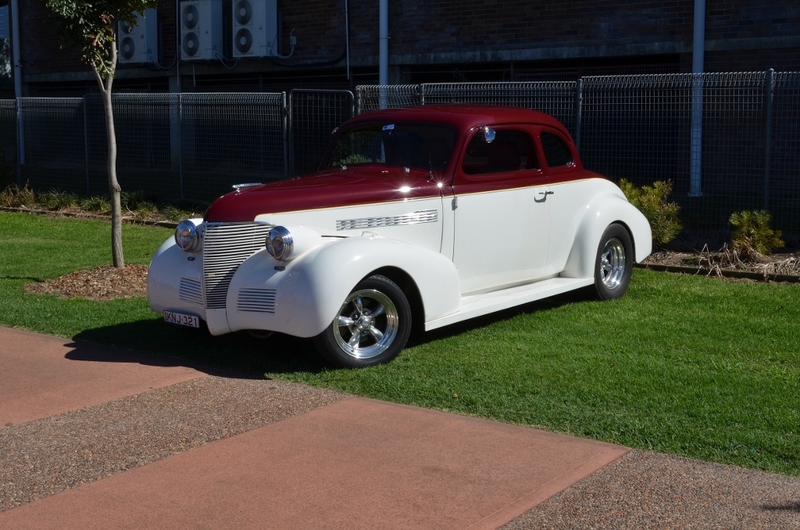 Ian and Lorraine were up north in November and called in on the Yamba Rod Run taking a few pictures of the event. 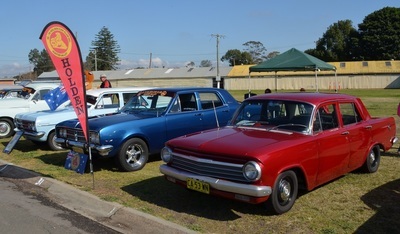 It is a very big weekend for rodders attracting good numbers and is also well supported by the local community.